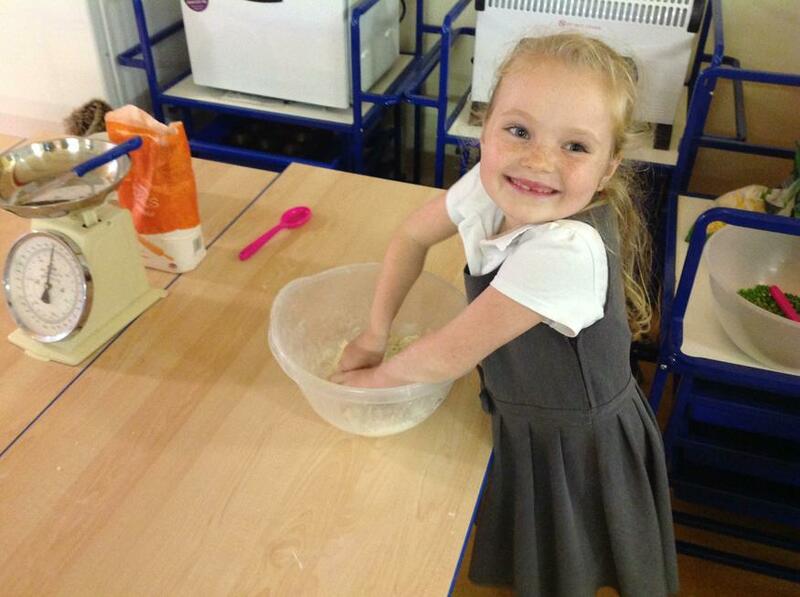 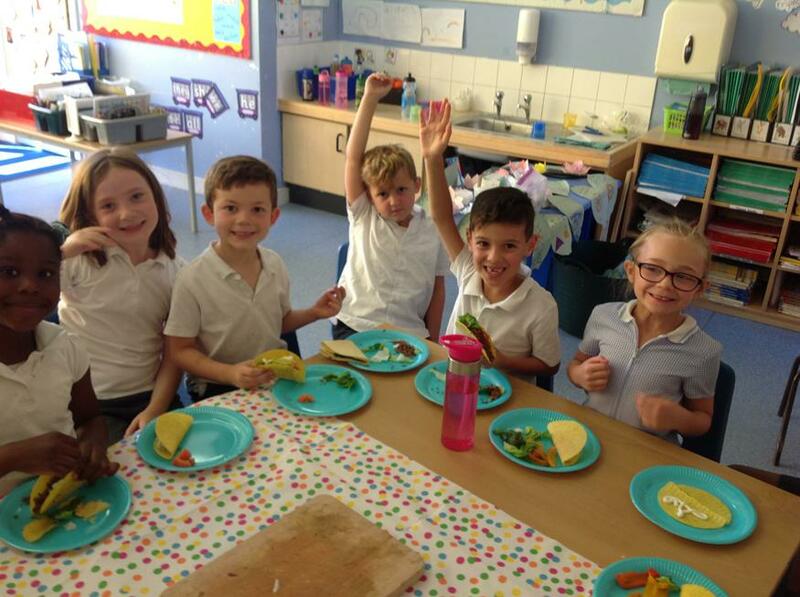 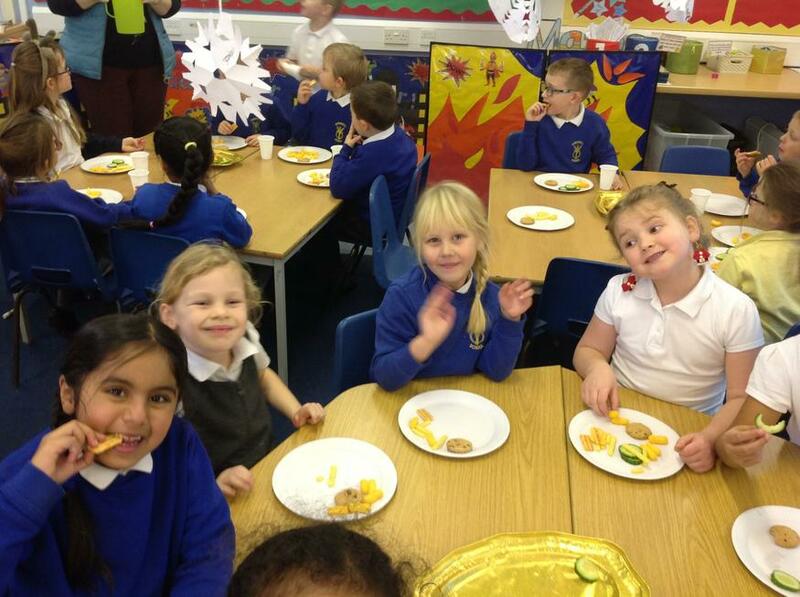 Welcome to the Yellow Class page of our school website! 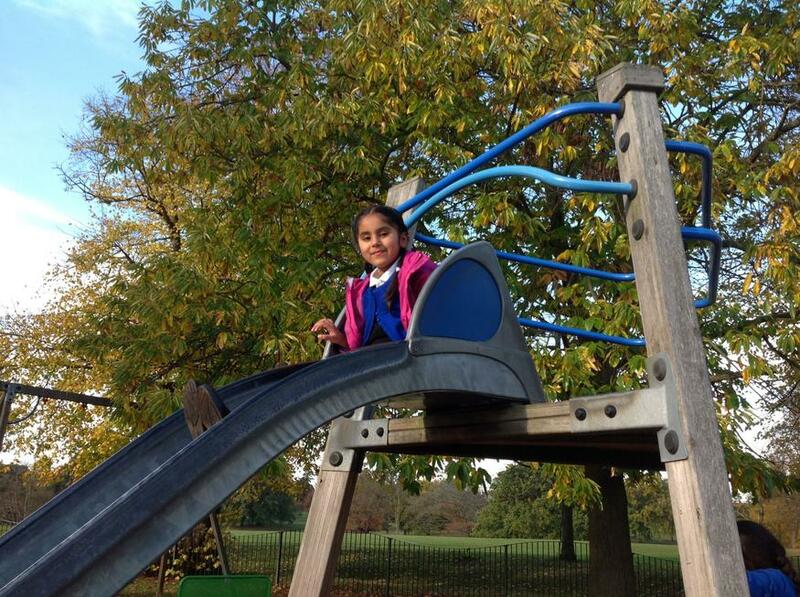 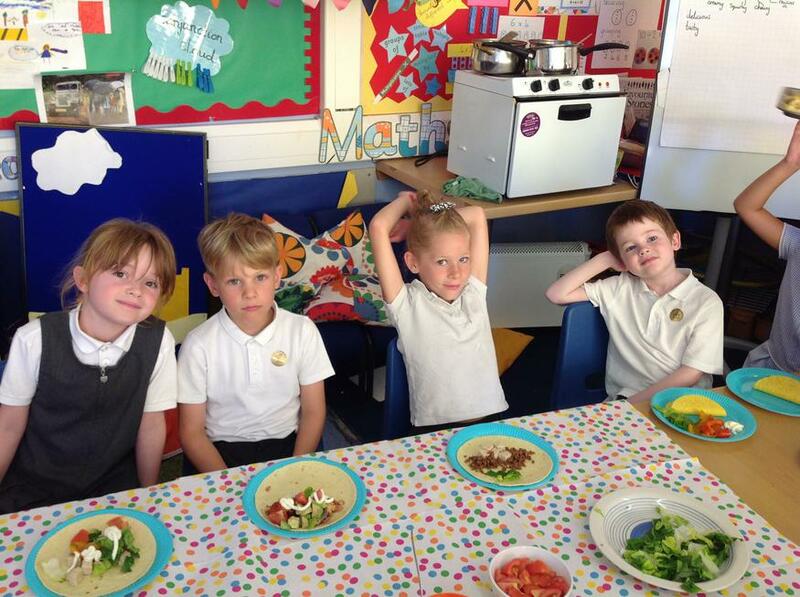 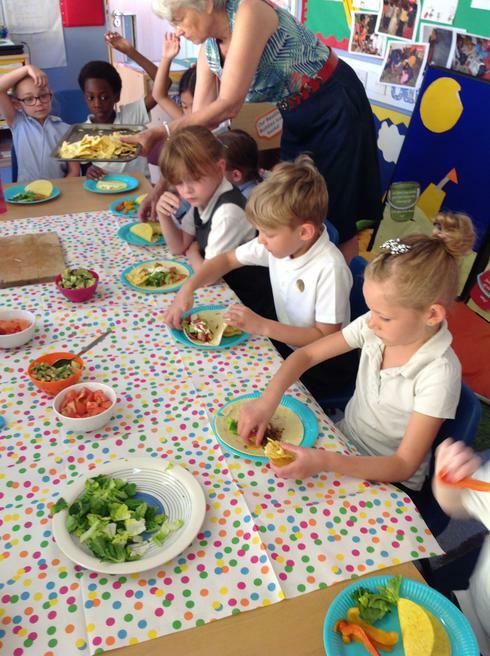 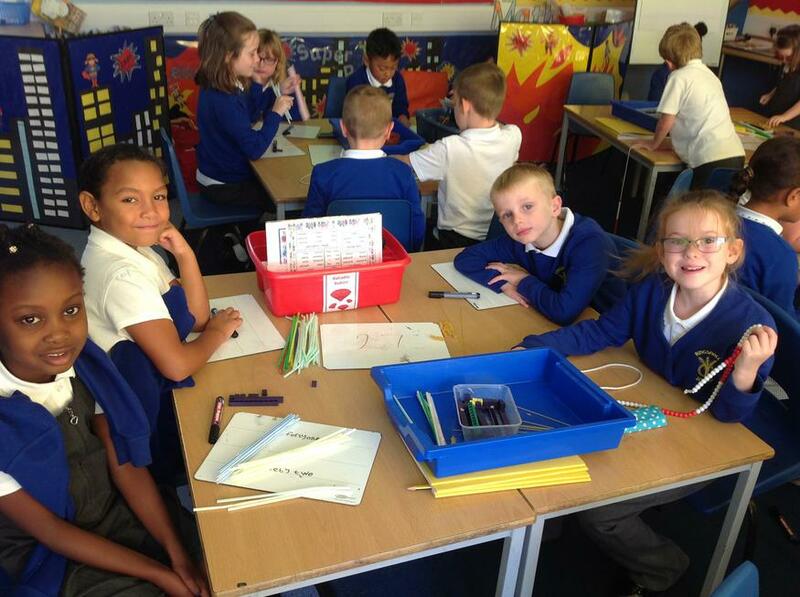 The website will be used to keep you up to date with what is going on in Year 2. 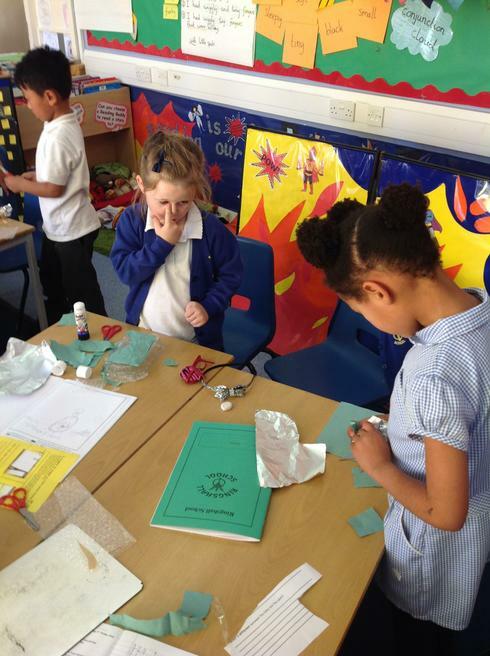 On this page you will be able to find weekly learning overviews, updates and pictures of what we have been doing in class and other useful information. 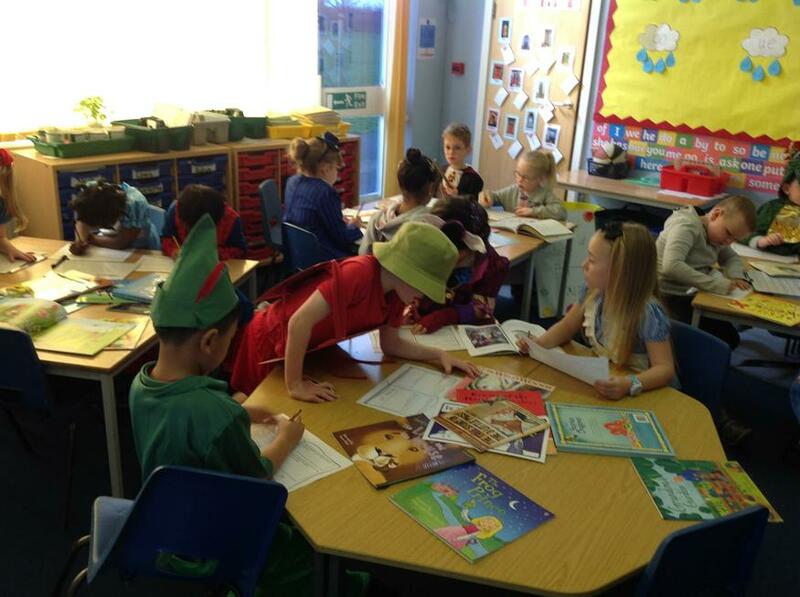 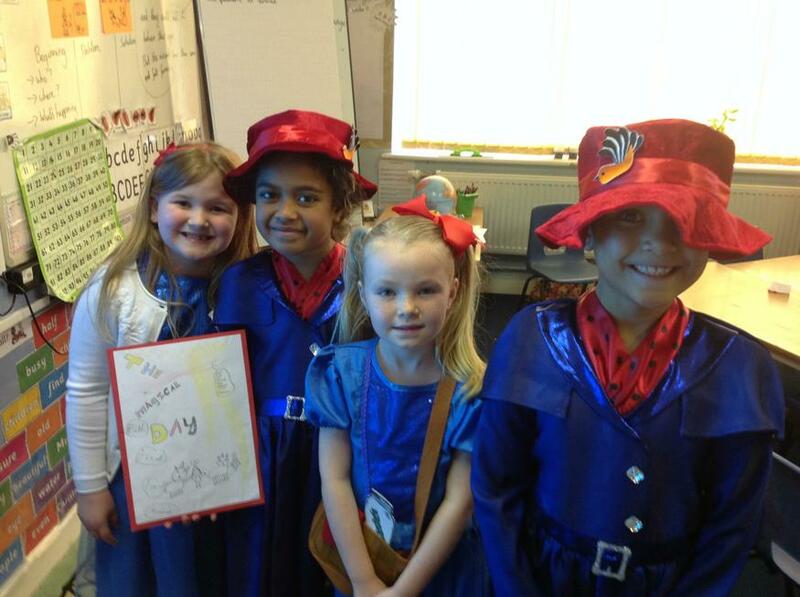 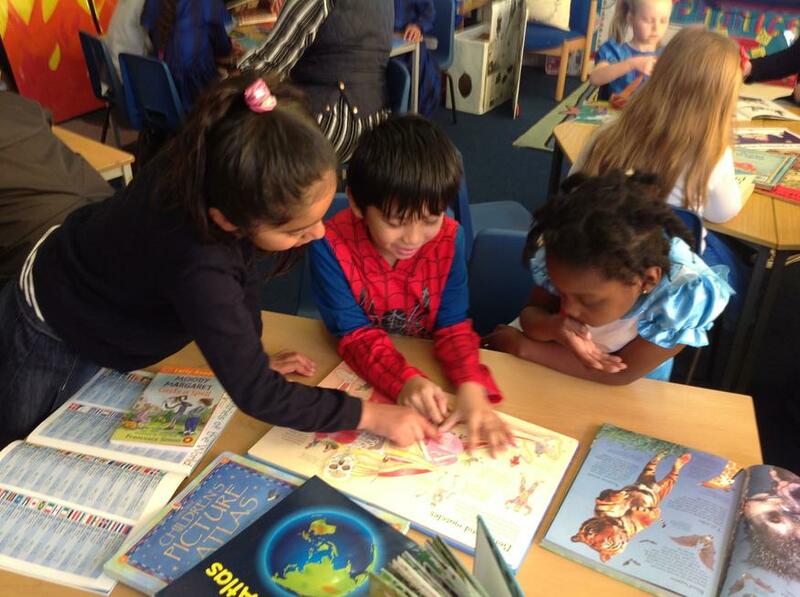 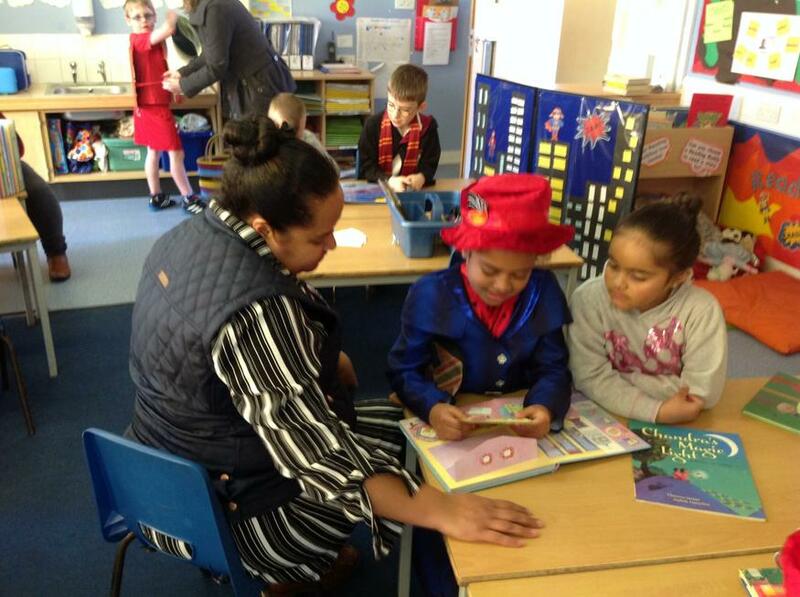 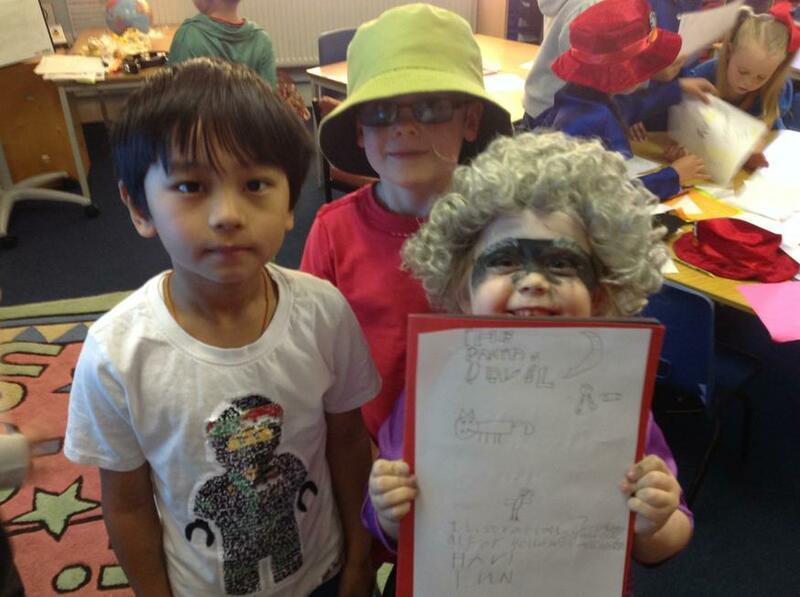 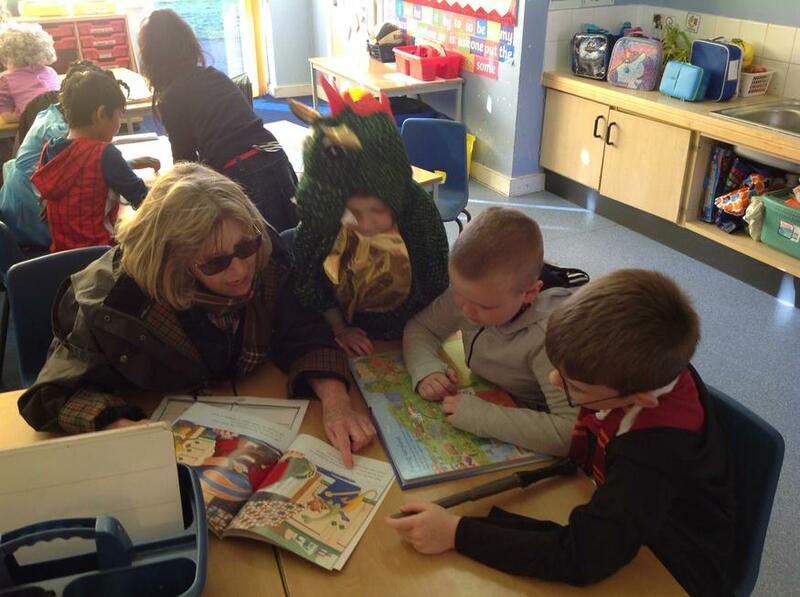 Yellow Class have really enjoyed celebrating book week! 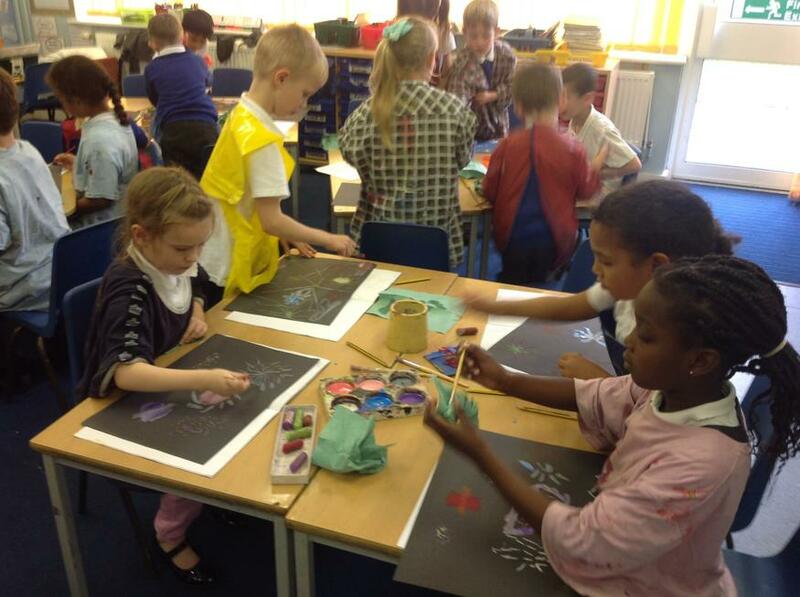 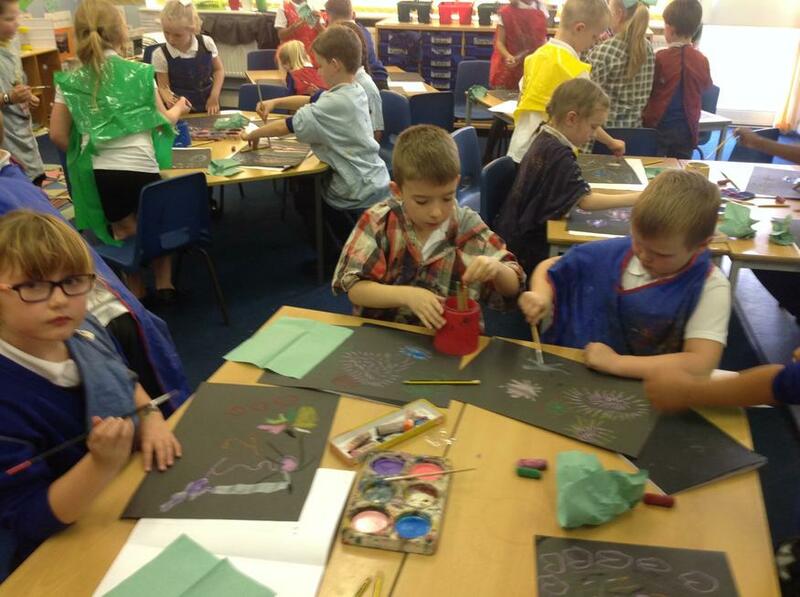 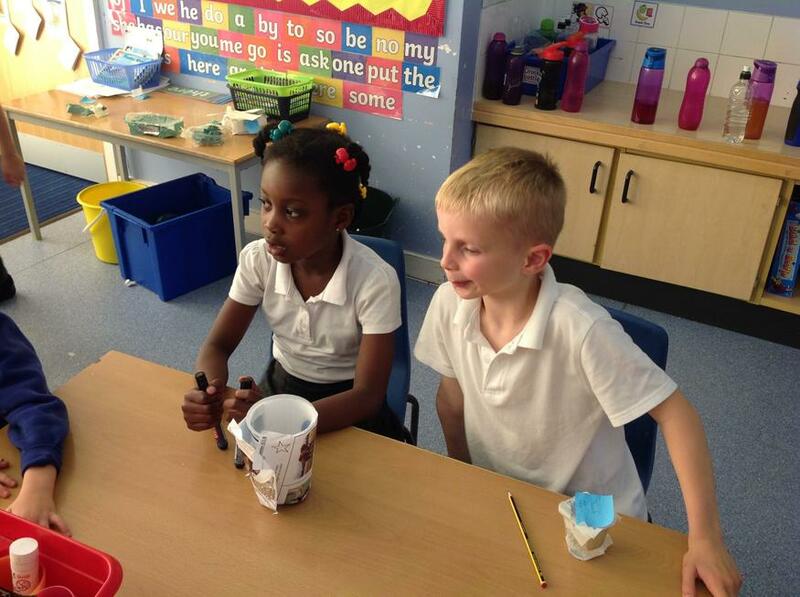 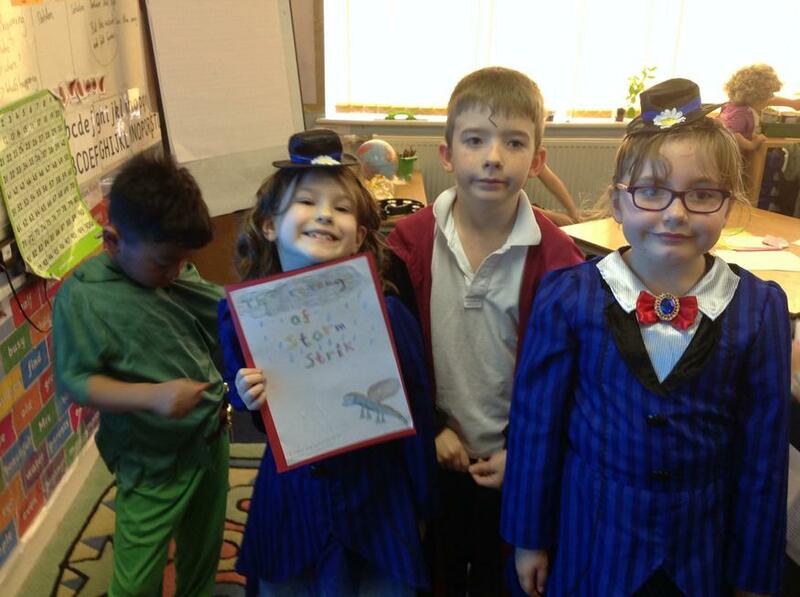 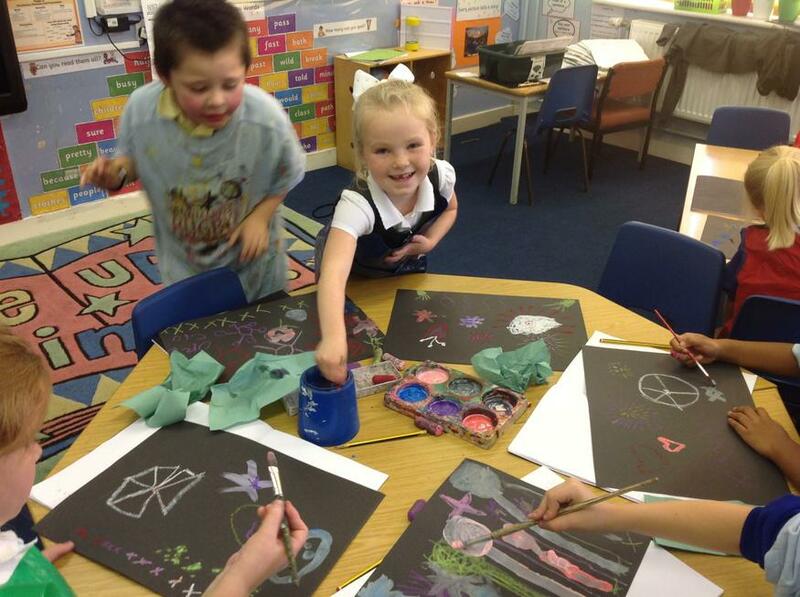 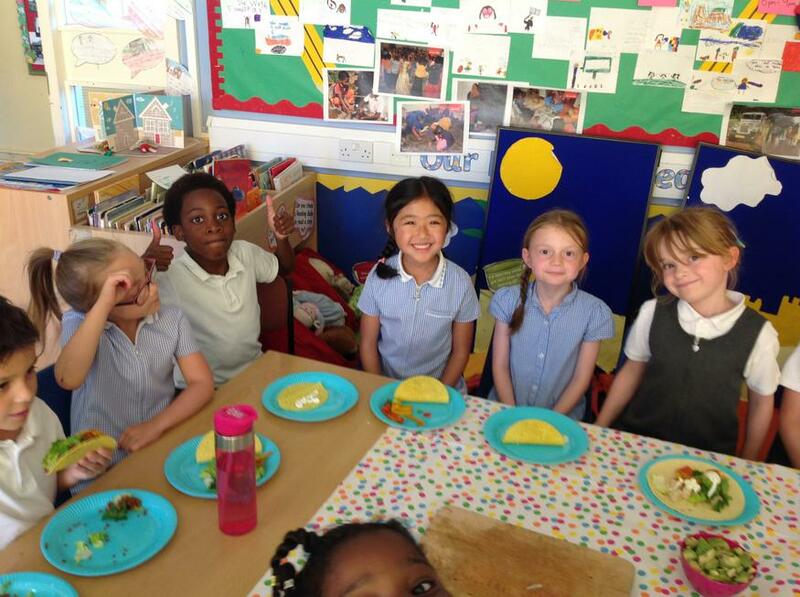 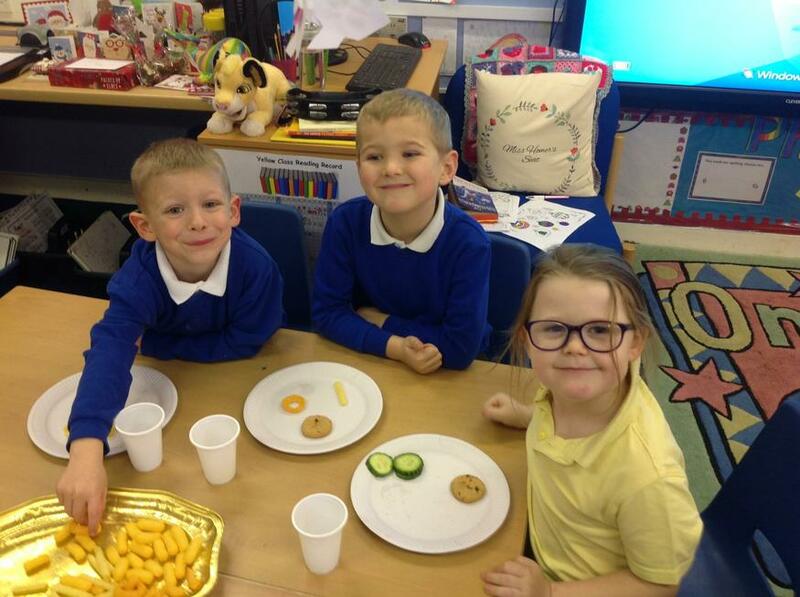 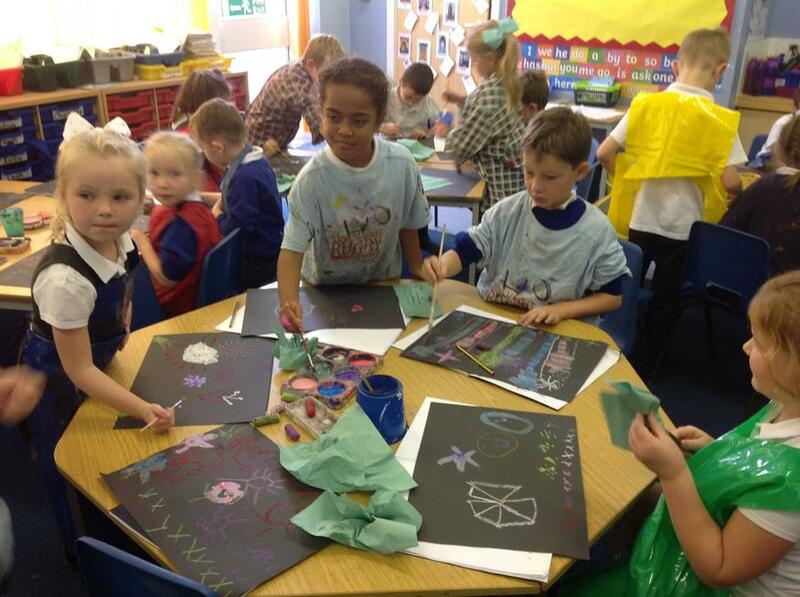 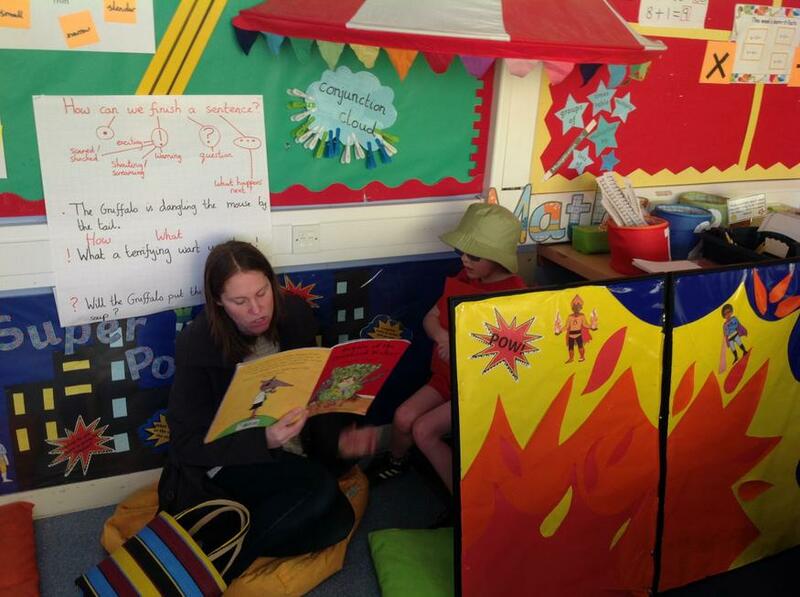 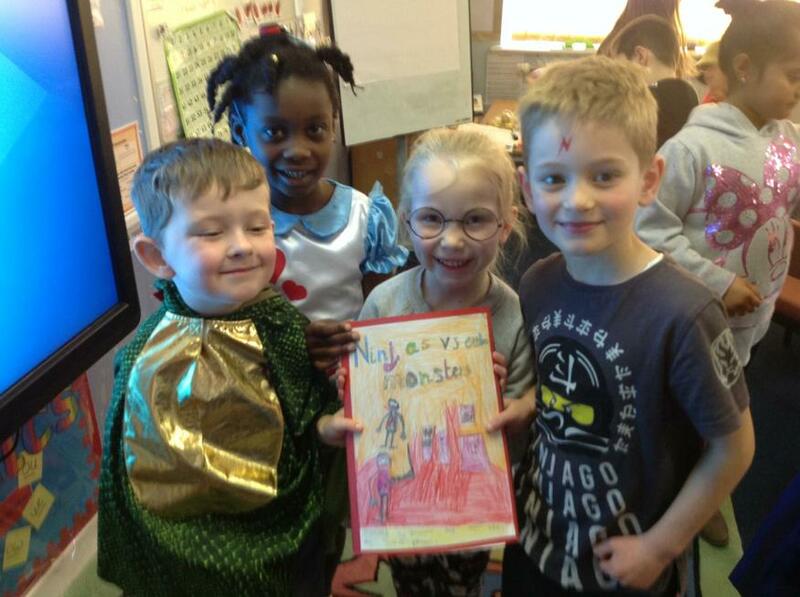 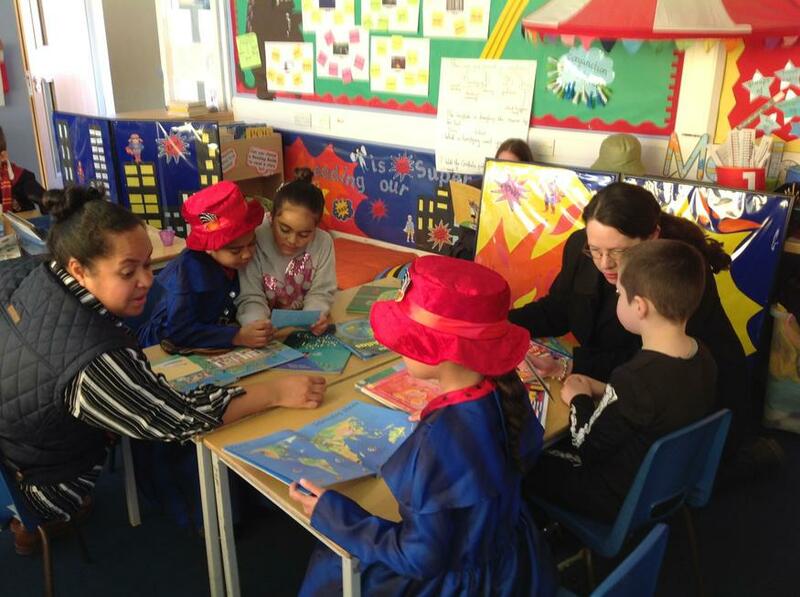 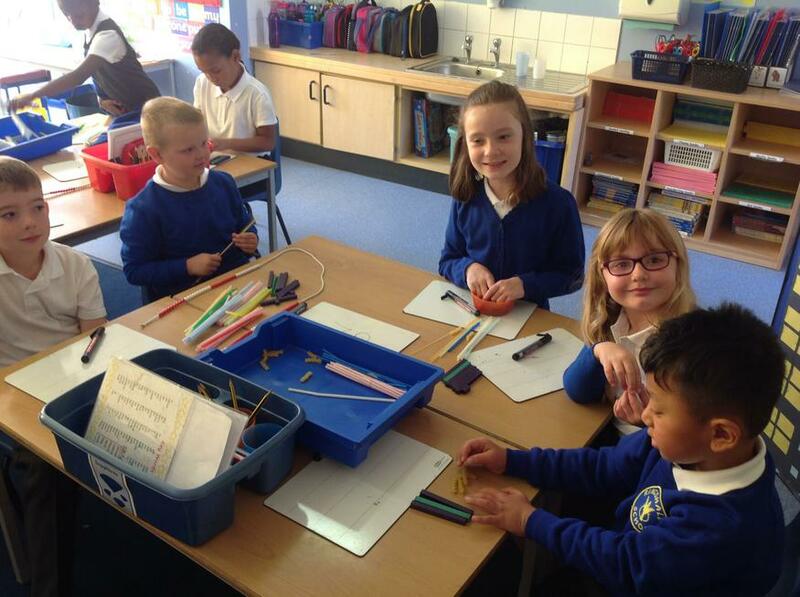 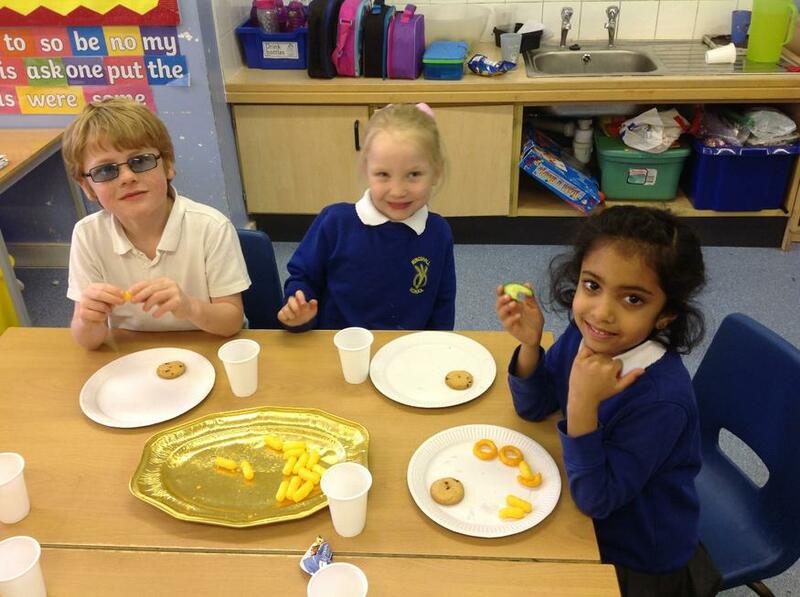 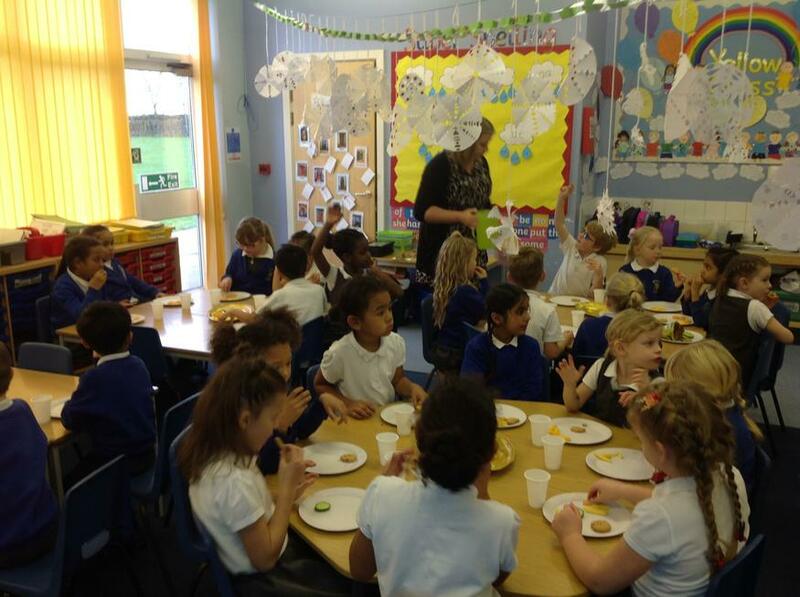 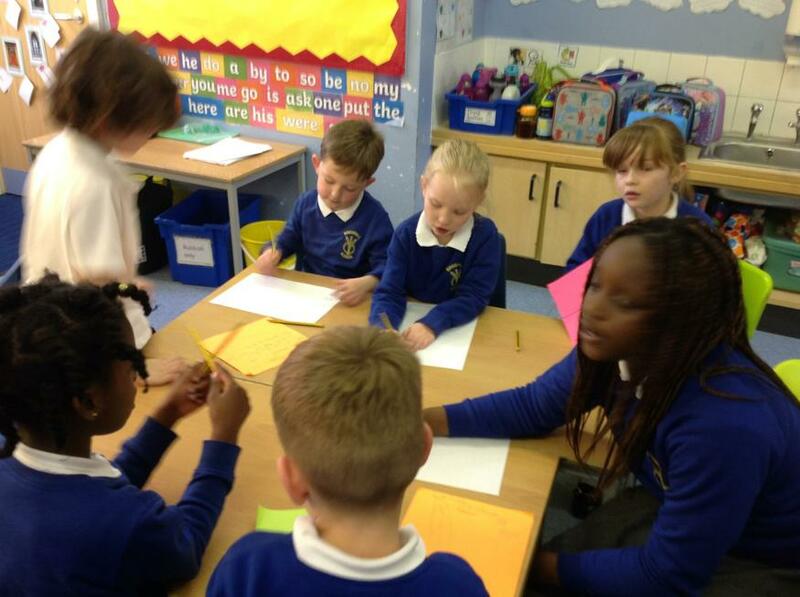 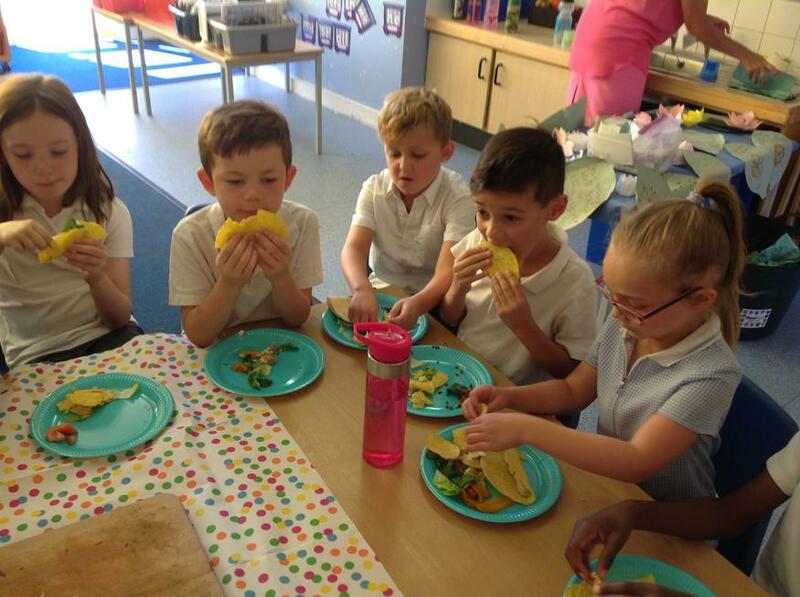 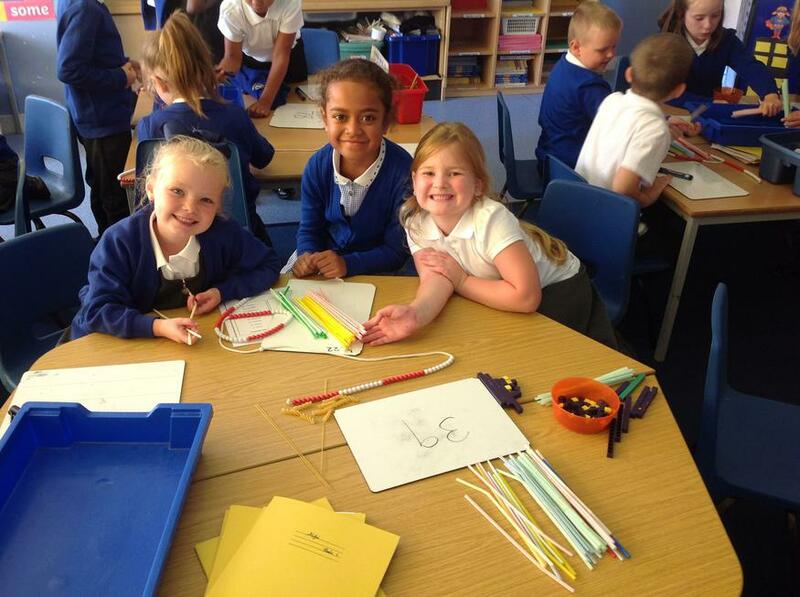 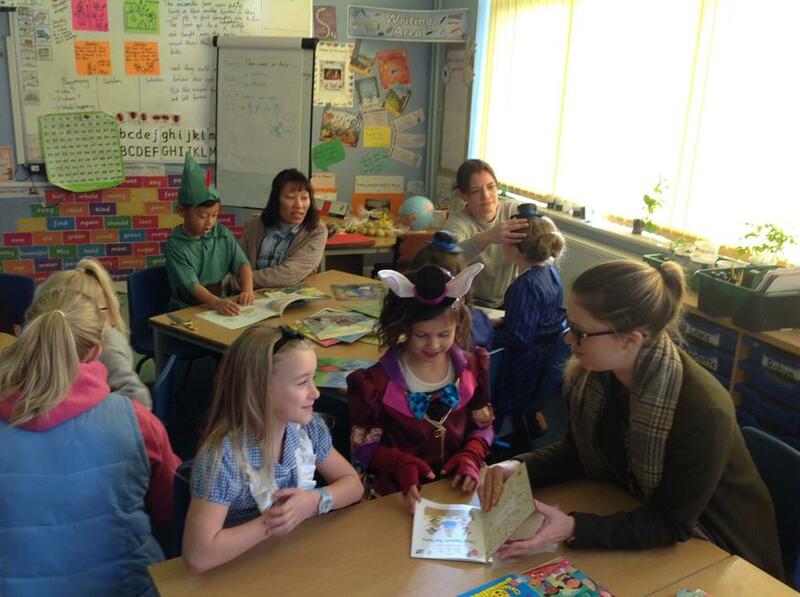 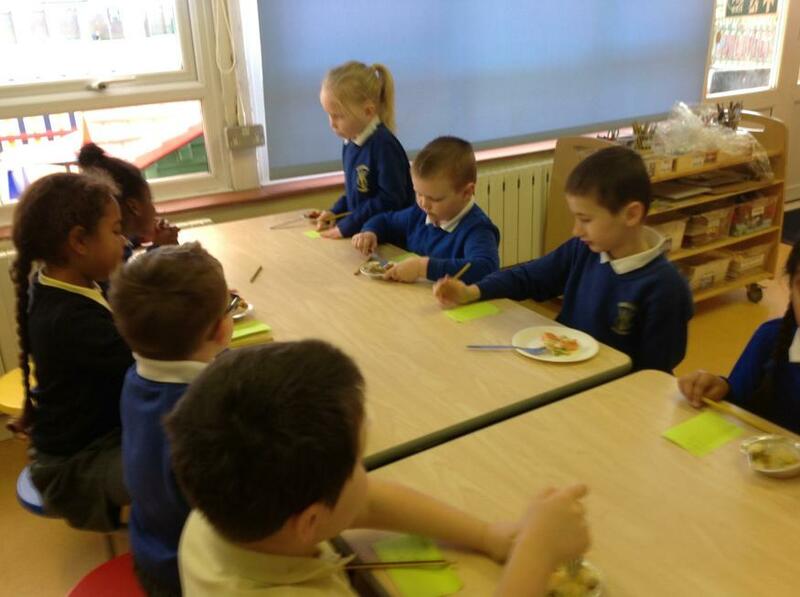 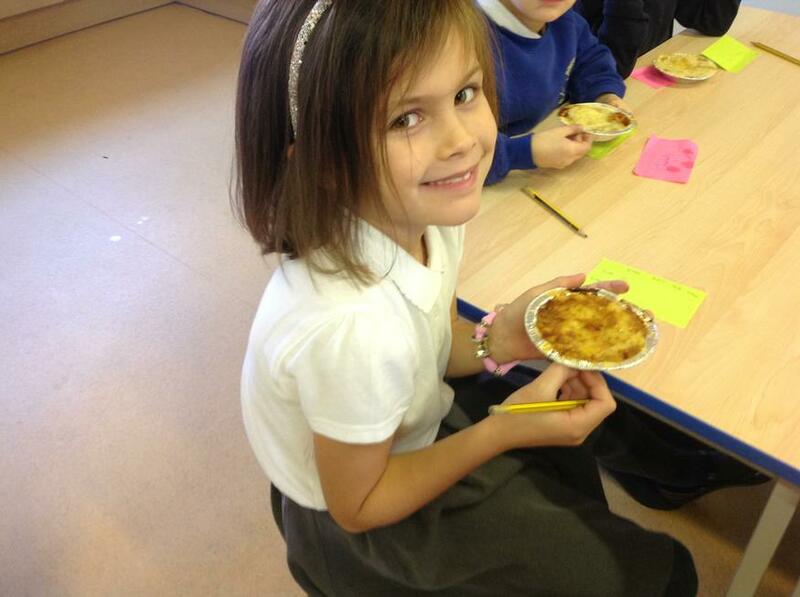 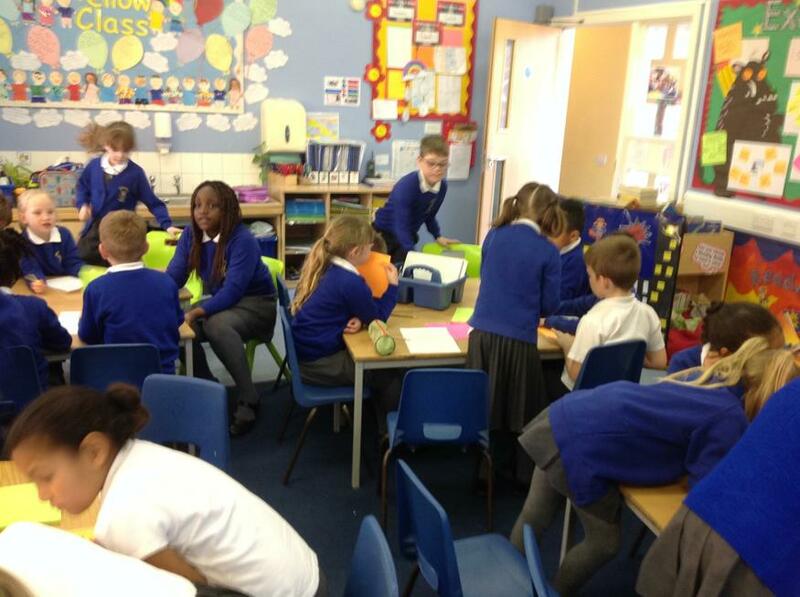 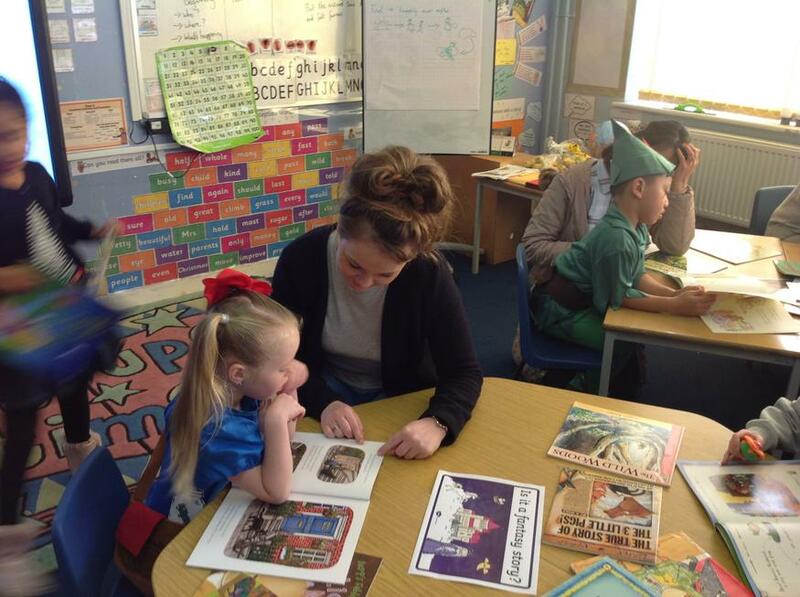 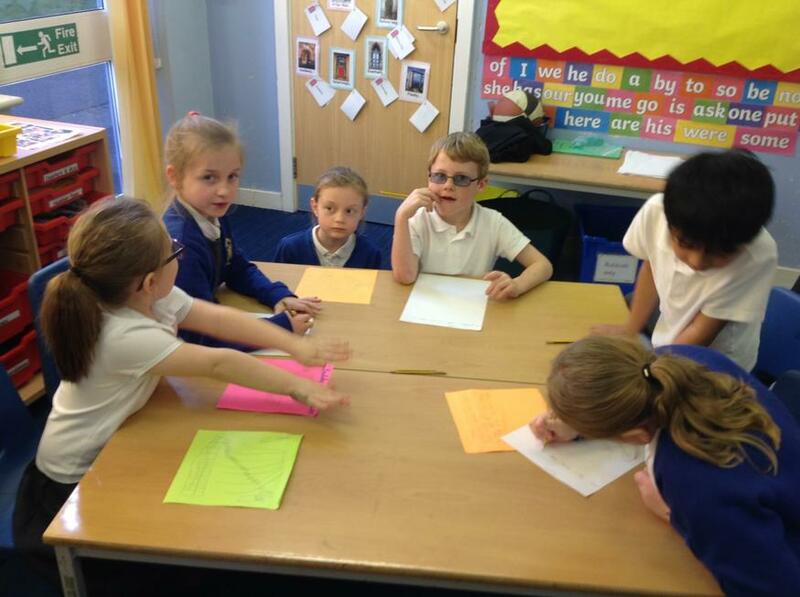 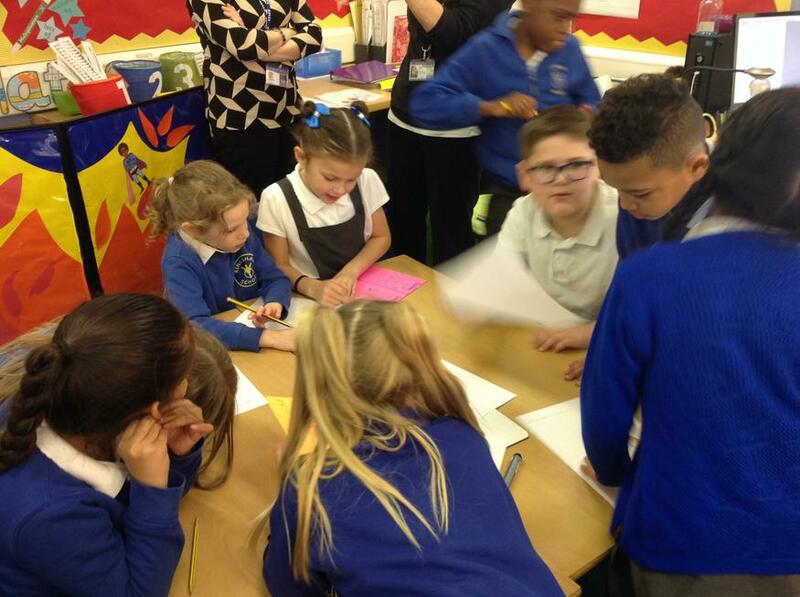 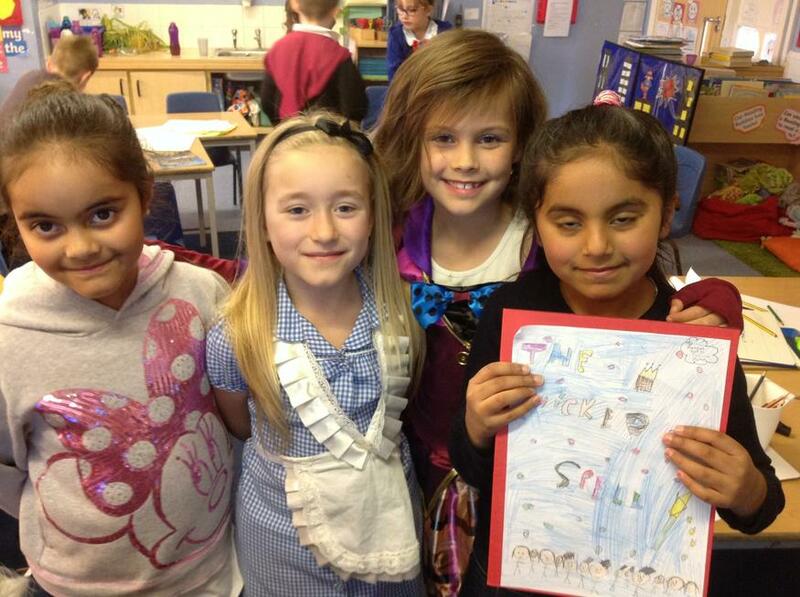 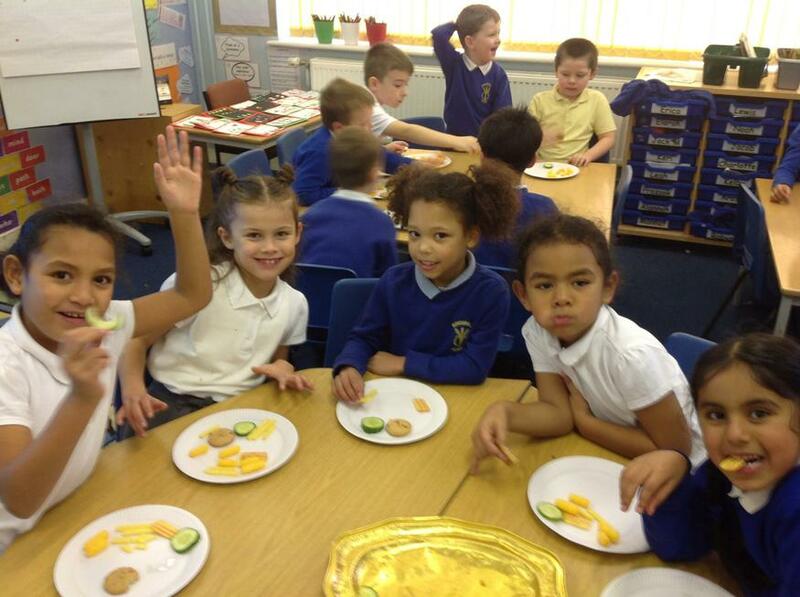 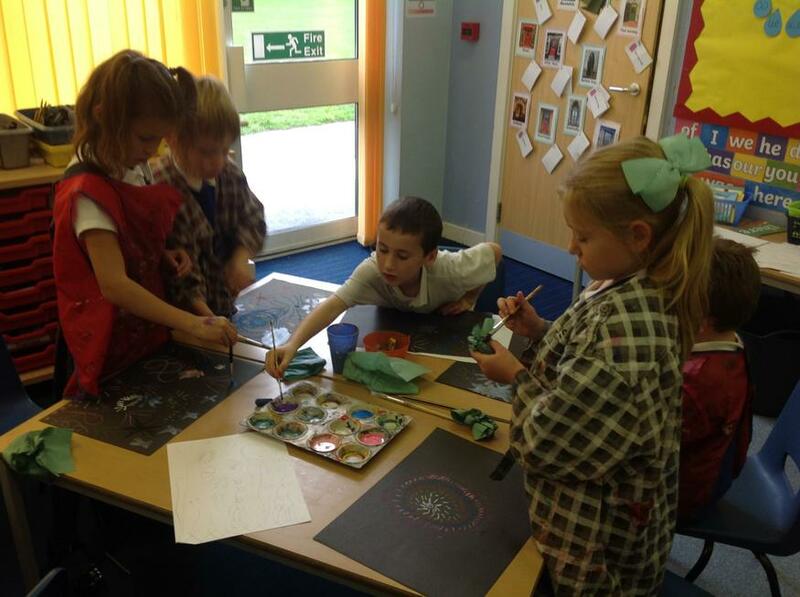 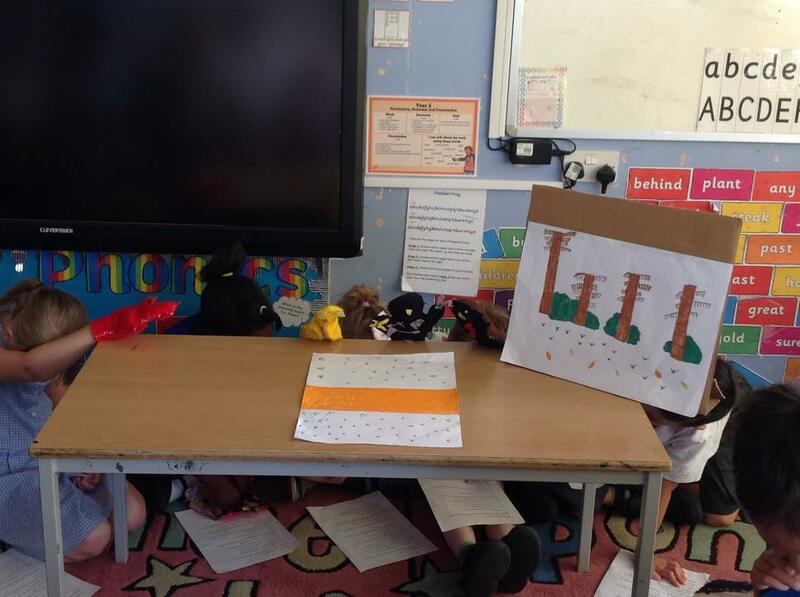 Yellow Class collaborated with some of the children from Blue Class to create their very own traditional tales. 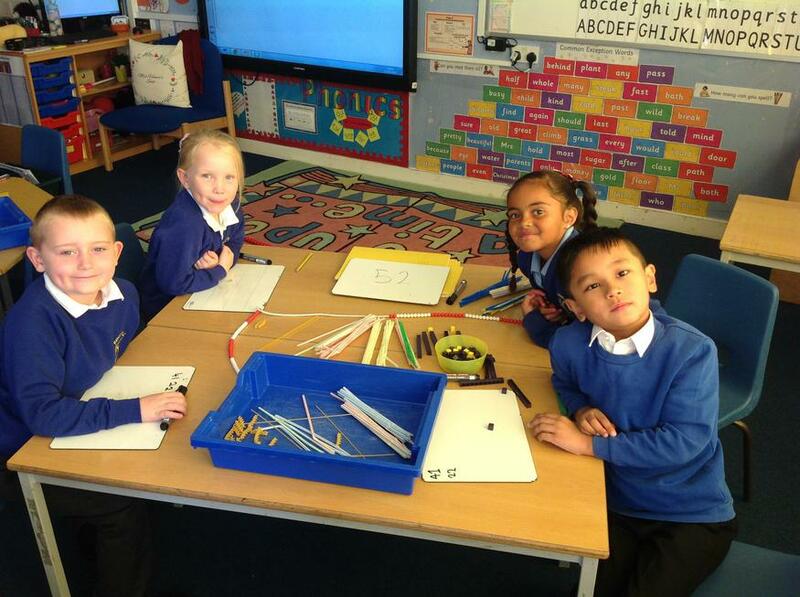 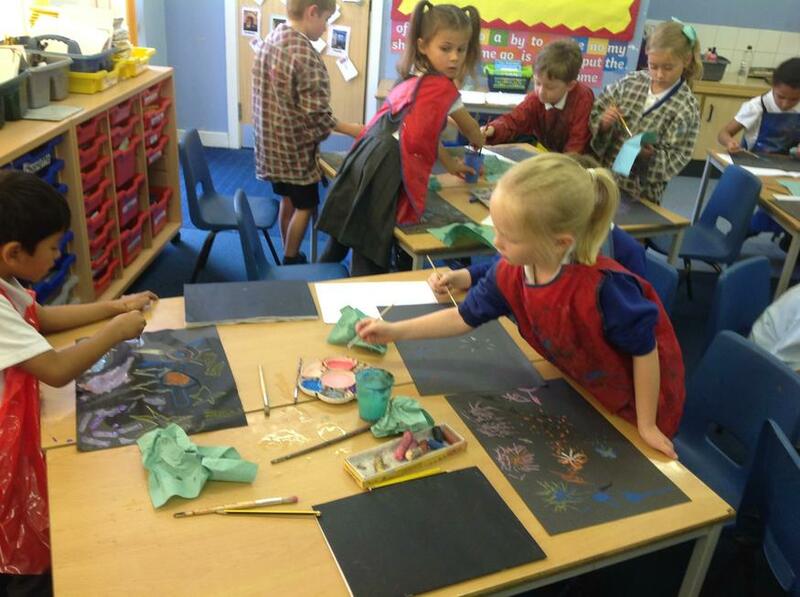 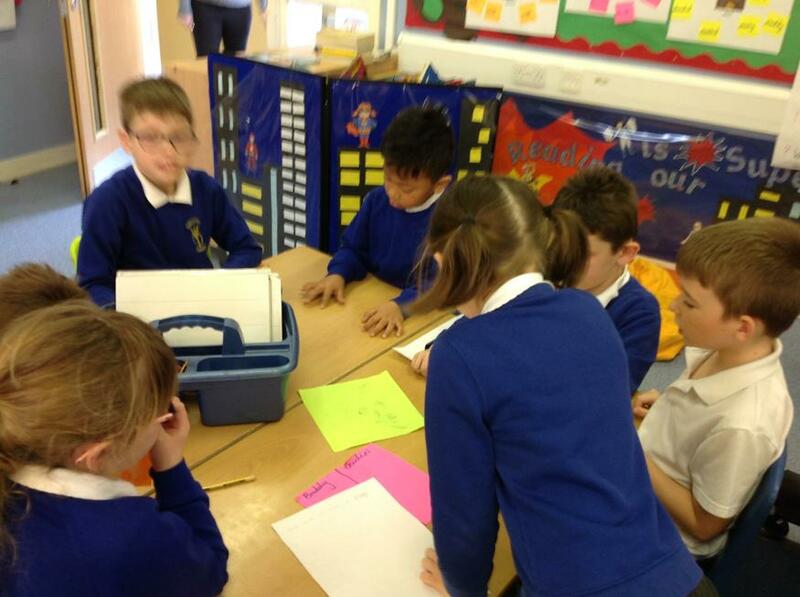 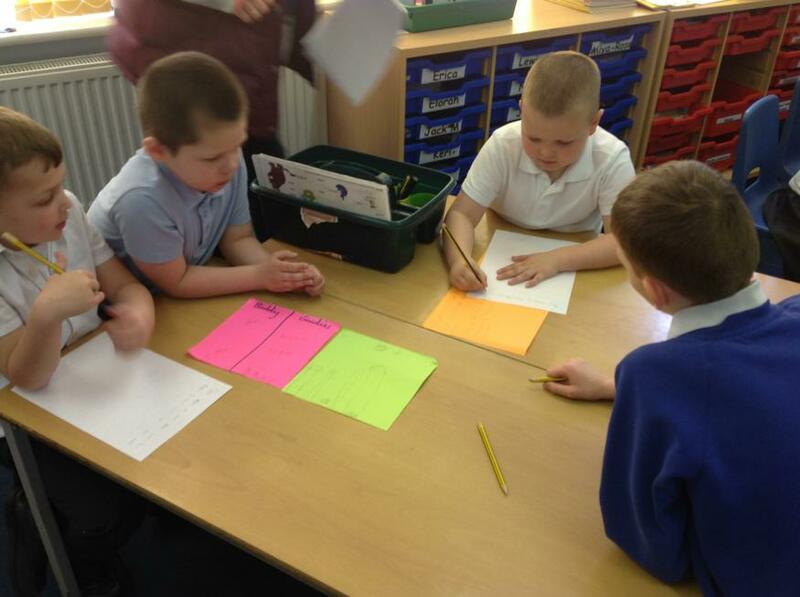 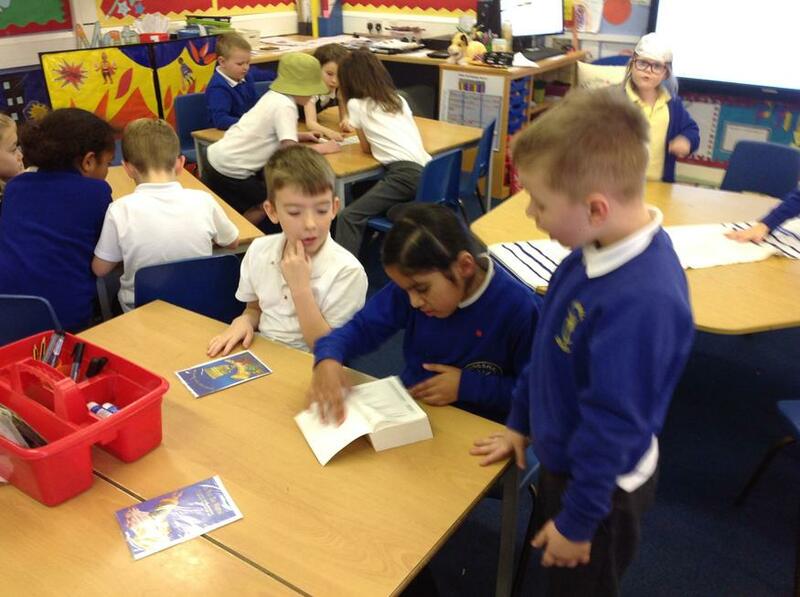 After Yellow Class had planned the ideas, the Blue class children helped them to record their stories in a book. 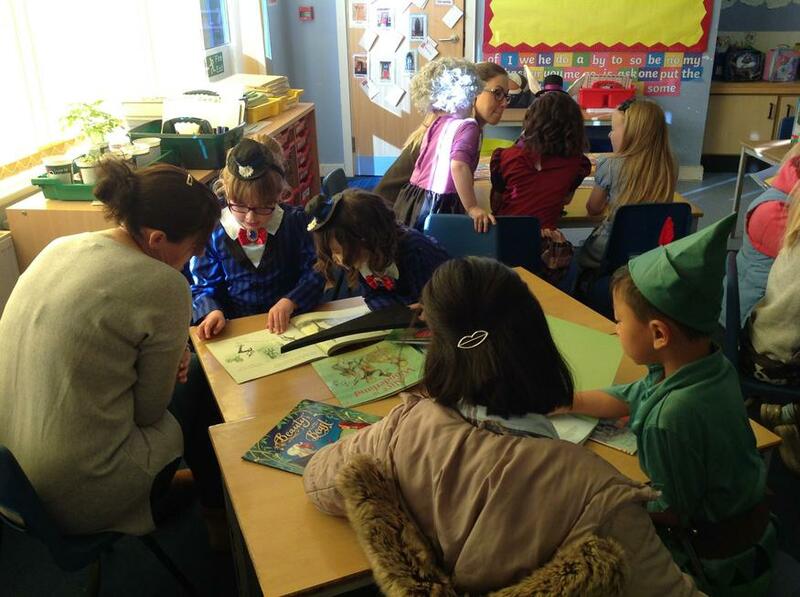 Miss Homer and Mrs Baker were extremely impressed by how well the children listened, collaborated and worked to create their stories. 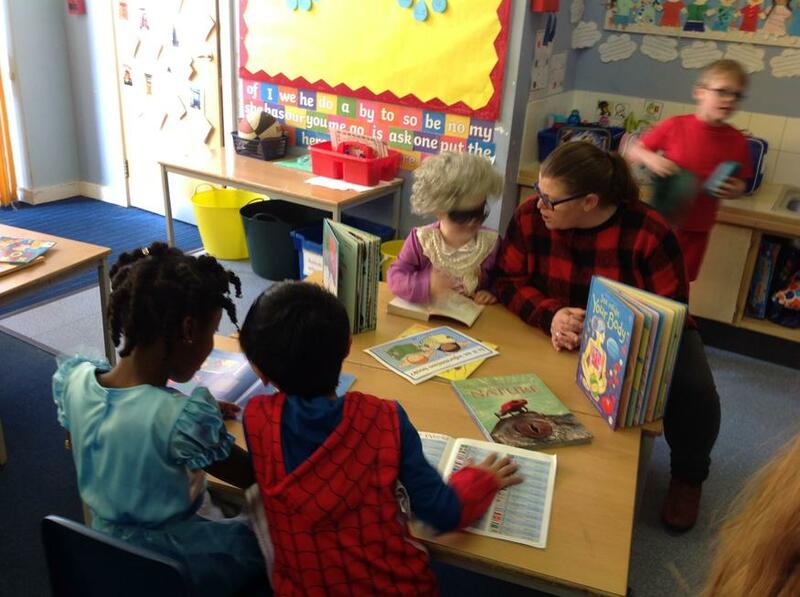 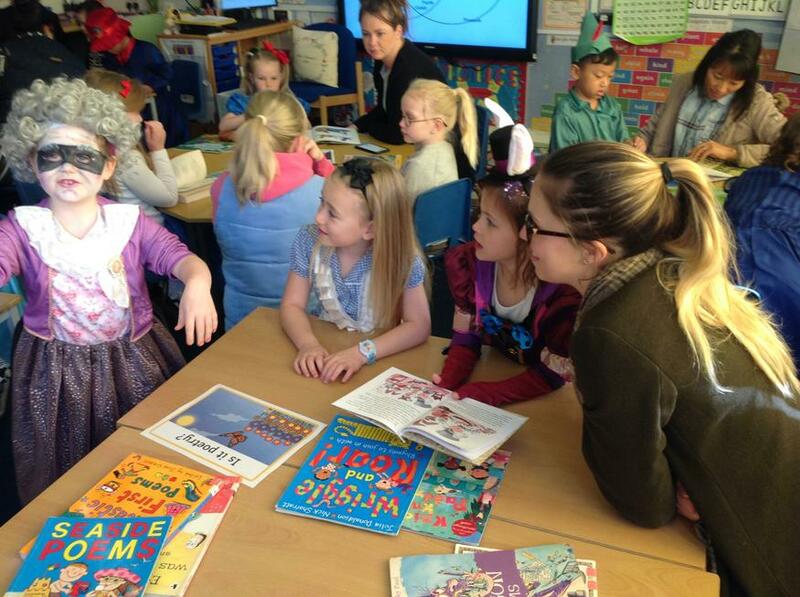 As well as this, we also enjoyed welcoming parents in to share books with us on World Book Day and dressing up as our favourite book characters. 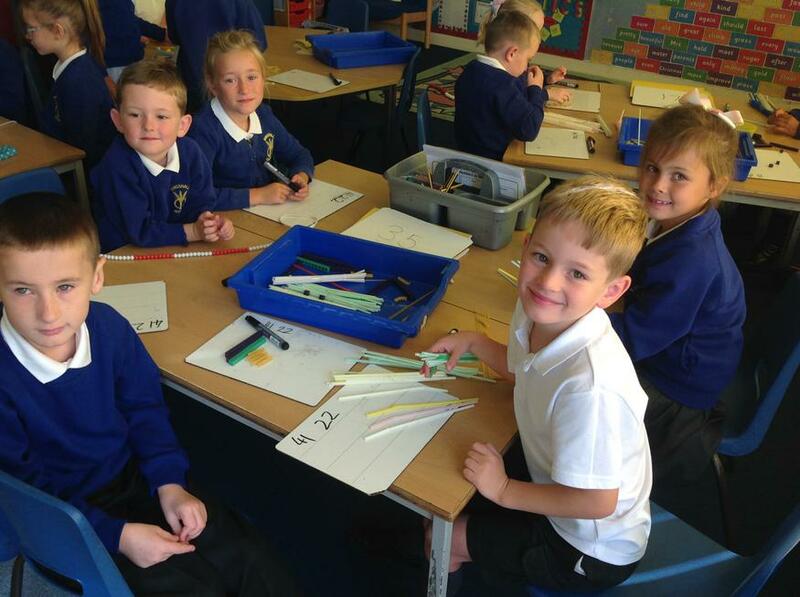 We have started our maths topic about fractions this week. 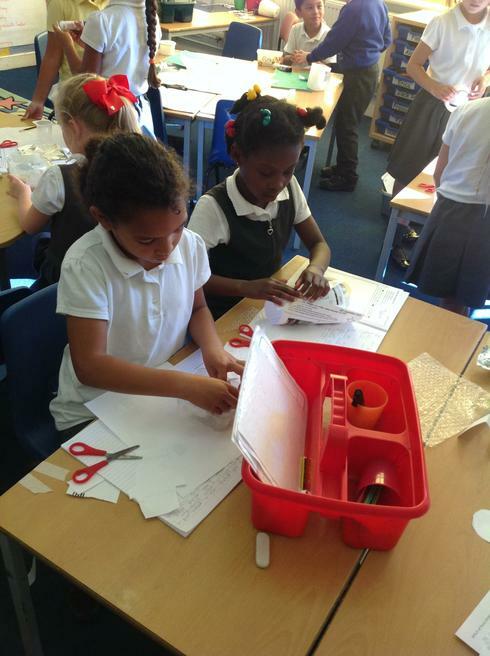 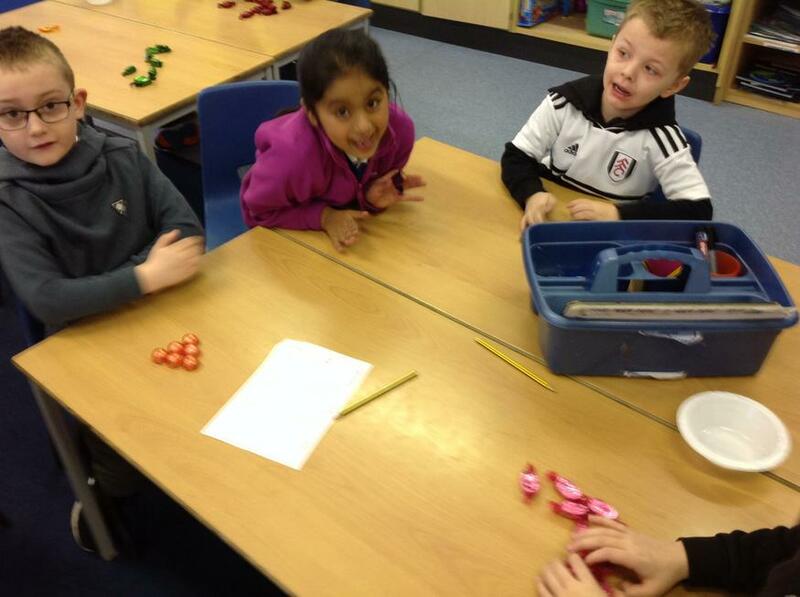 We have looked at splitting shapes into equal parts including halves and quarters. 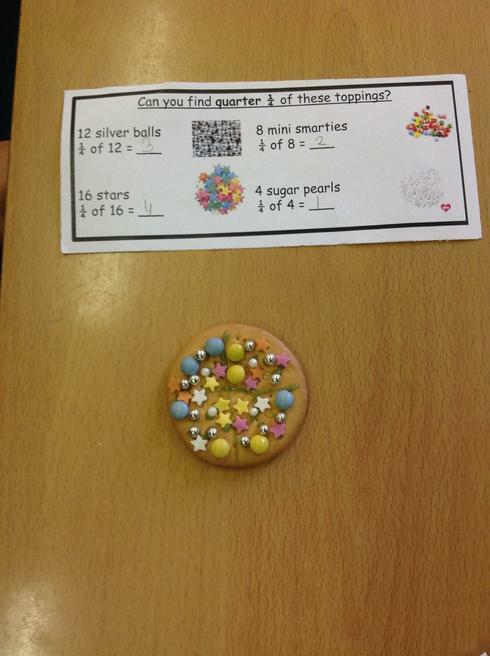 As well as sharing counters and dots to find half of an amount, today we have created some fraction biscuits, sharing different sprinkles equally into the parts to find halves and quarters. 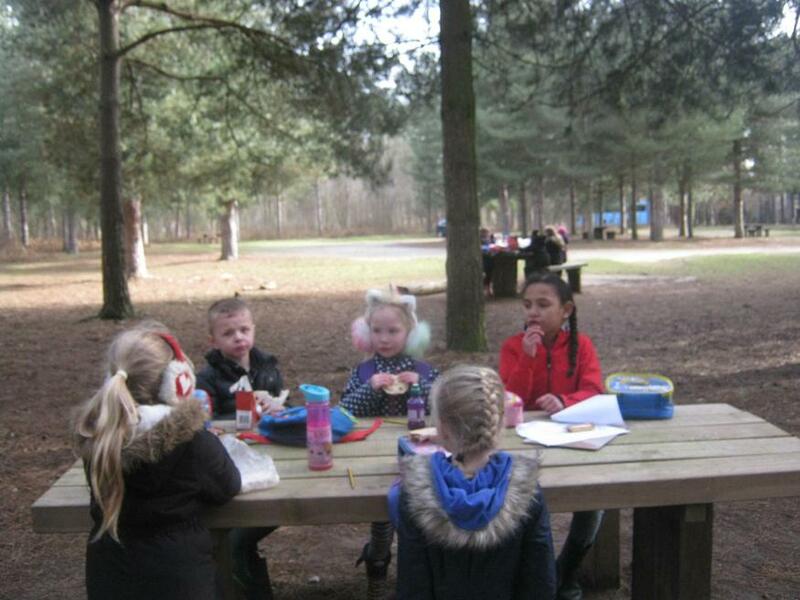 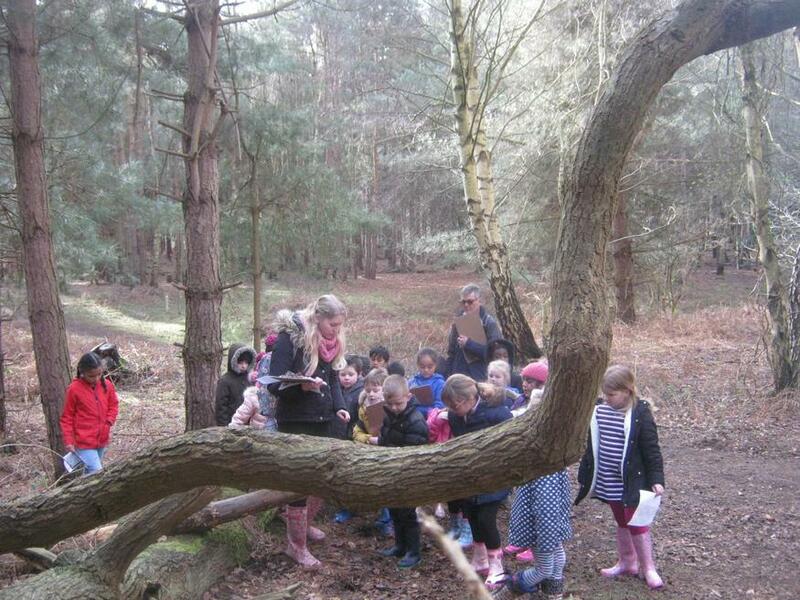 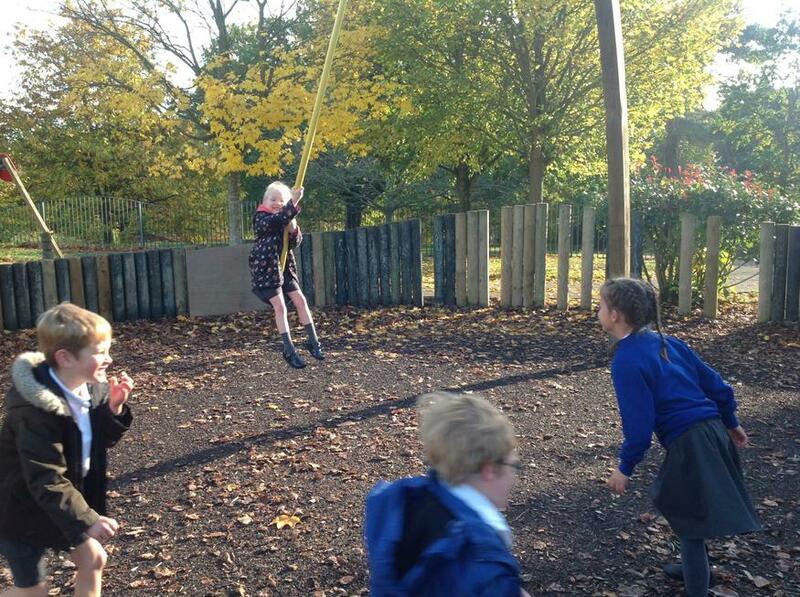 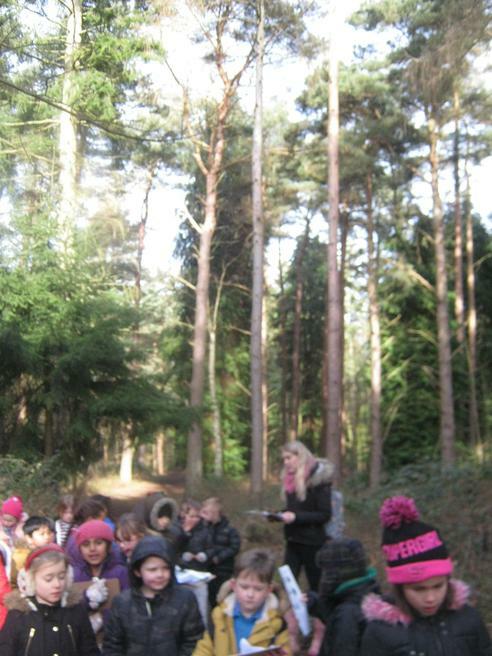 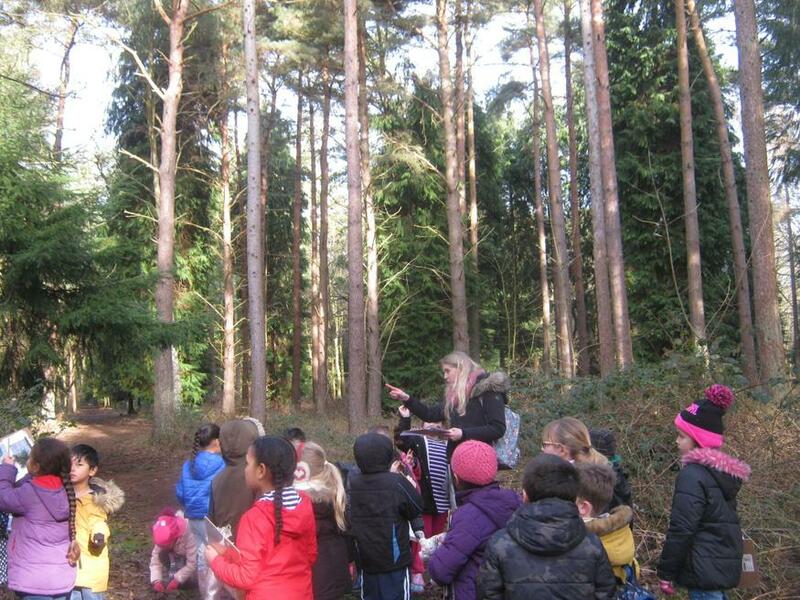 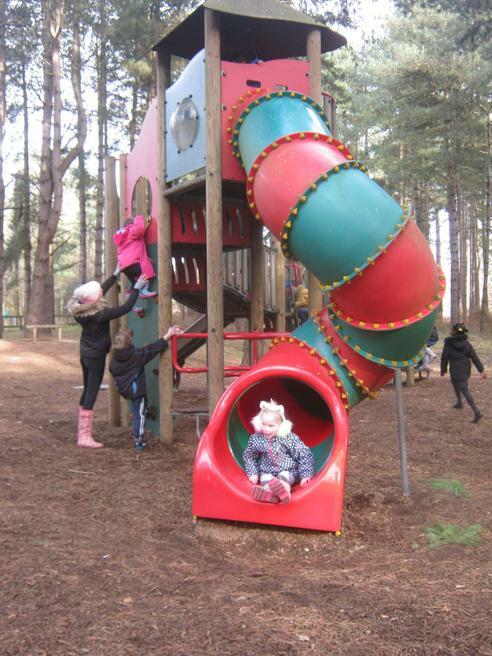 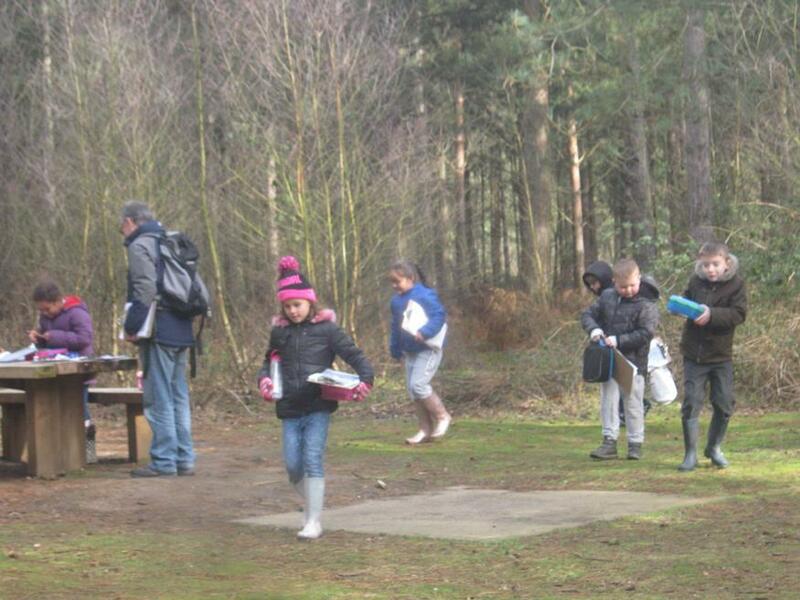 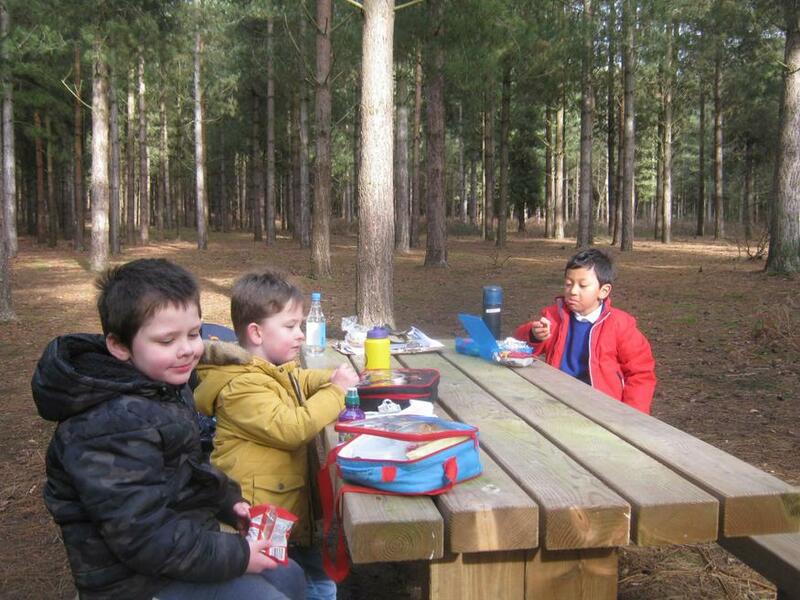 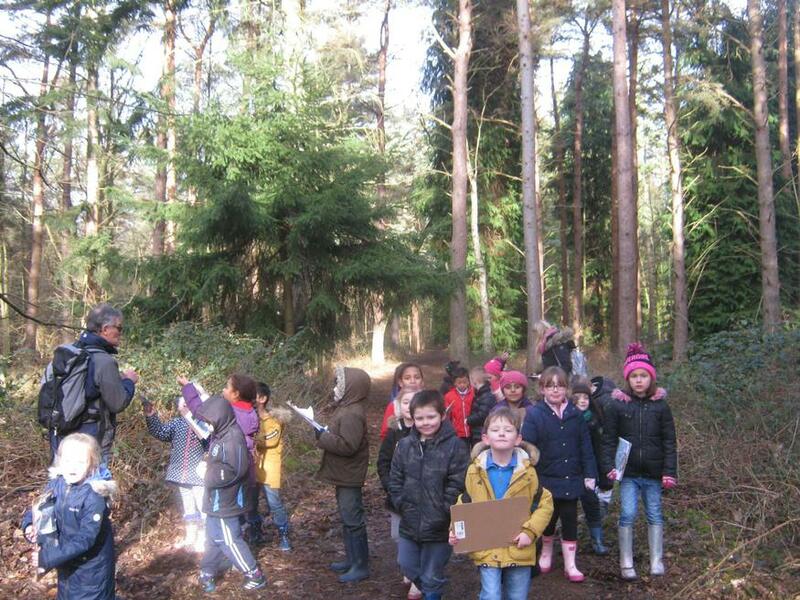 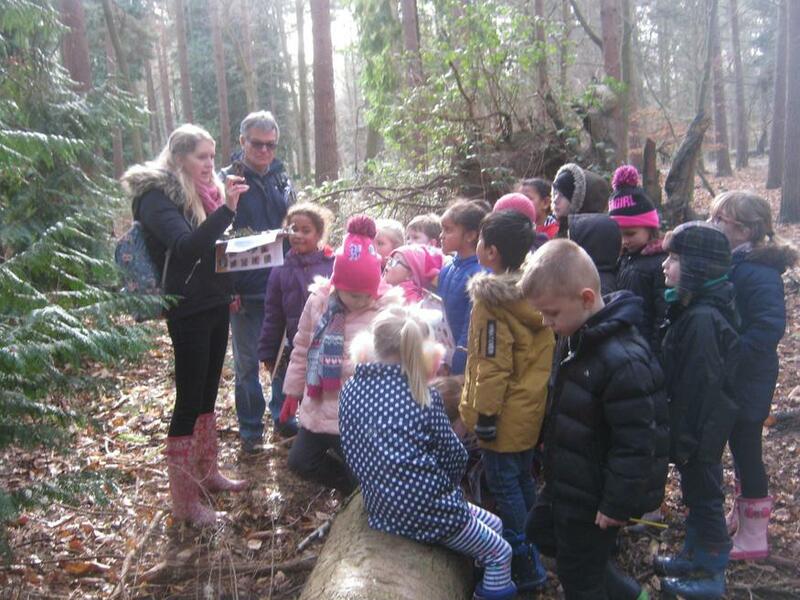 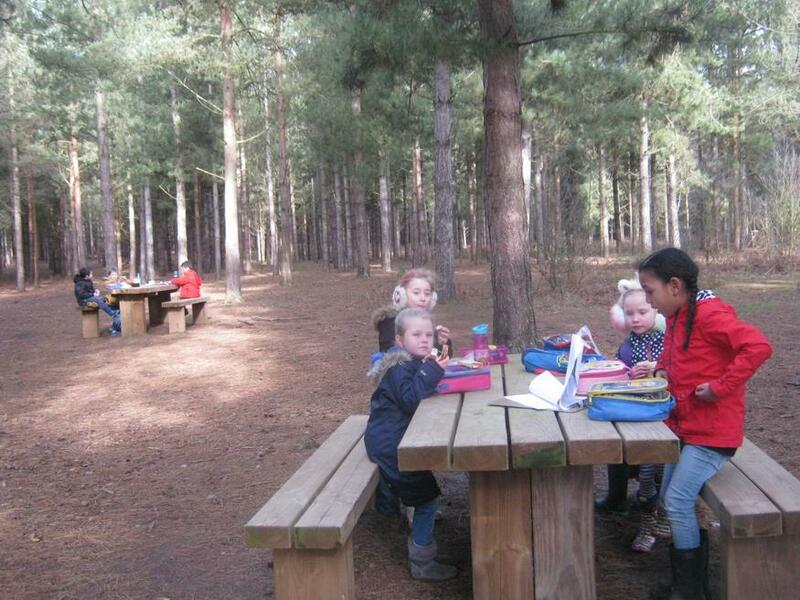 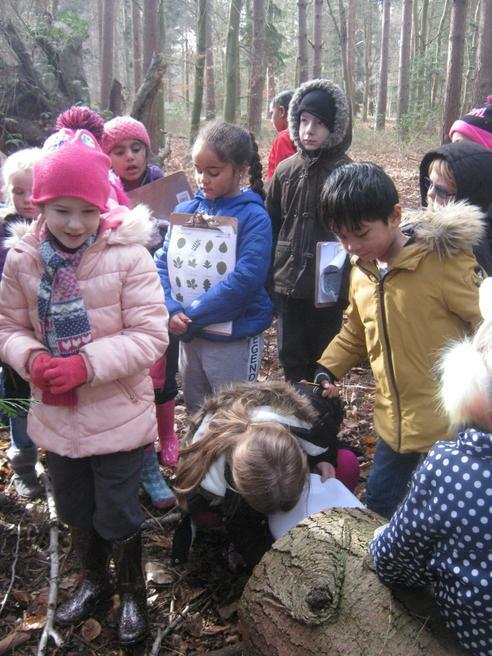 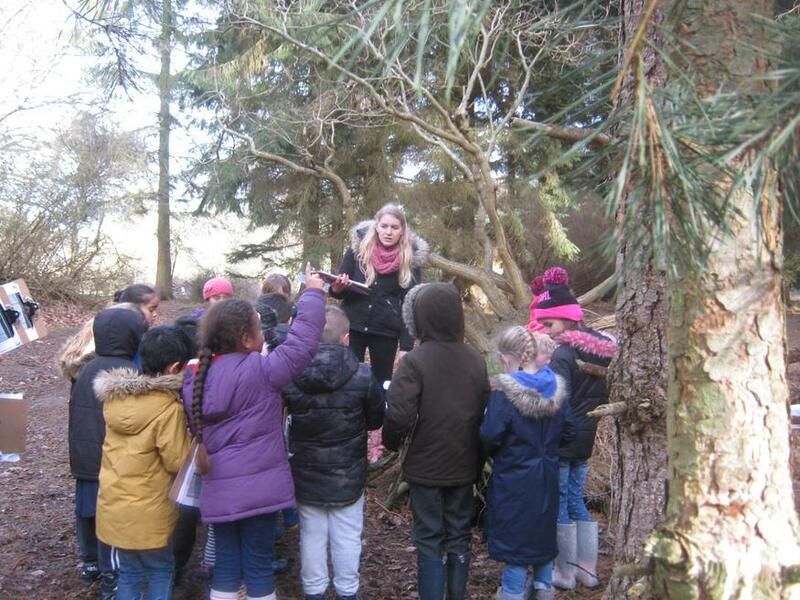 We had a super time at Rendlesham Forest on Tuesday. 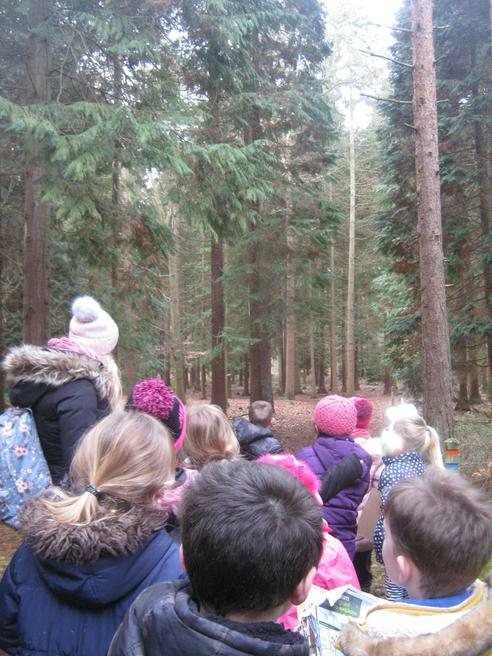 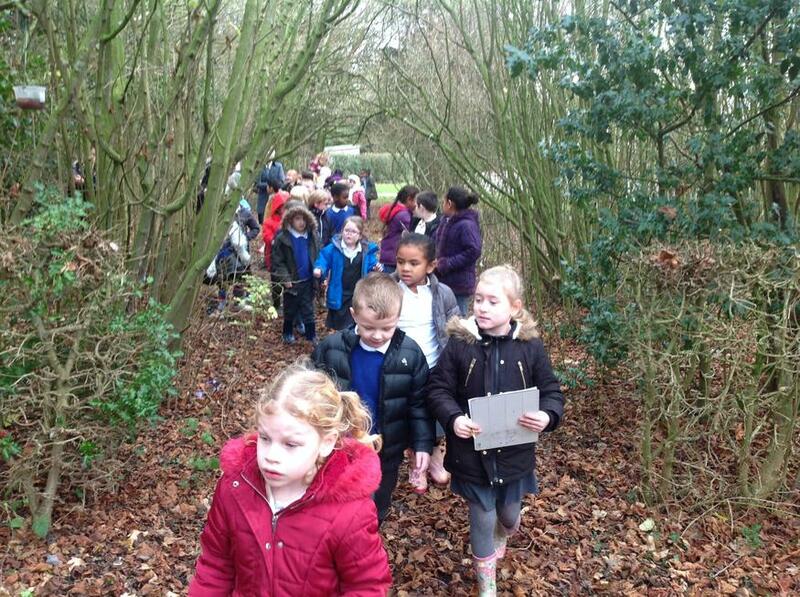 We took a stroll through the 'Deep Dark Wood' like the mouse in the Gruffalo story. 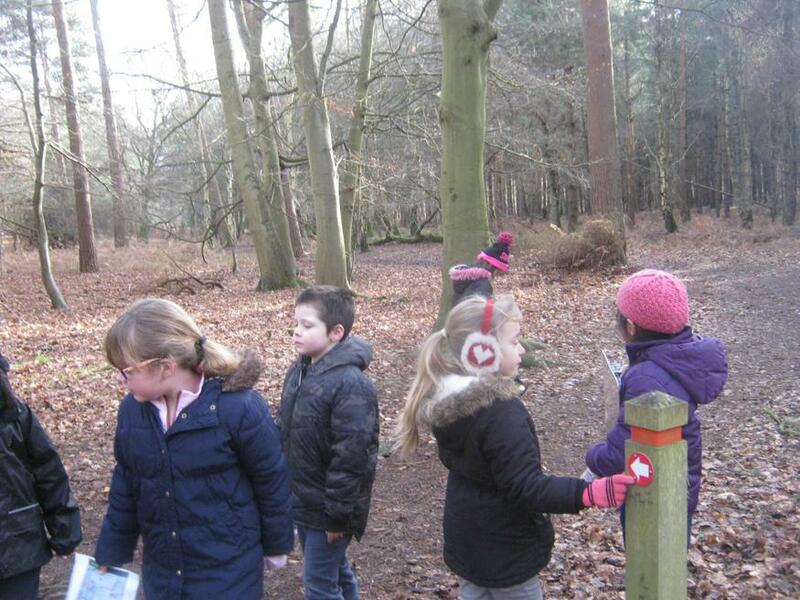 We used maps and directions to help us navigate to the pond. 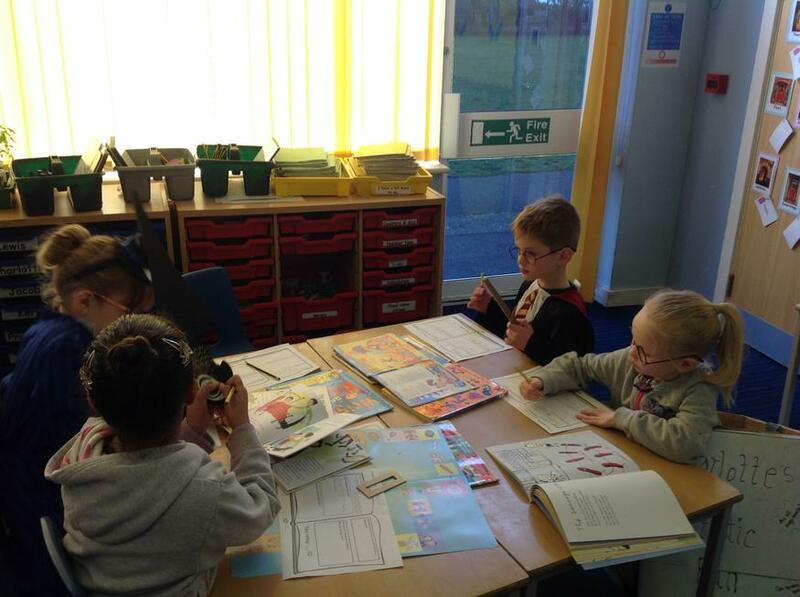 The adults were all very impressed by how the children could use compass points to say which direction they were travelling in! 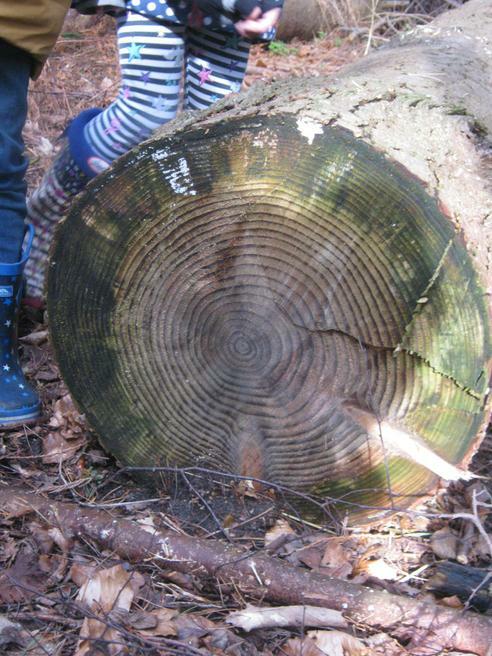 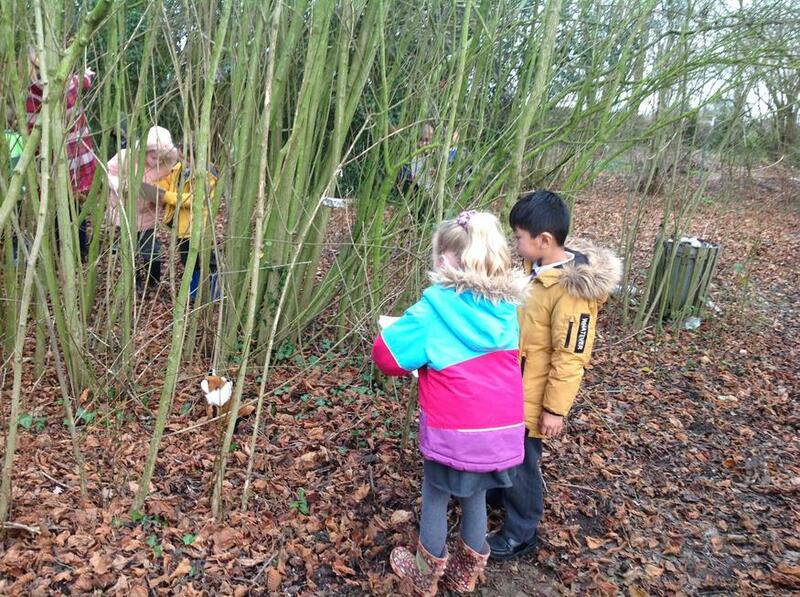 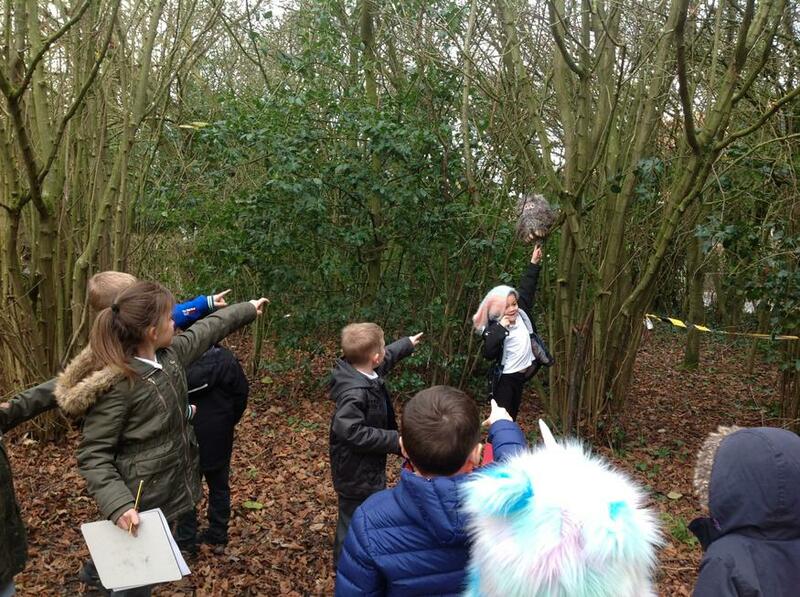 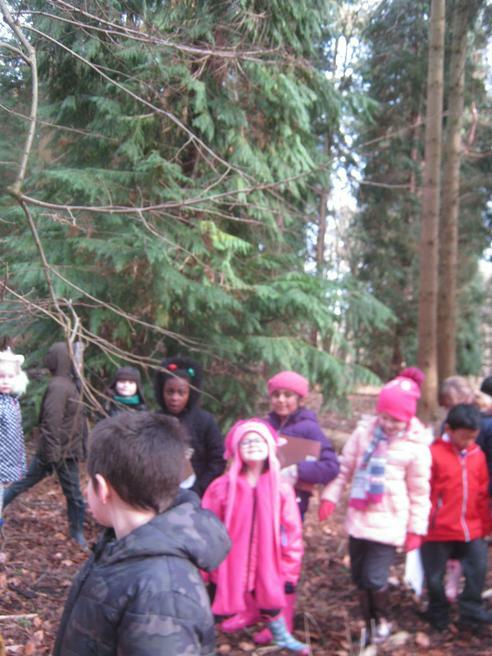 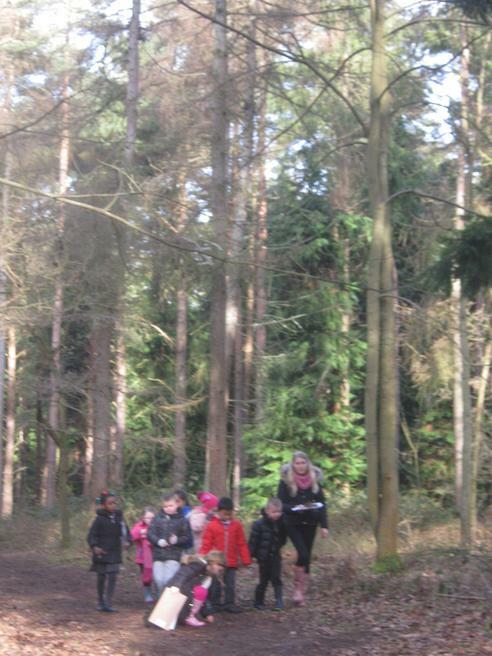 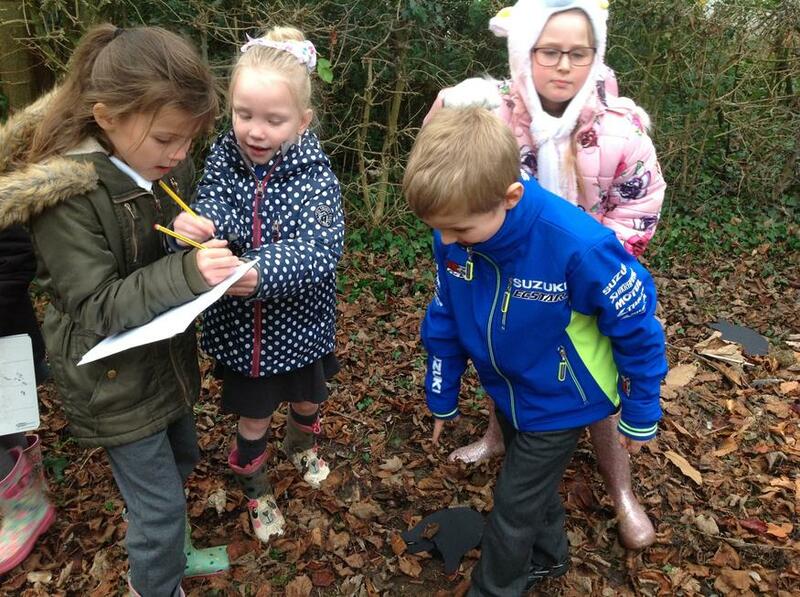 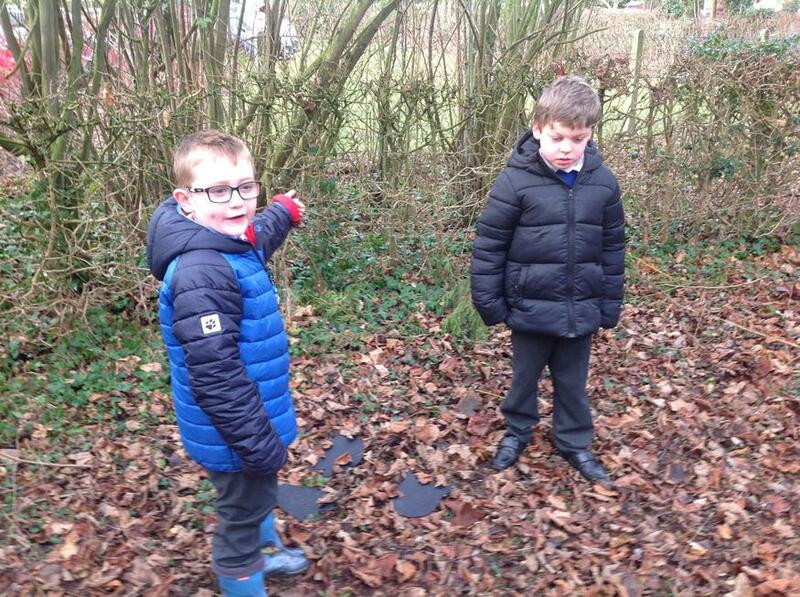 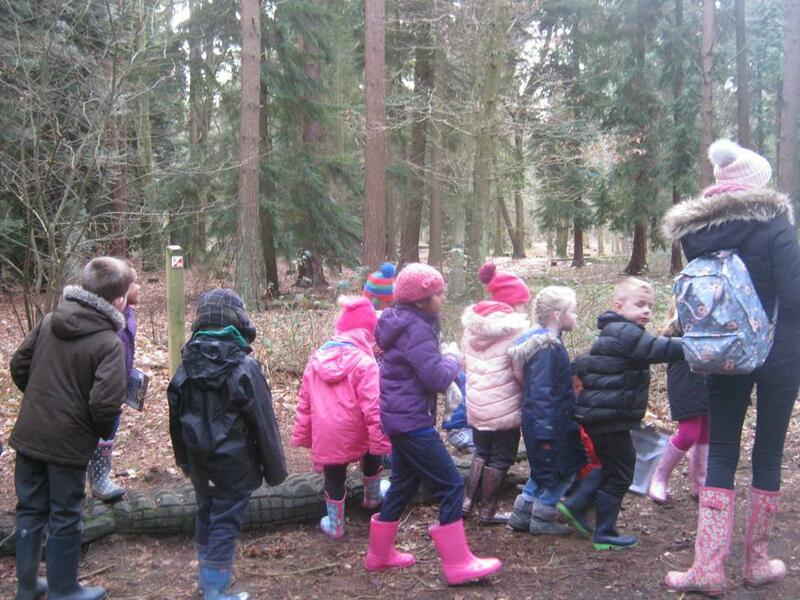 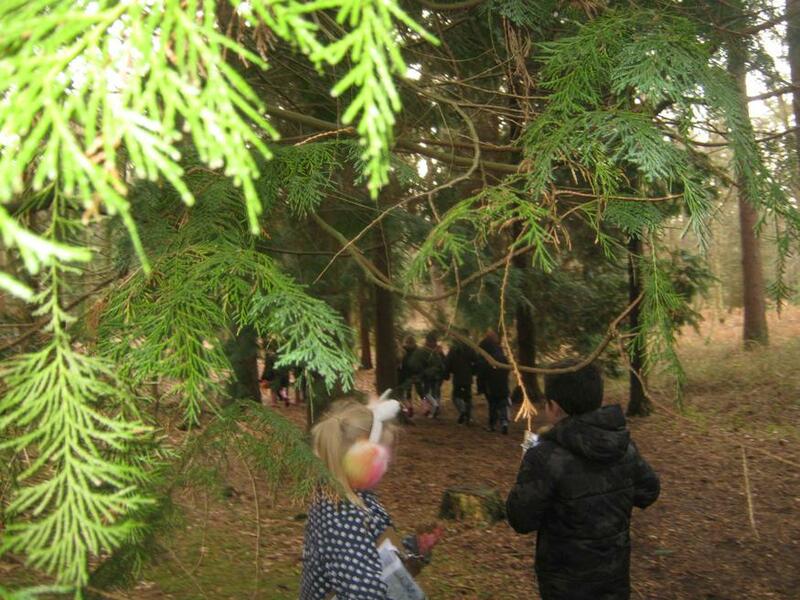 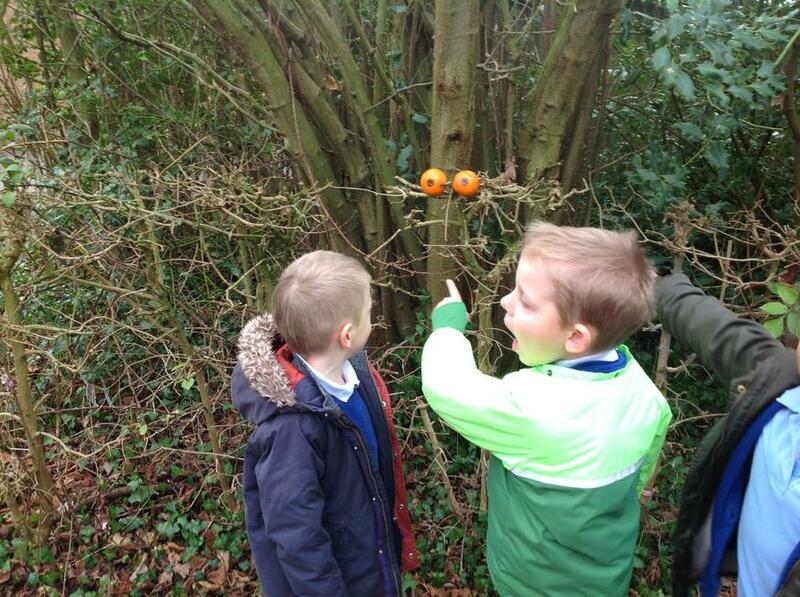 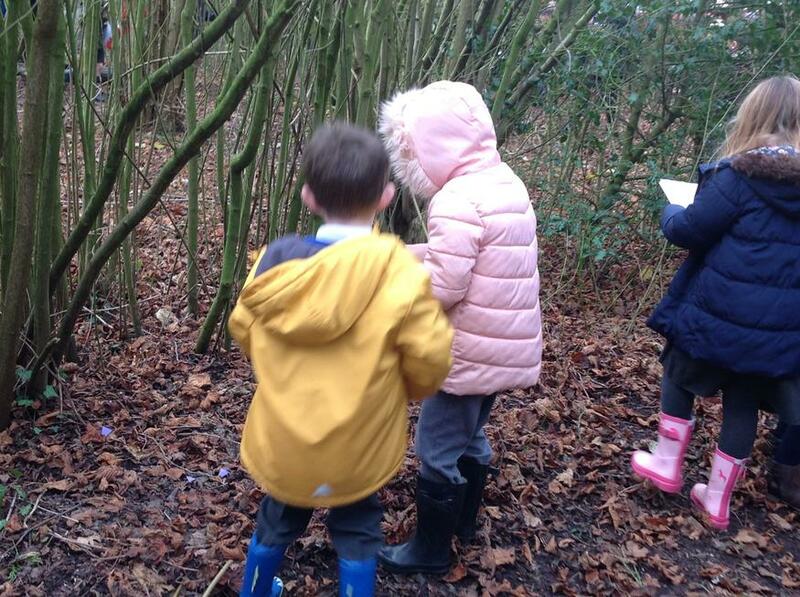 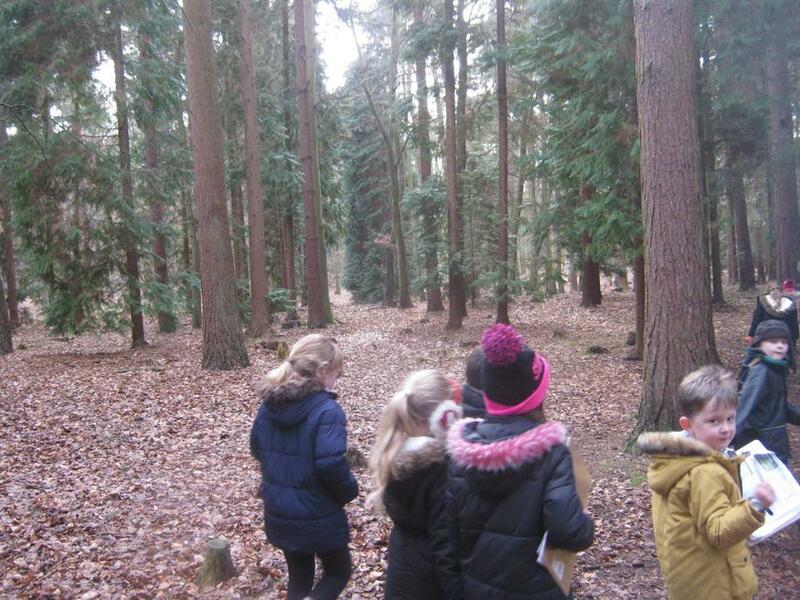 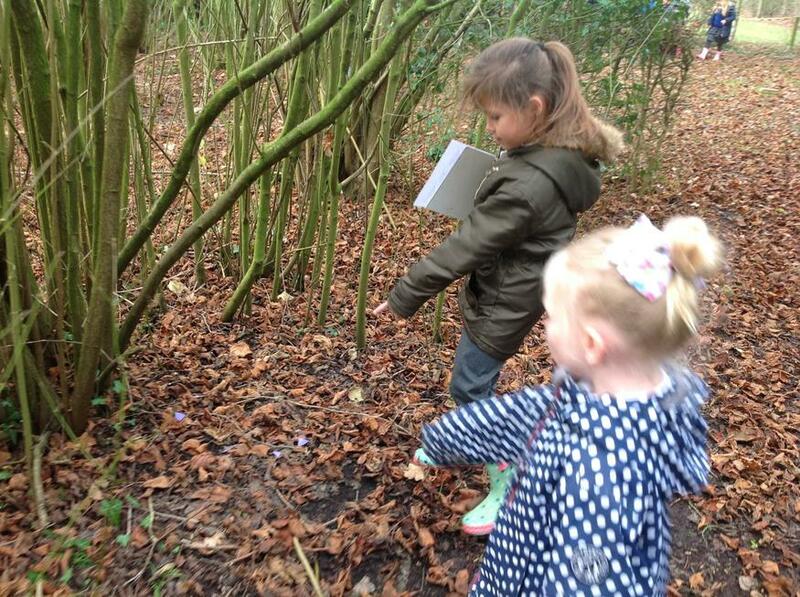 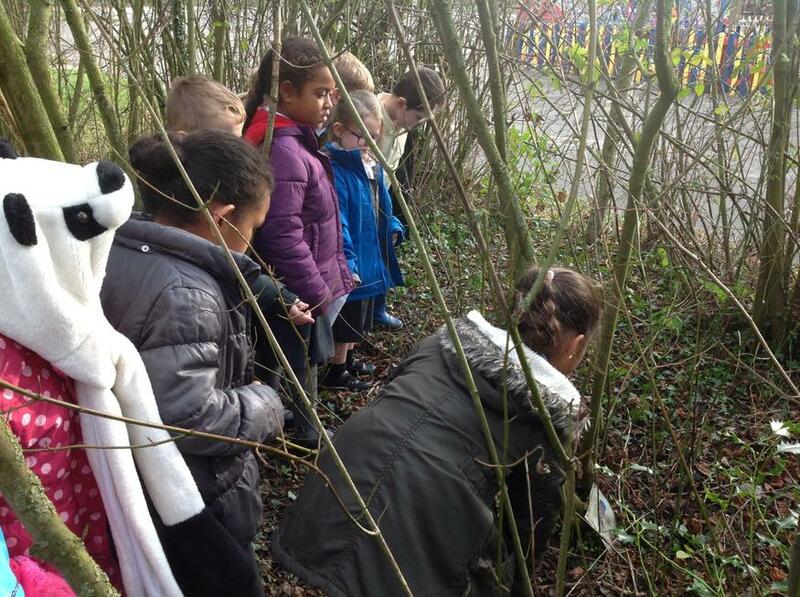 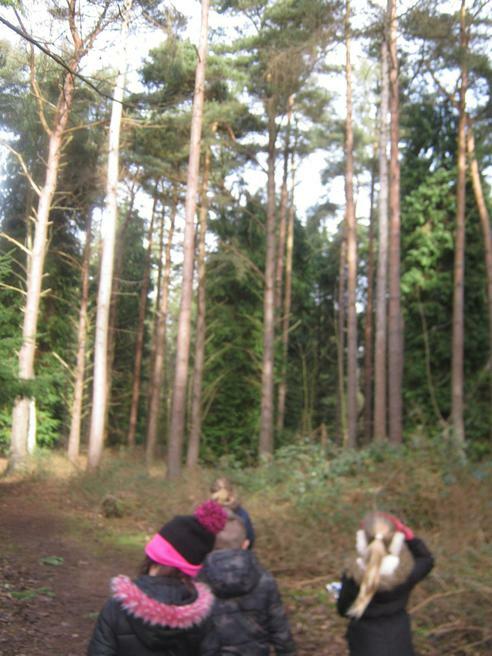 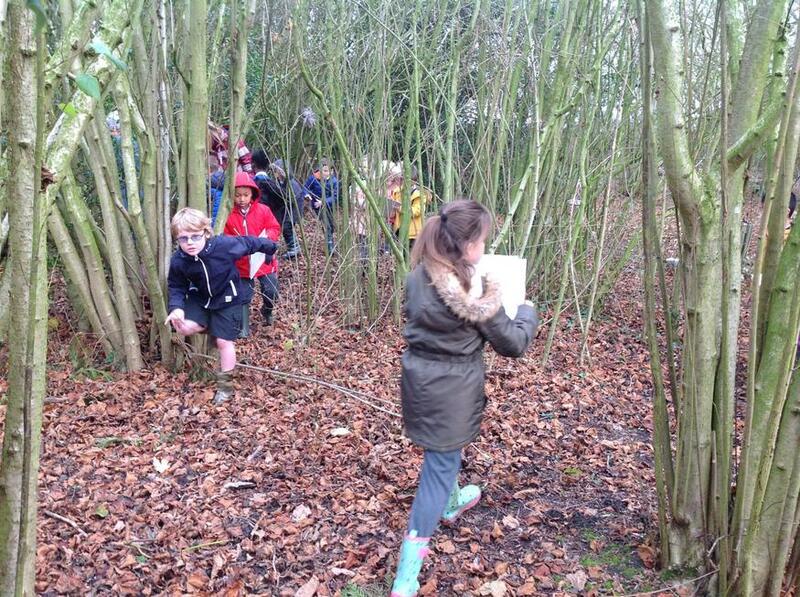 We also searched for the other creatures that lived in the forest and looked out for their habitats. 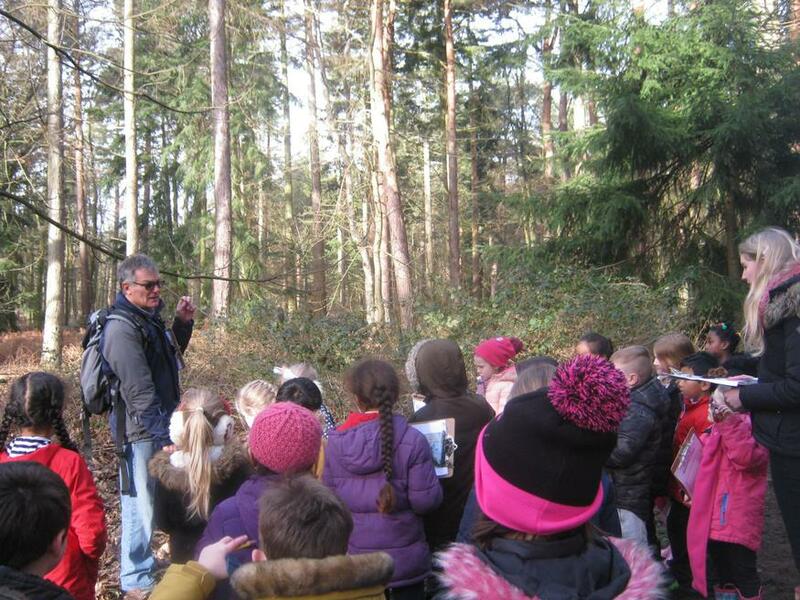 Mr Watson, one of our governors joined us on the trip and taught us lots about the trees and plants that we found in the forest. 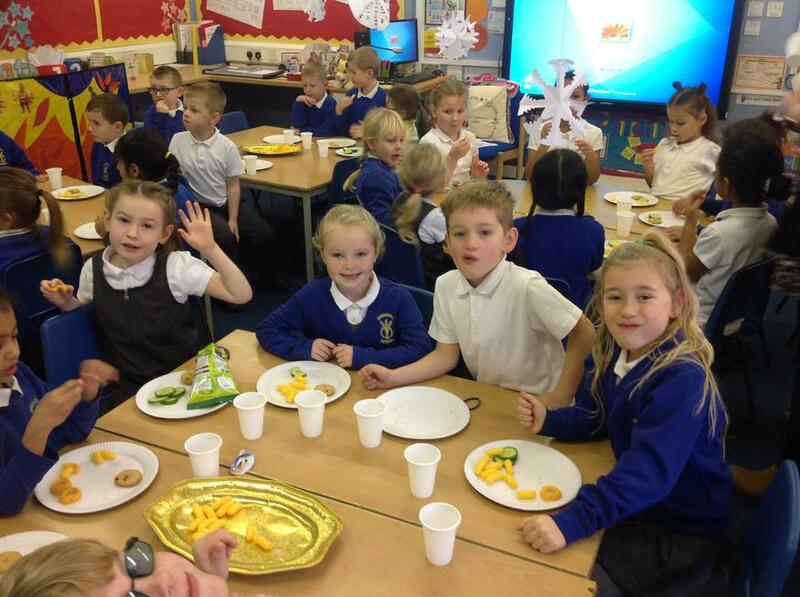 Everyone had a great time and behaved beautifully! 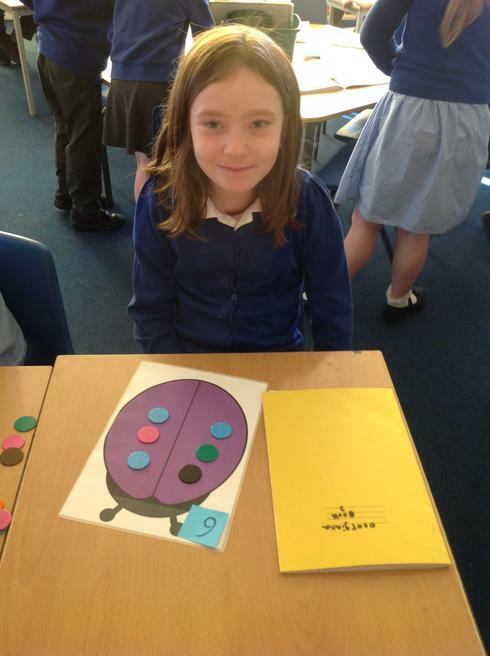 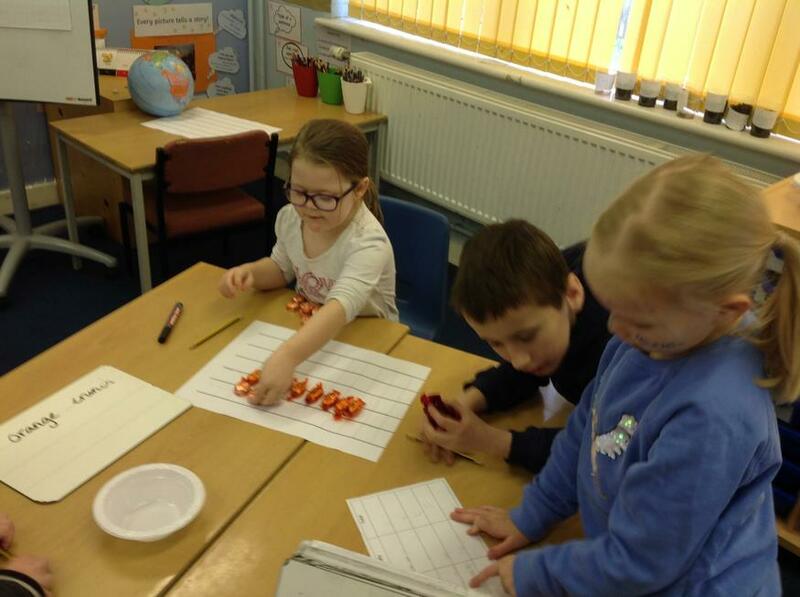 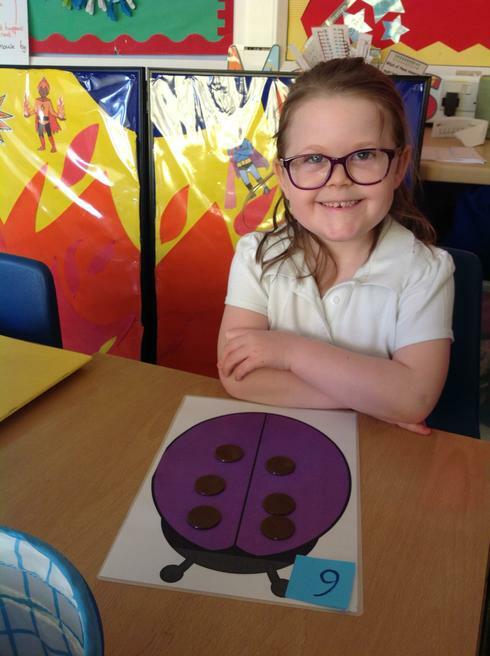 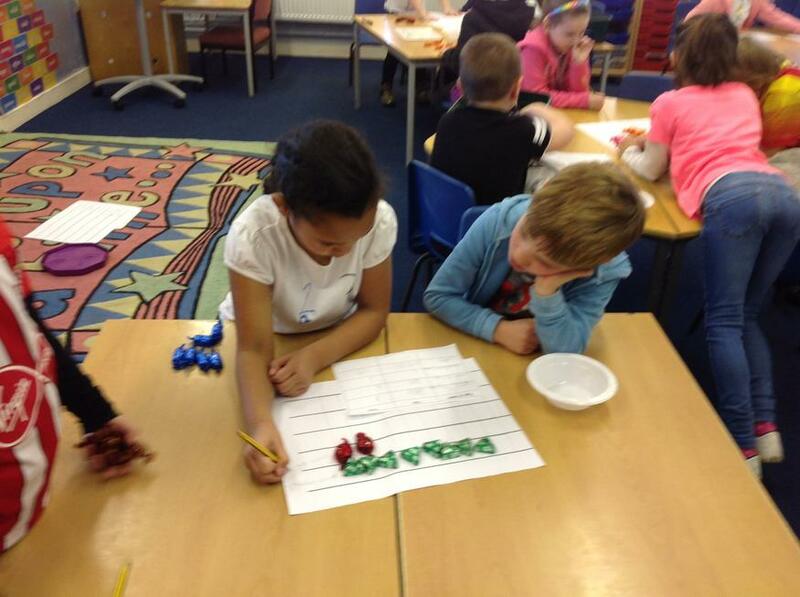 Today we have enjoyed spending the whole day working on maths activities for NSPCC Number Day. 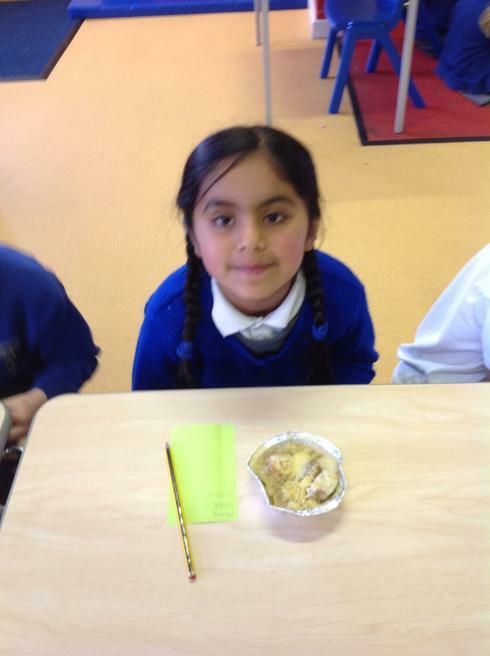 In teams we were given a bowl of sweets. 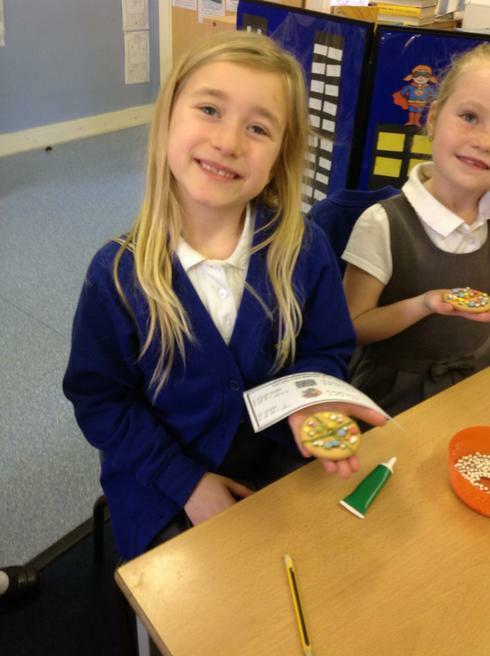 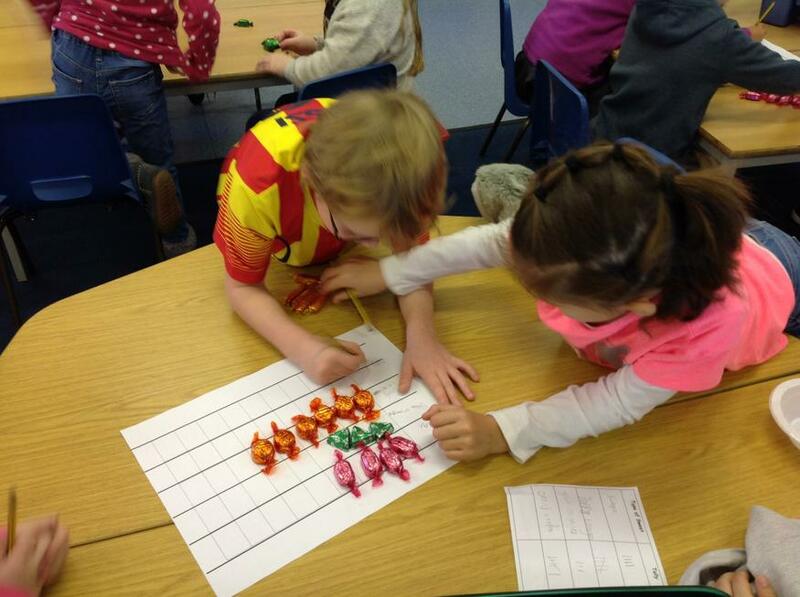 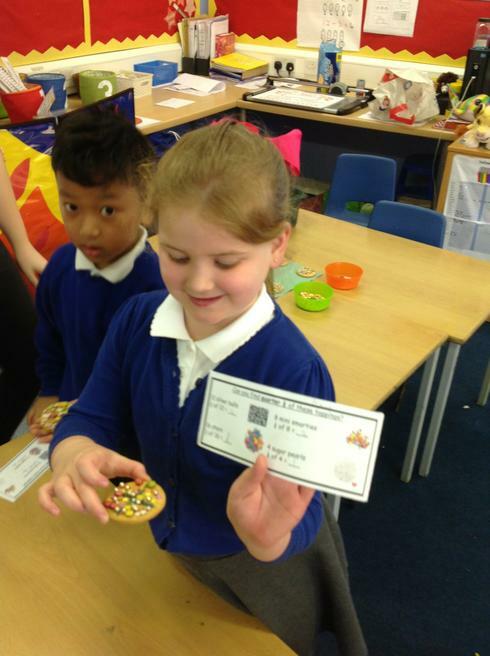 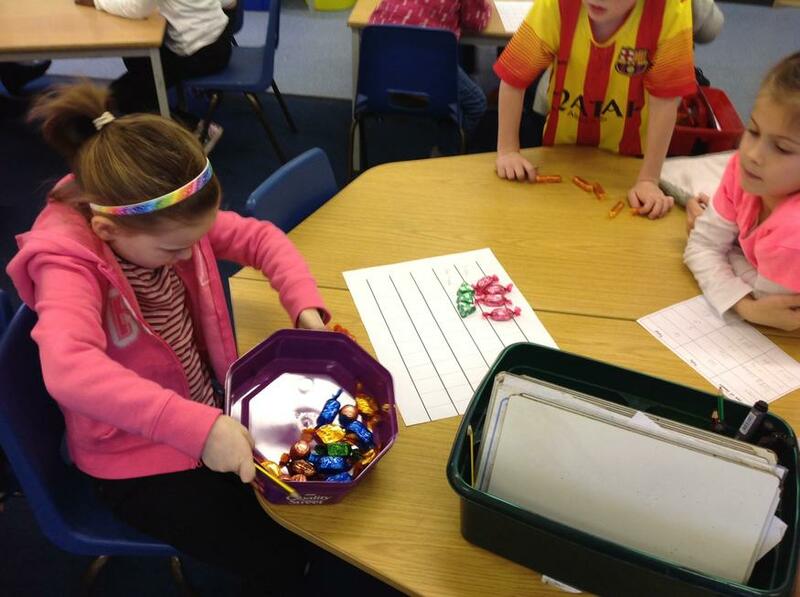 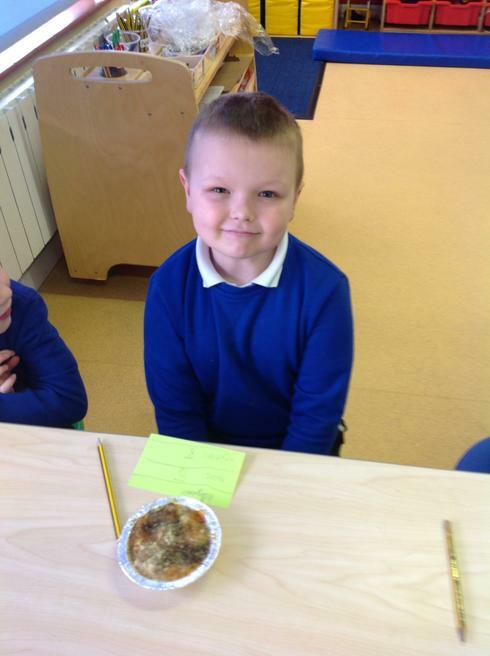 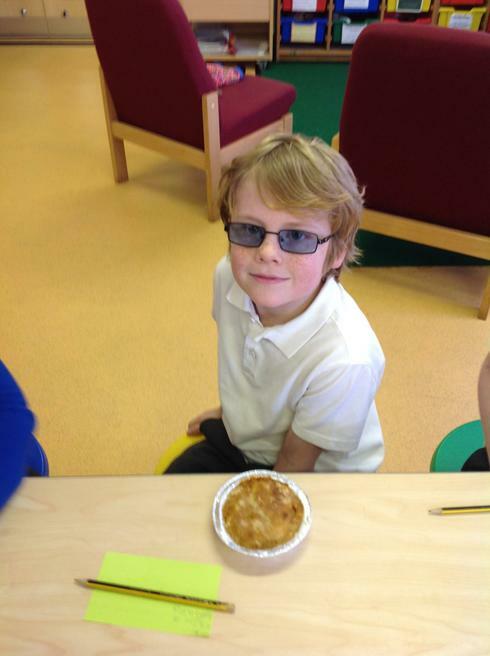 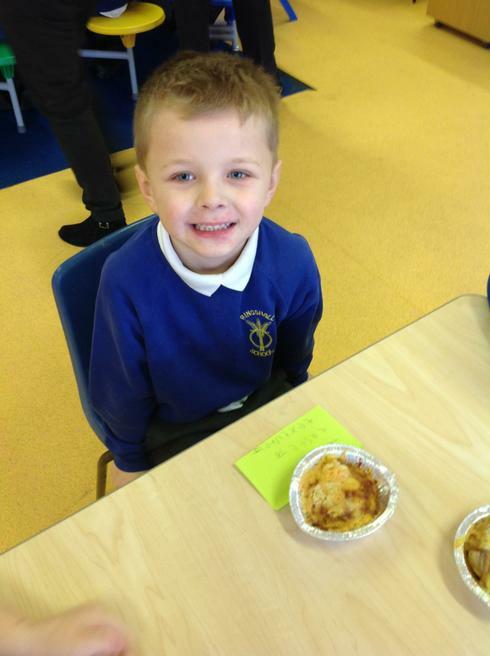 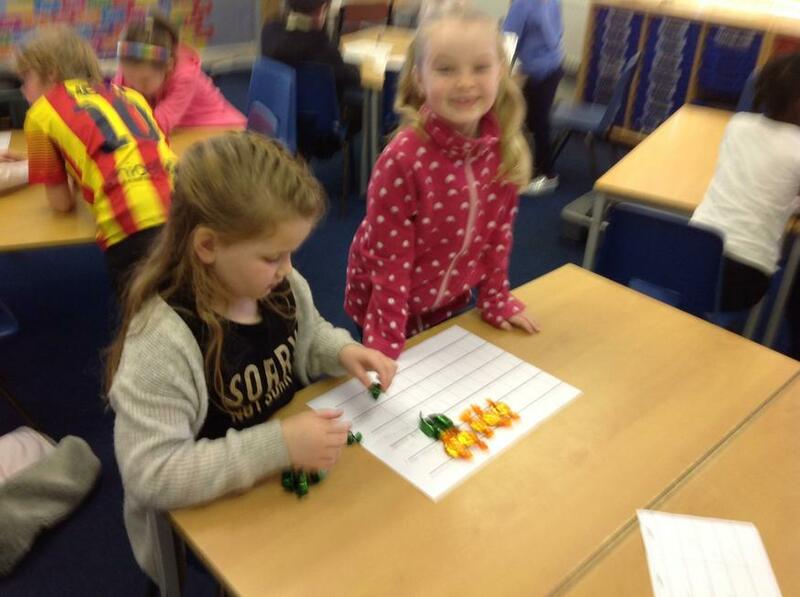 We had to show information about the sweets we had in different ways. 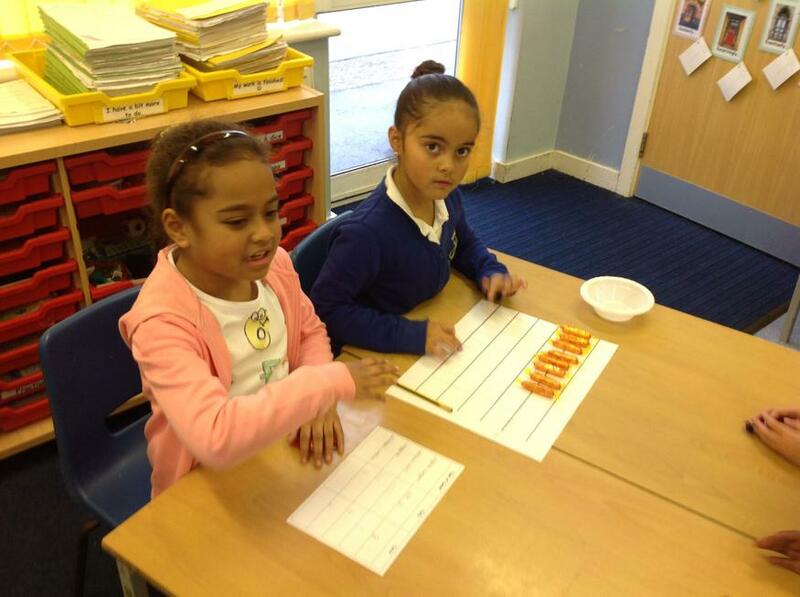 We made a tally chart, a pictogram and a block chart. 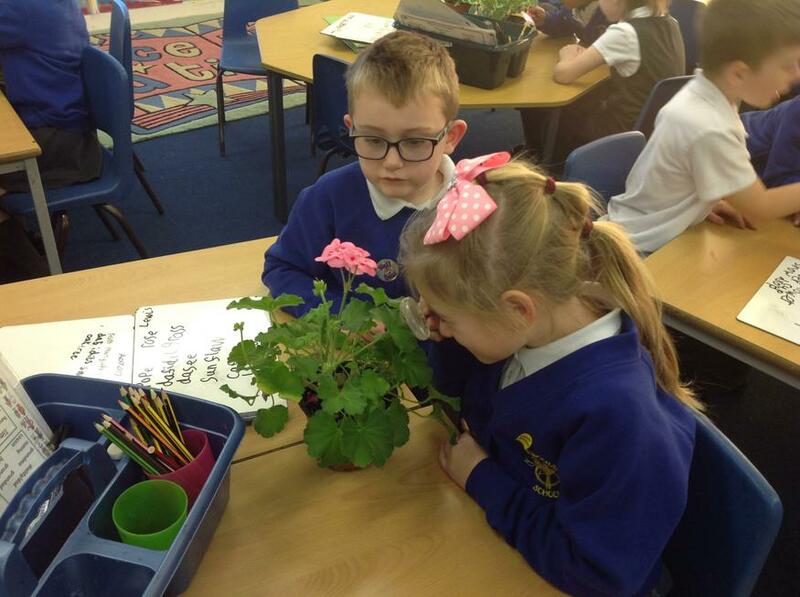 Science Investigation - What do plants need to grow? 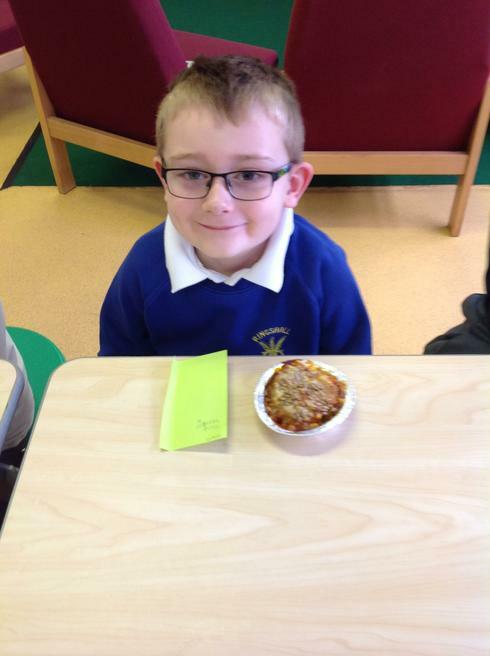 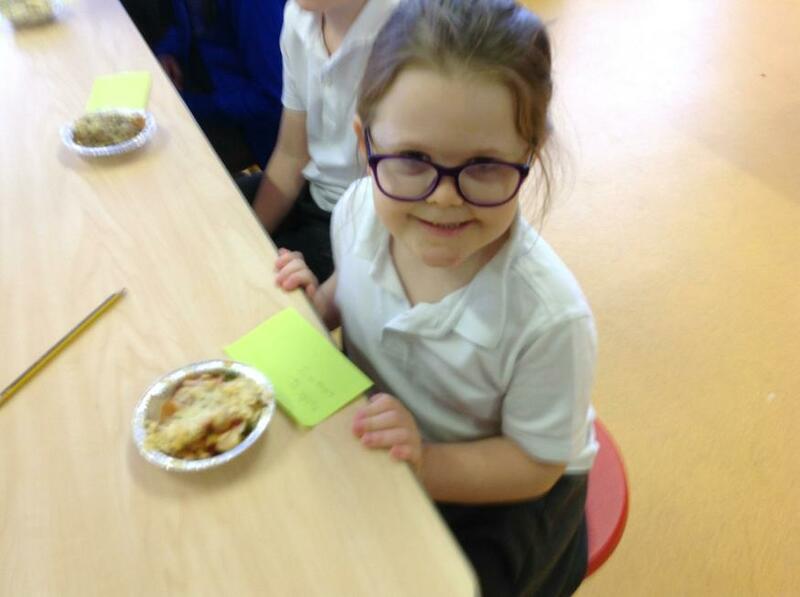 My favourite food is... Gruffalo crumble! 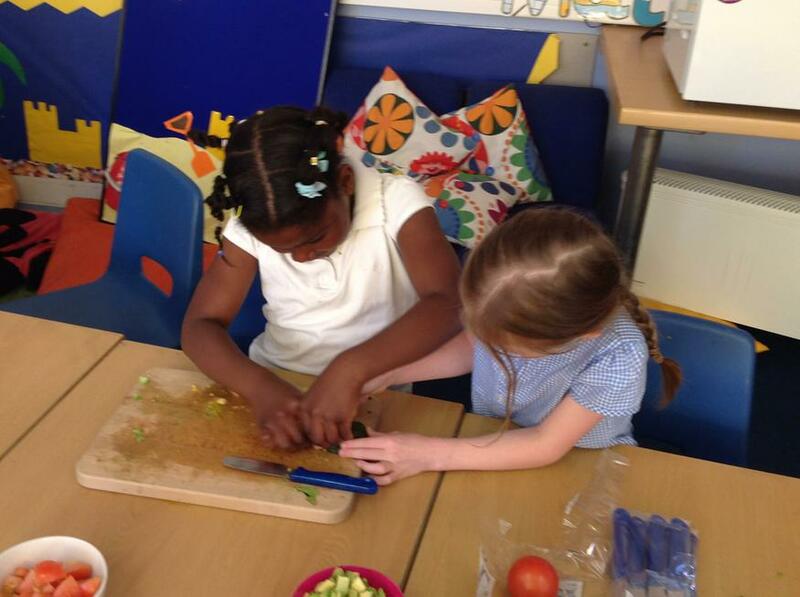 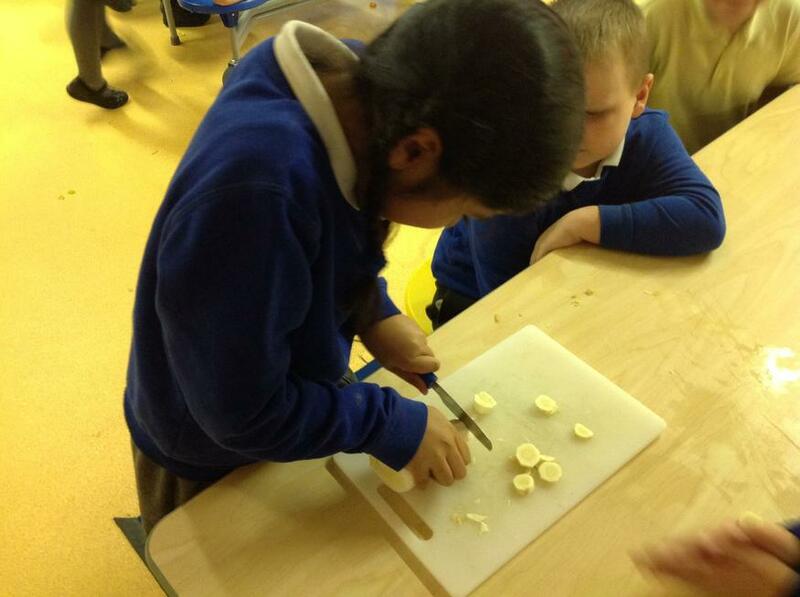 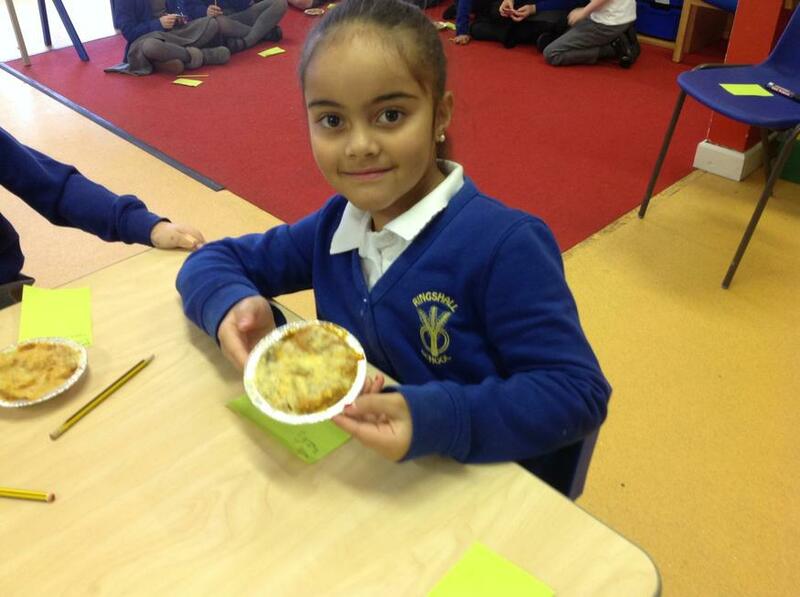 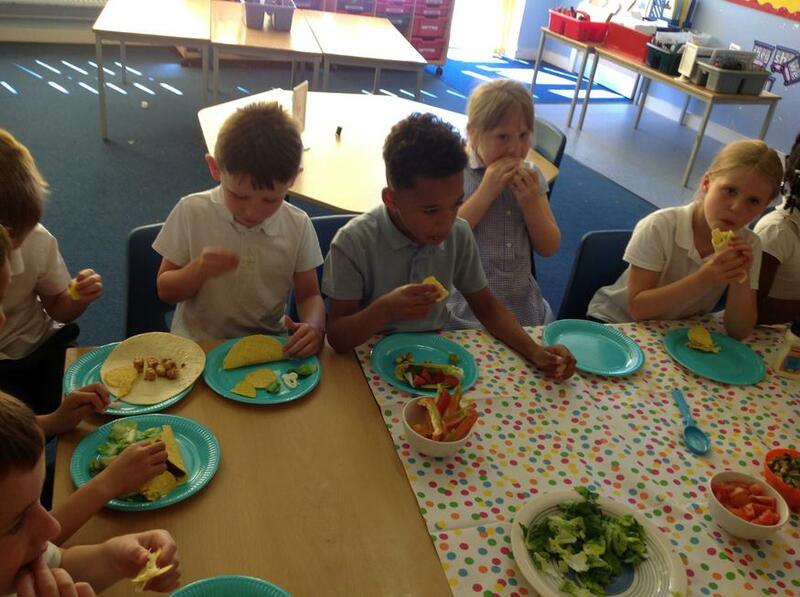 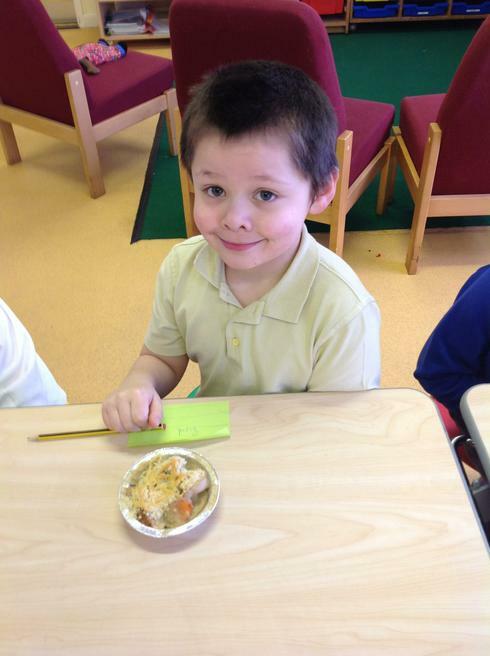 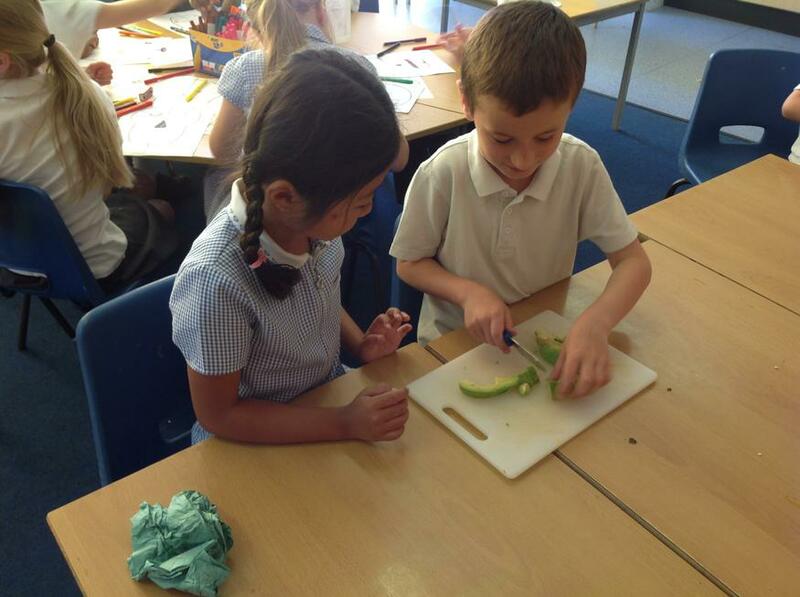 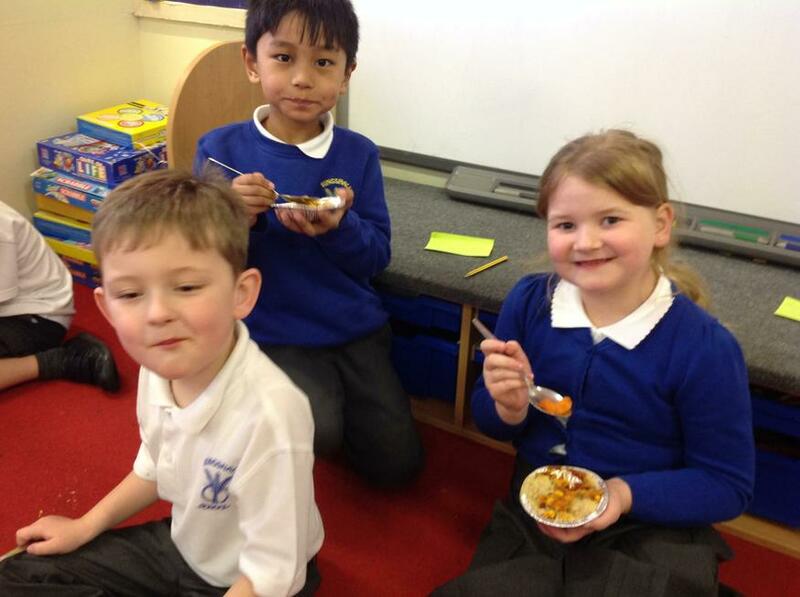 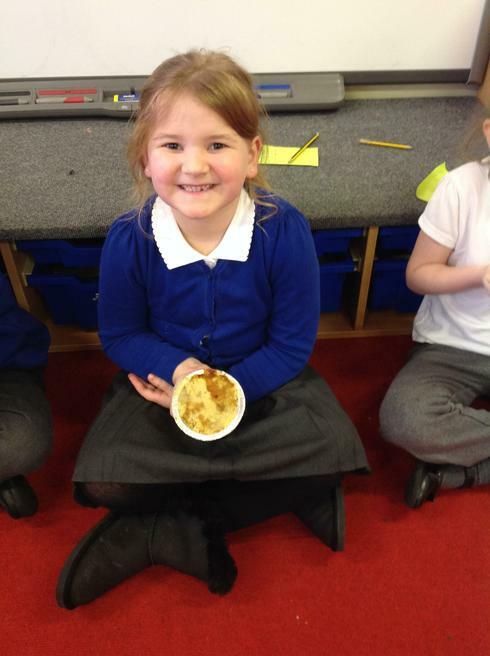 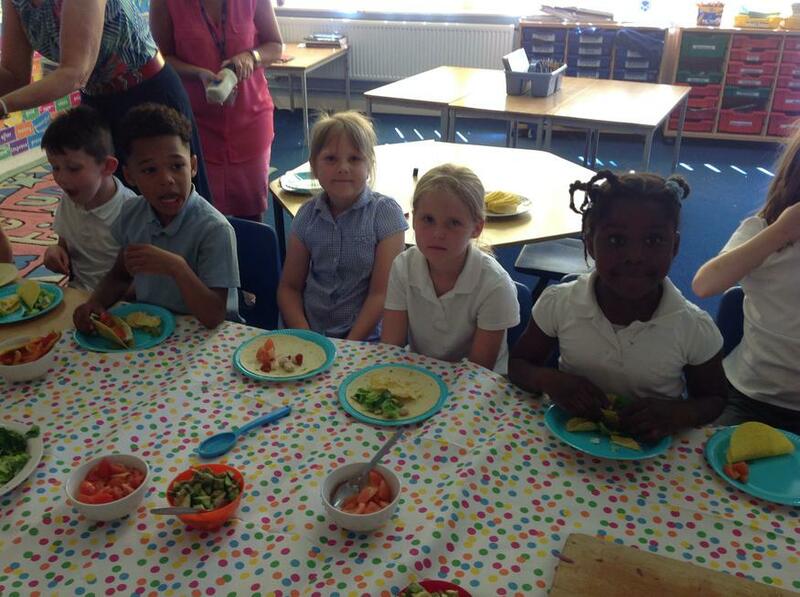 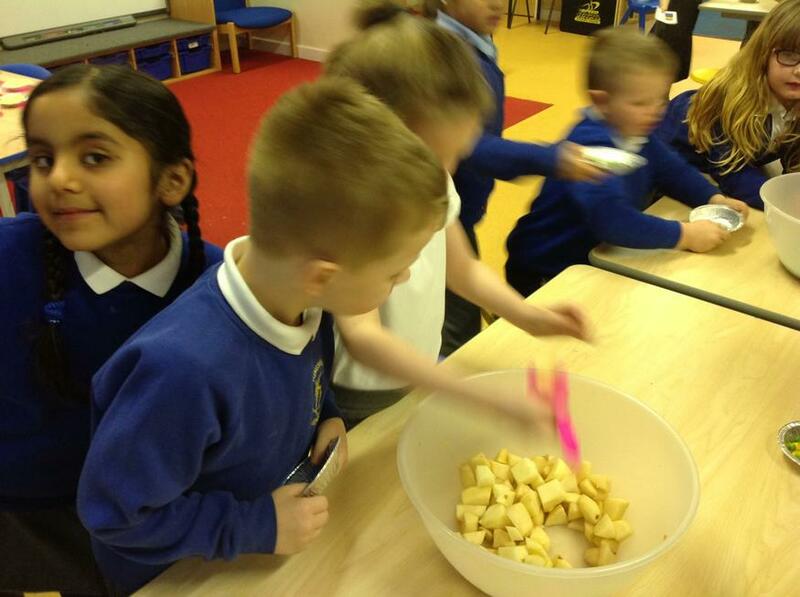 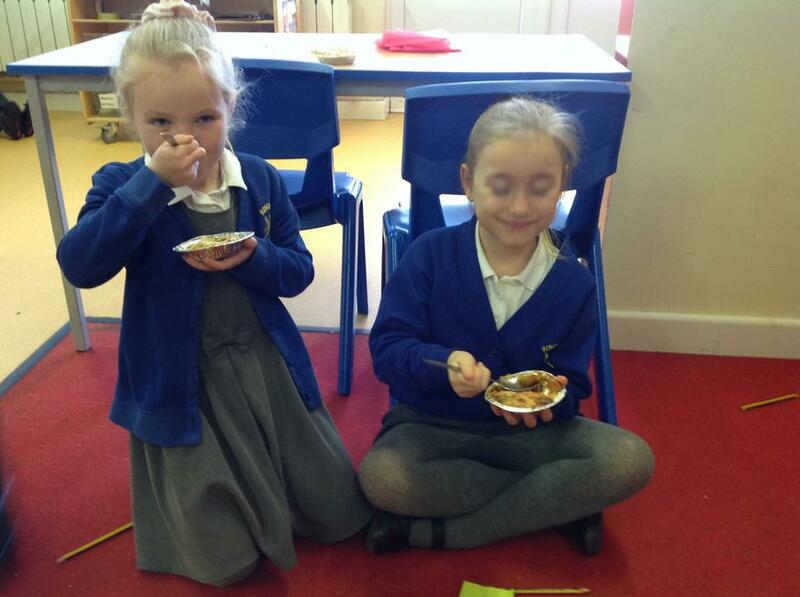 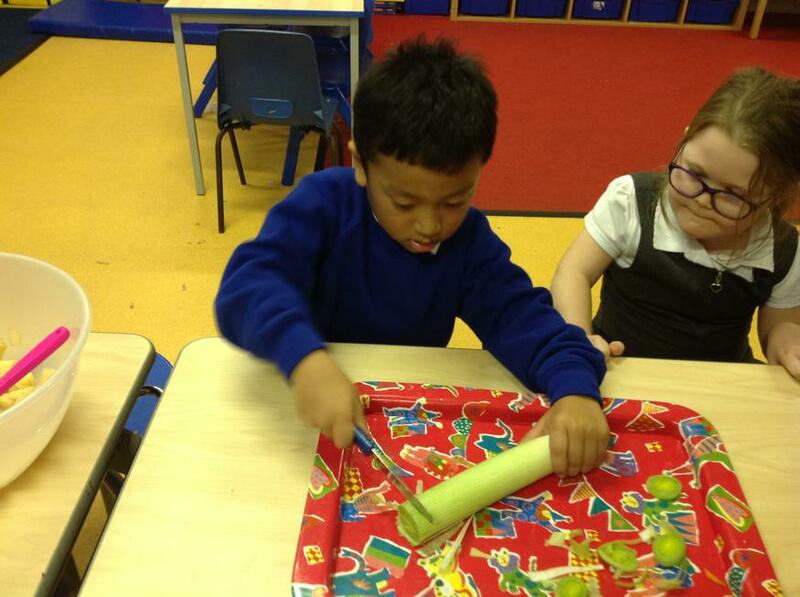 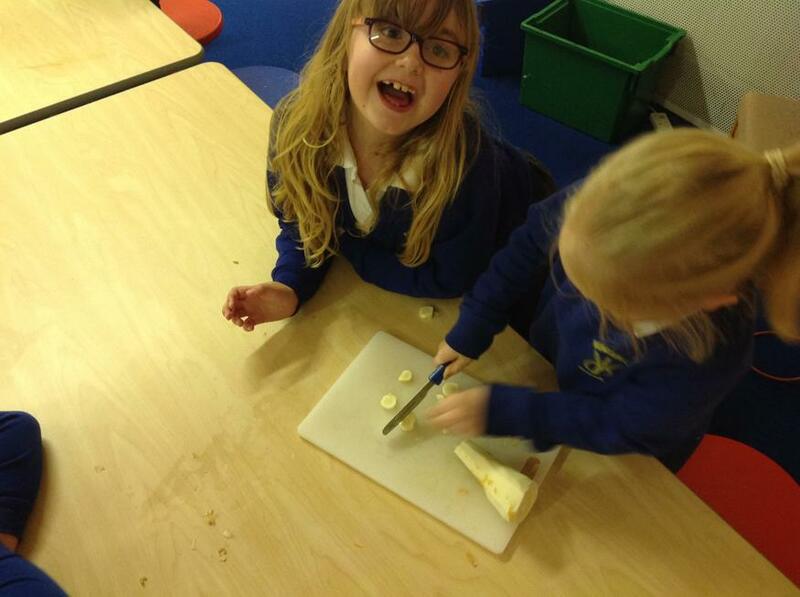 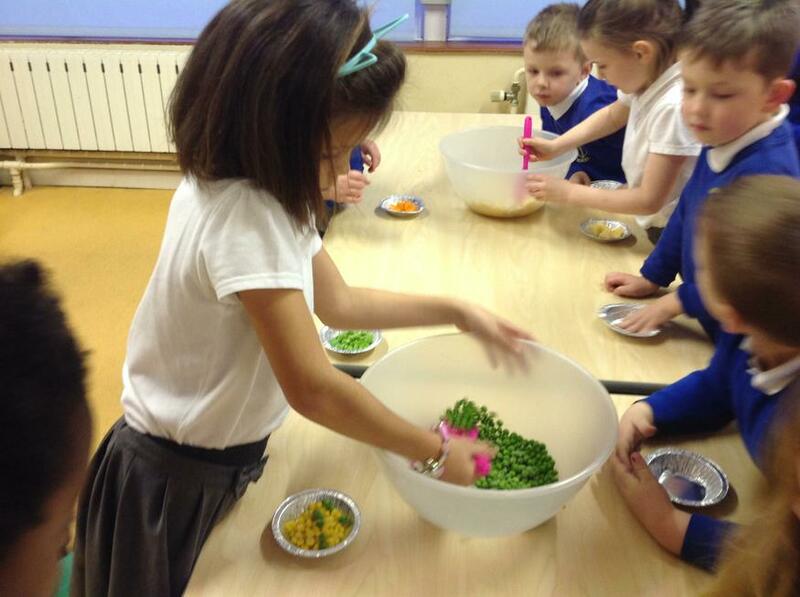 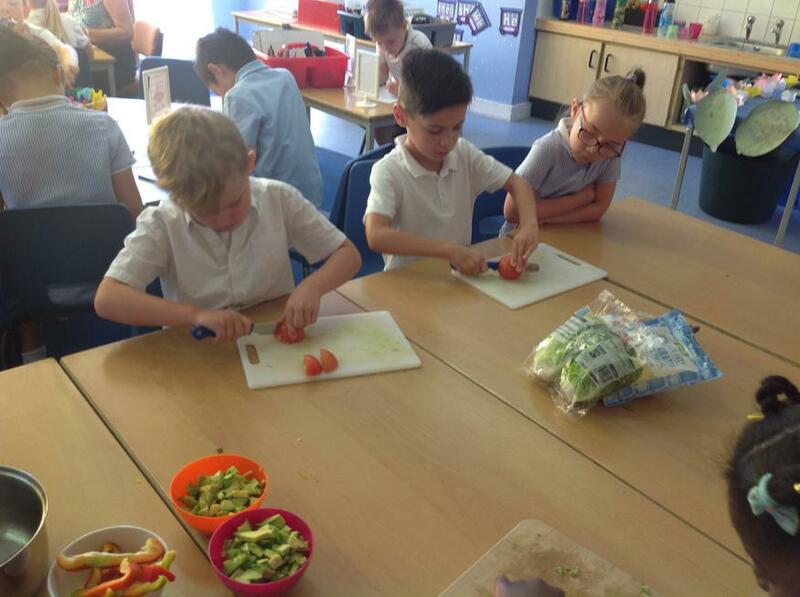 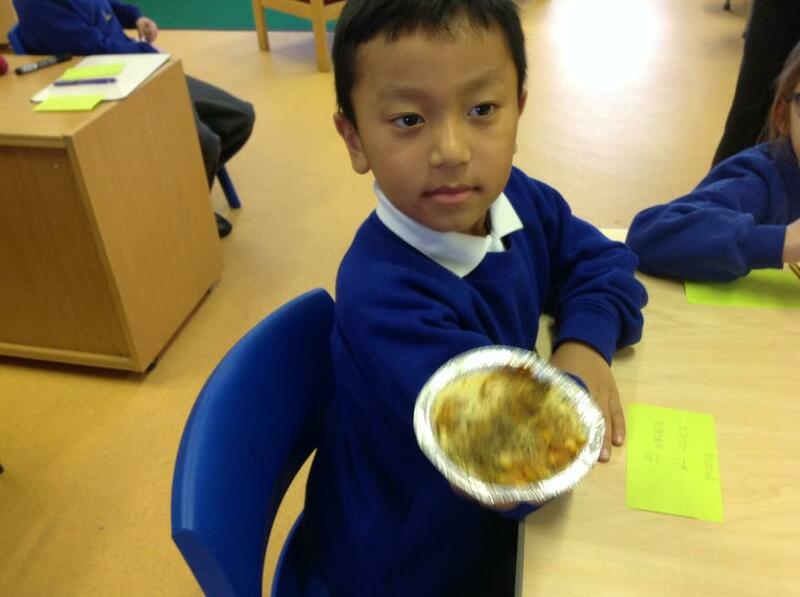 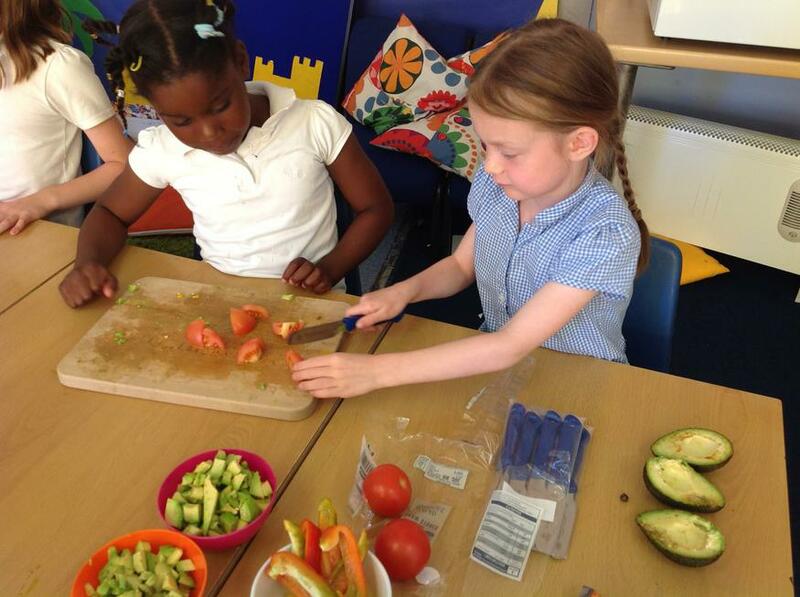 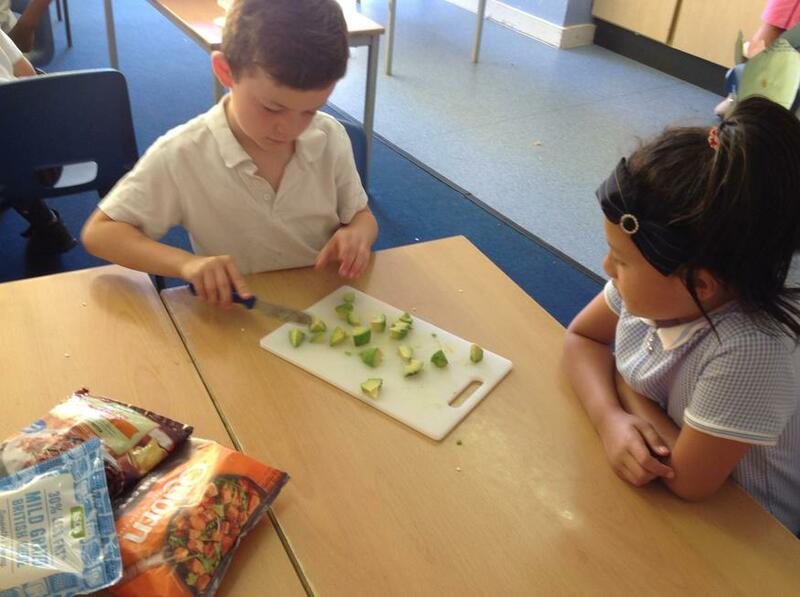 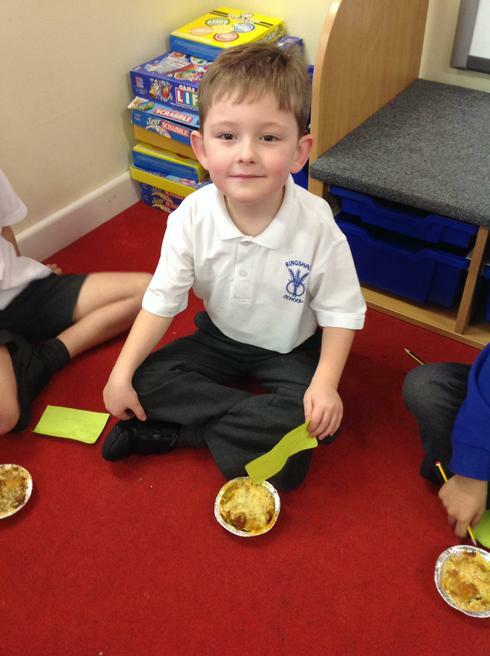 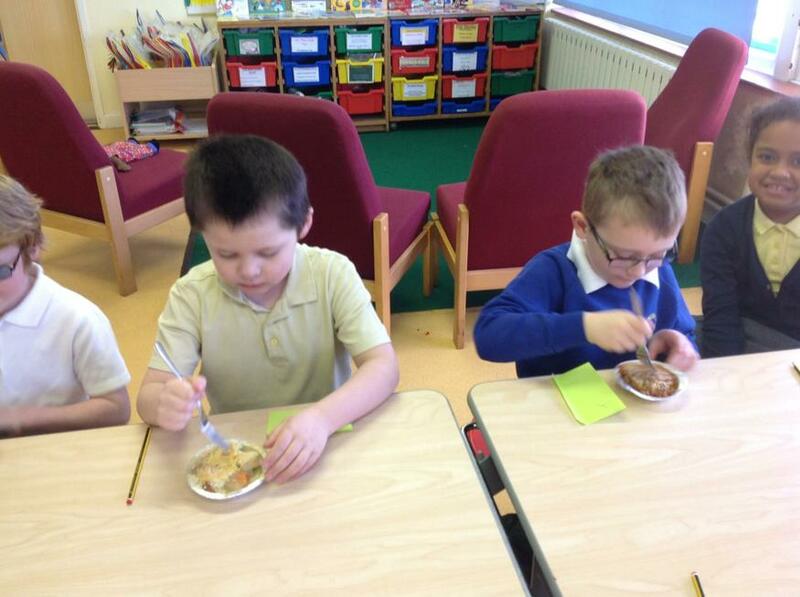 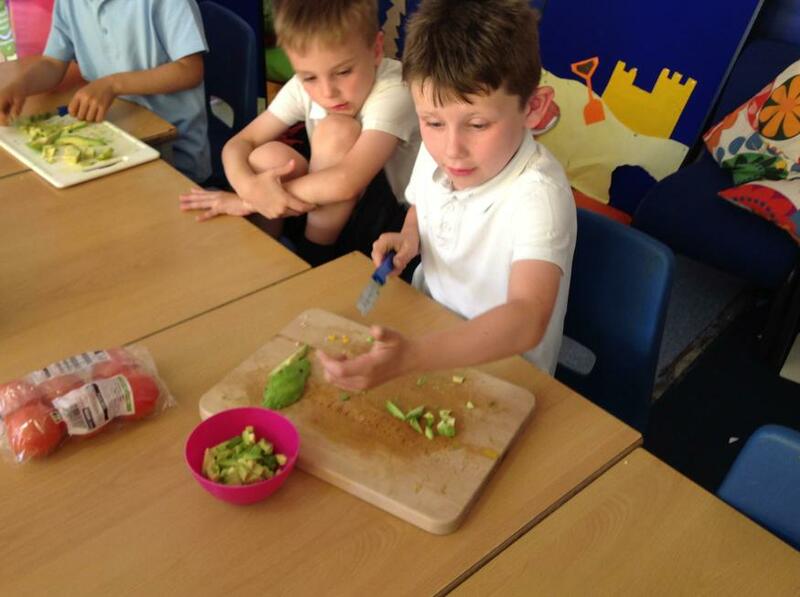 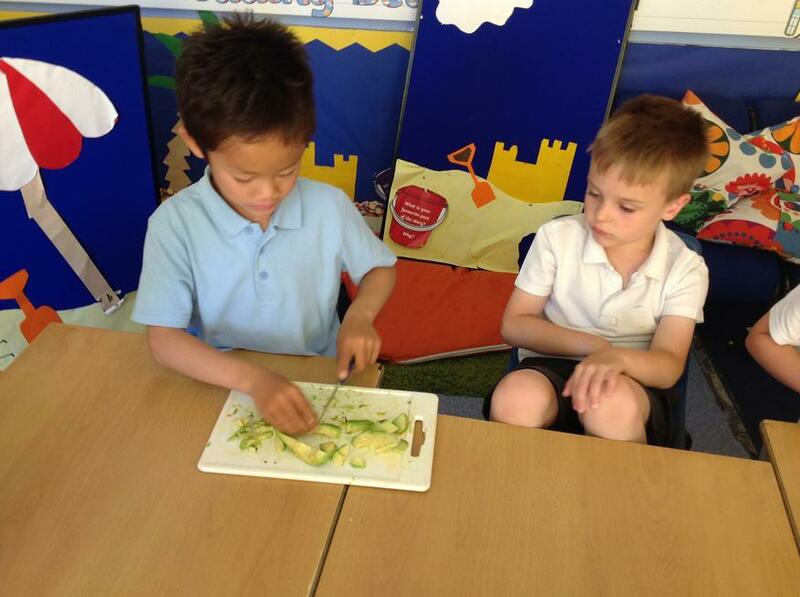 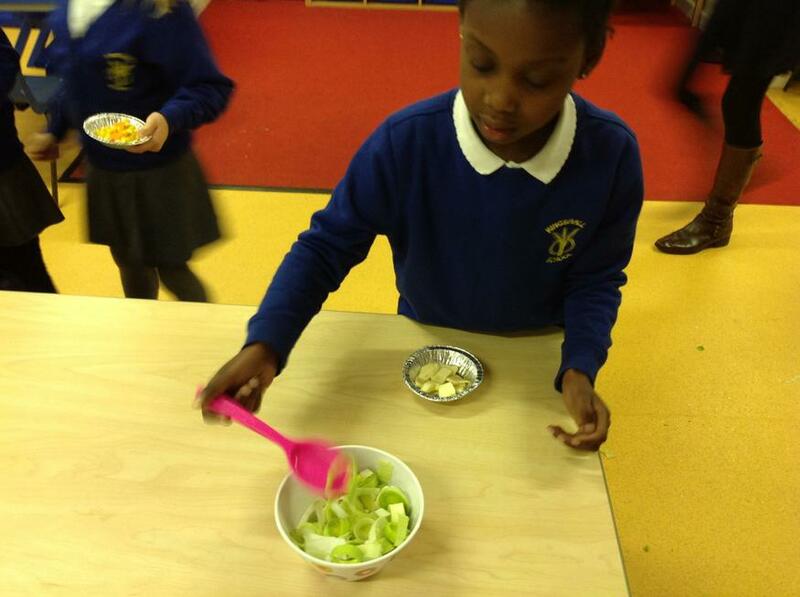 We planned and made our Gruffalo crumbles, carefully using the peelers and knifes to get our vegetables ready. 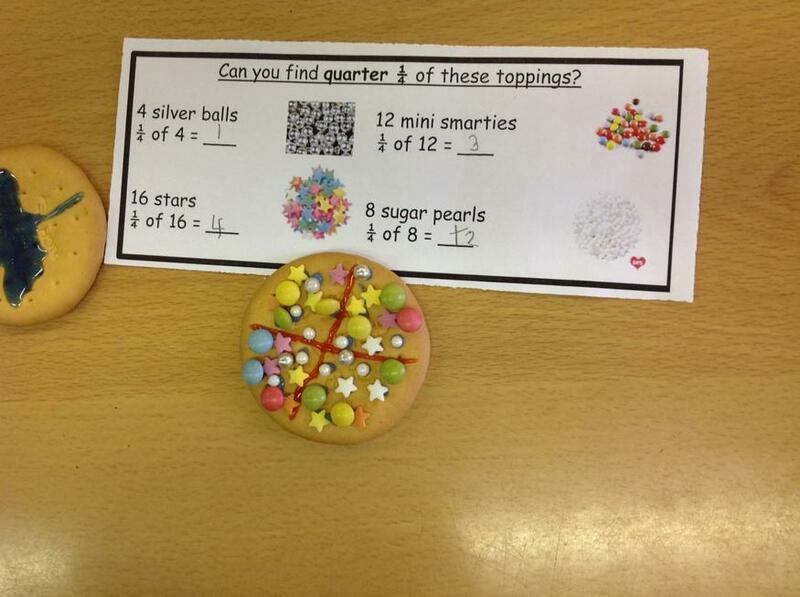 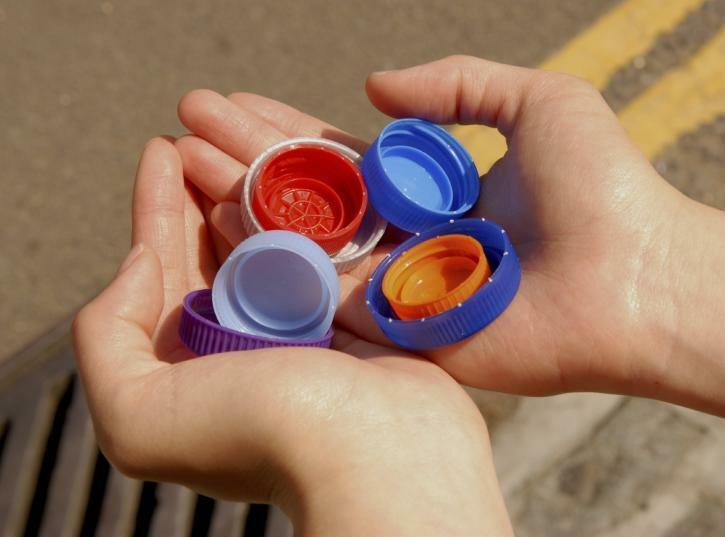 We then tasted them the next day! 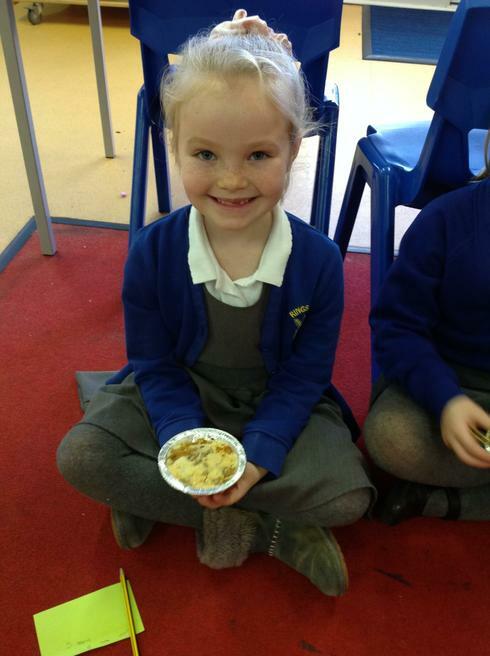 Do you think that you'd like to try a Gruffalo crumble? 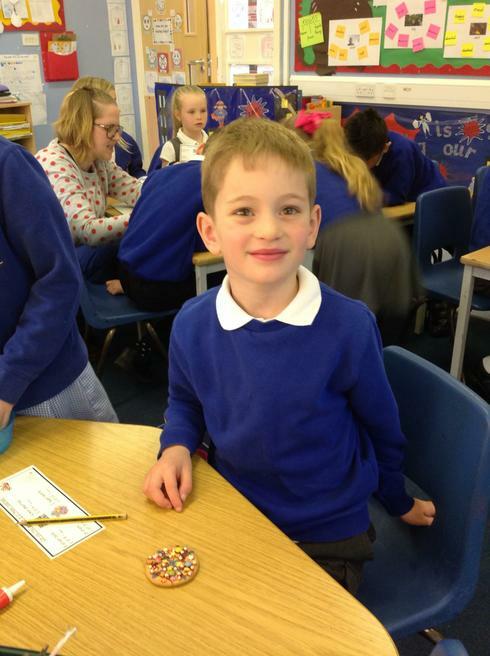 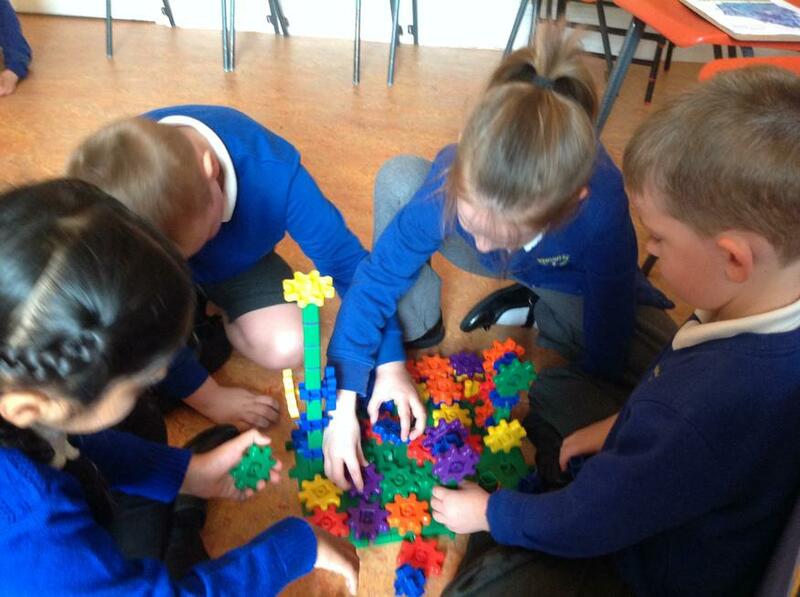 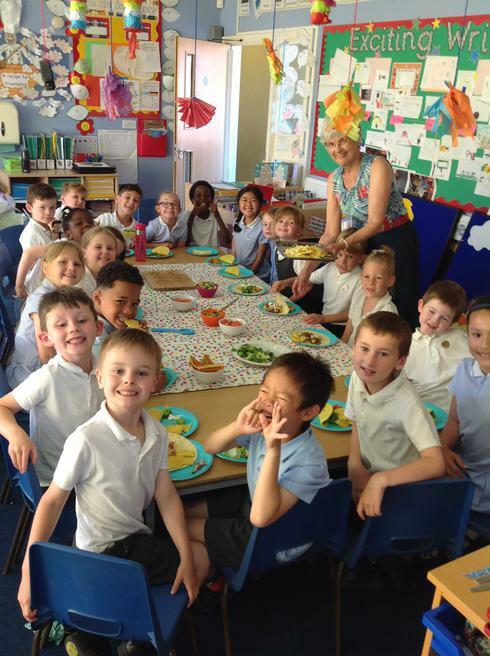 An exciting week in Yellow Class! 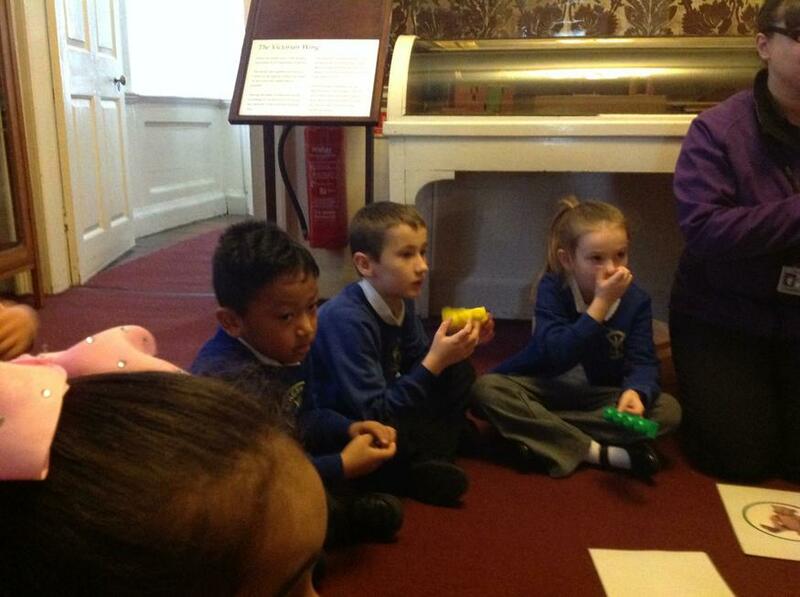 We have been very busy doing lots of exciting learning this week. 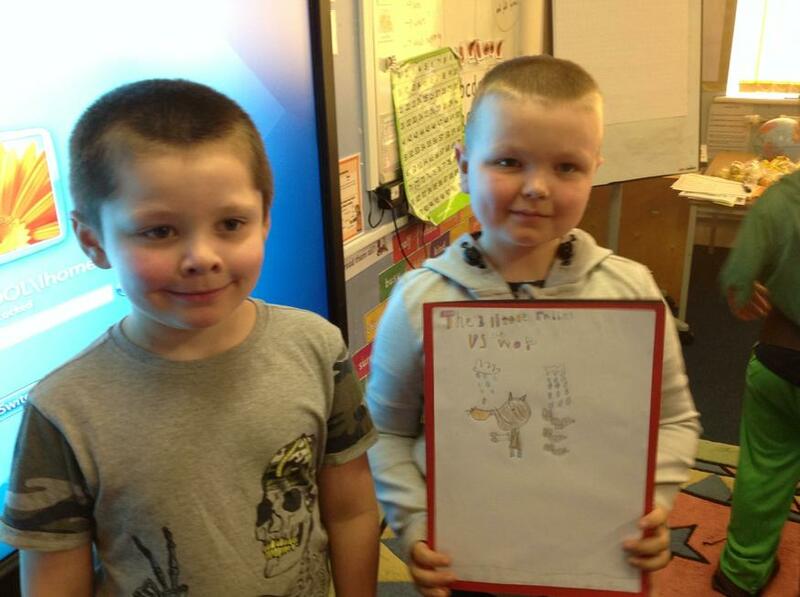 On Monday we received a letter from Molly Mouse asking for our help! 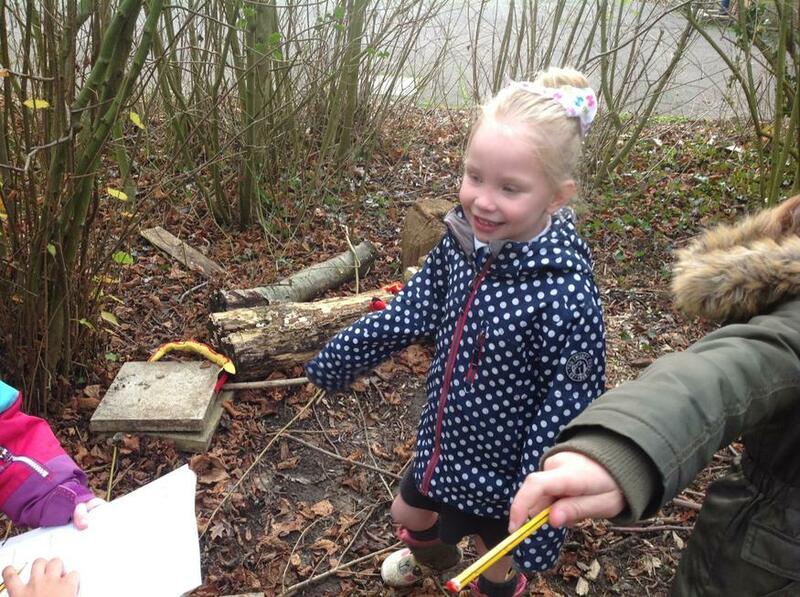 We went out to the woods to investigate what the creature scaring Molly could be. 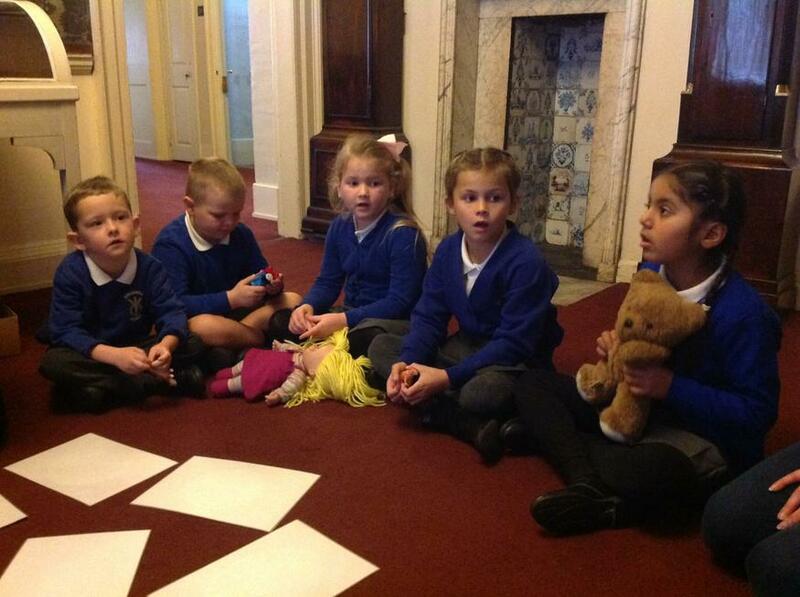 From the clues we decided that it was a Gruffalo! 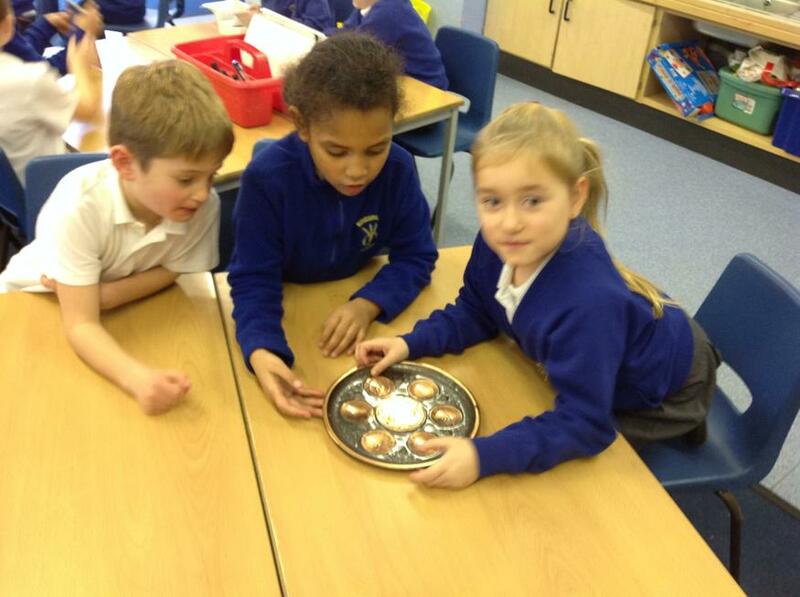 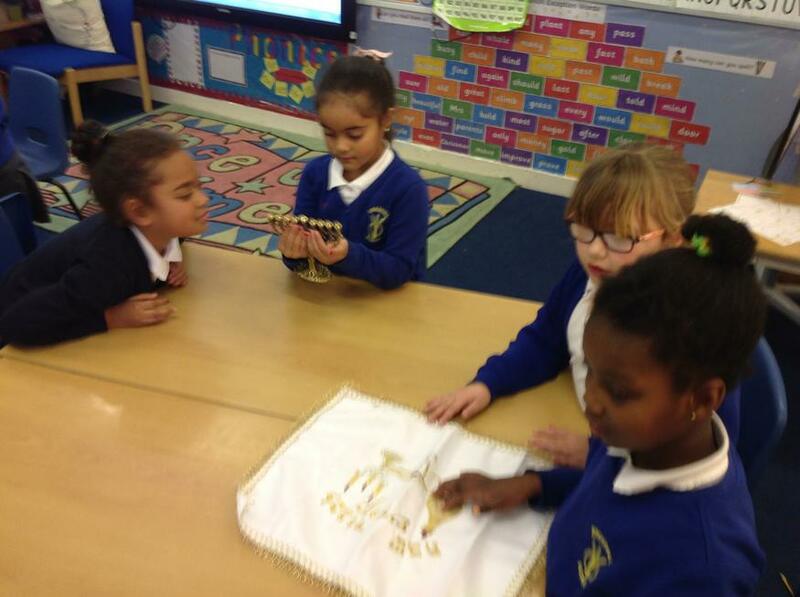 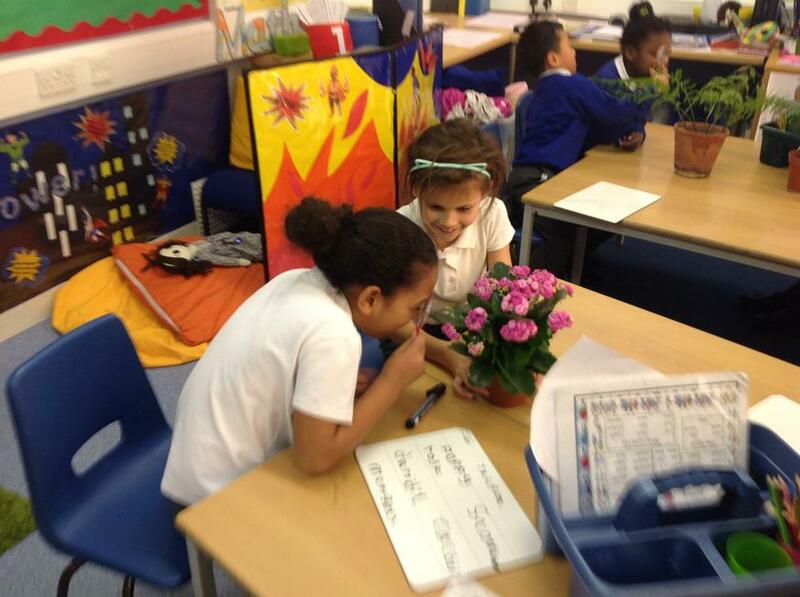 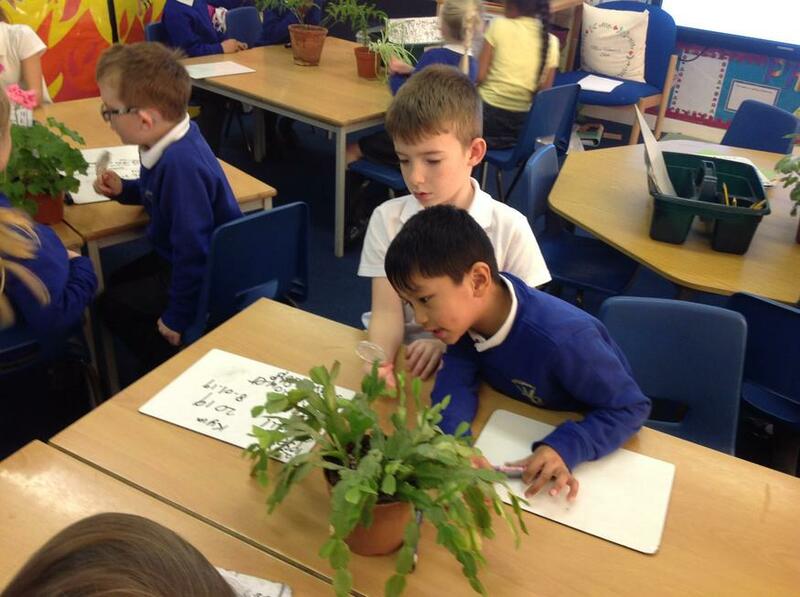 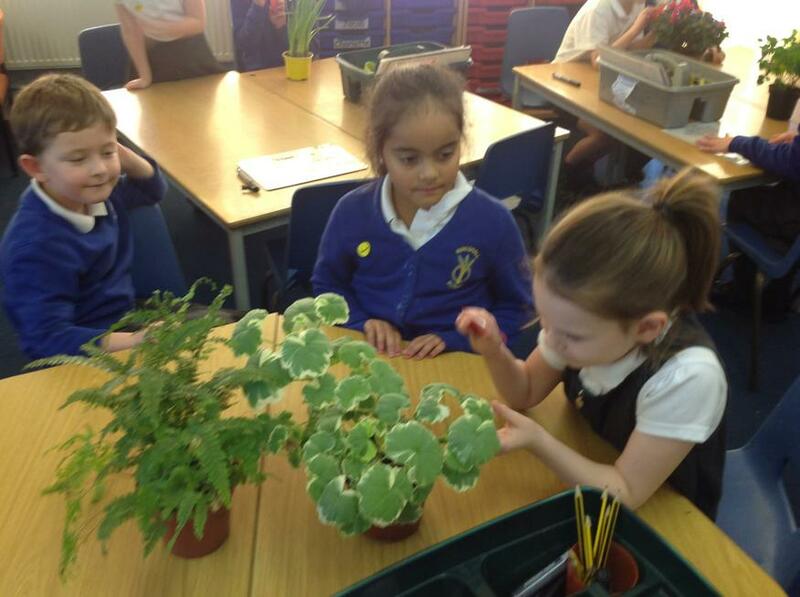 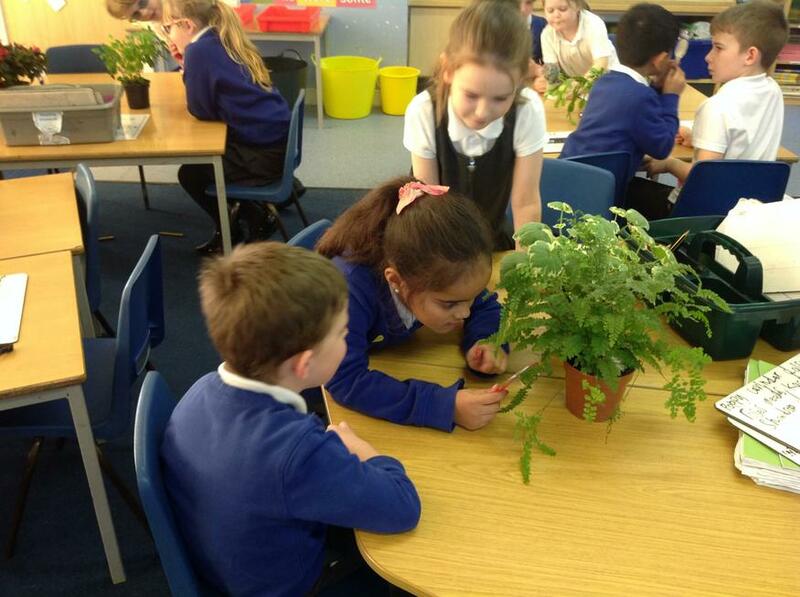 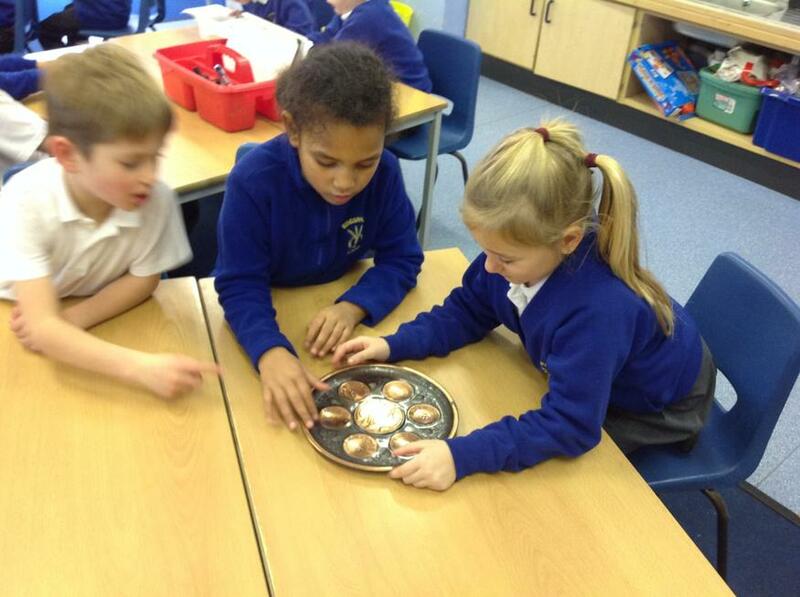 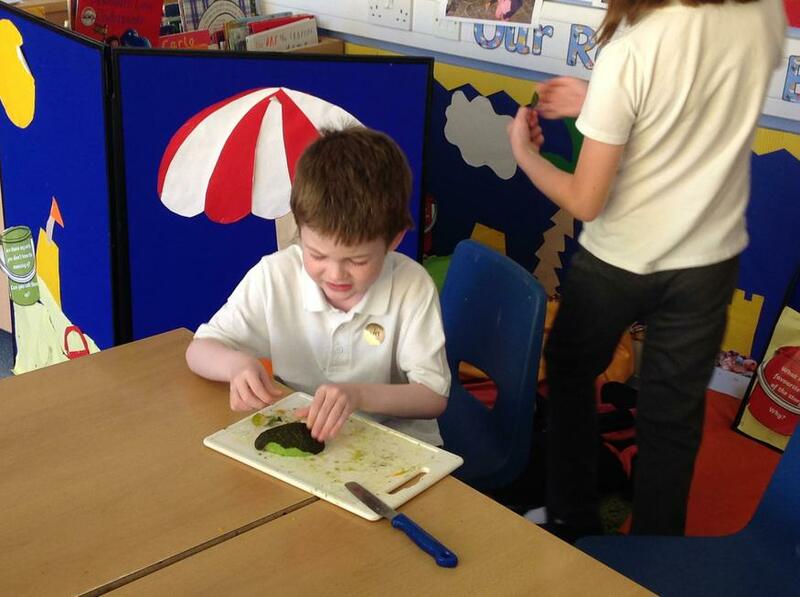 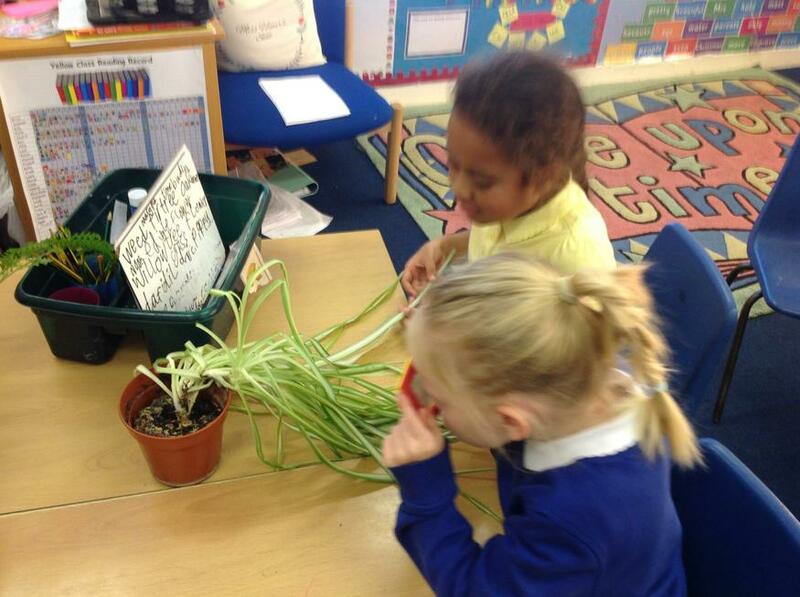 As well as this, we closely observed some plants in Science and in RE looked at a range of items linked to Judaism. 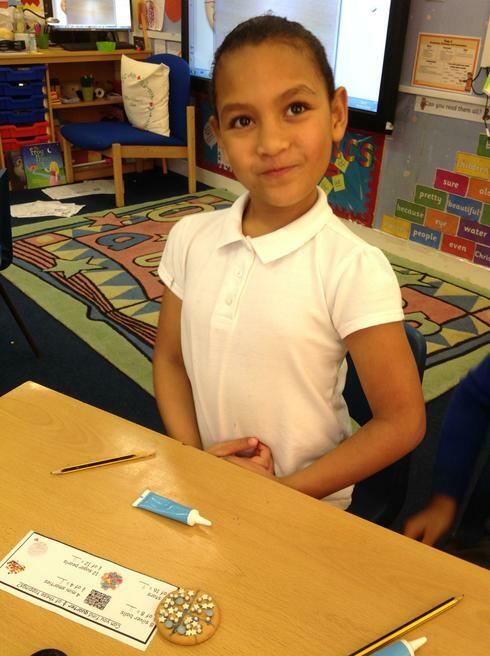 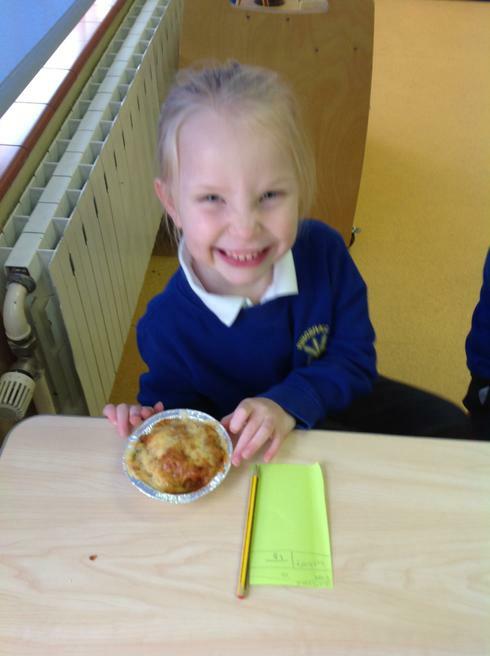 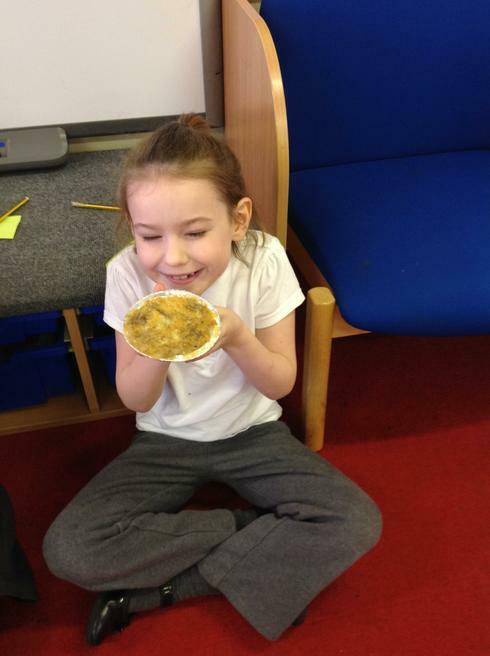 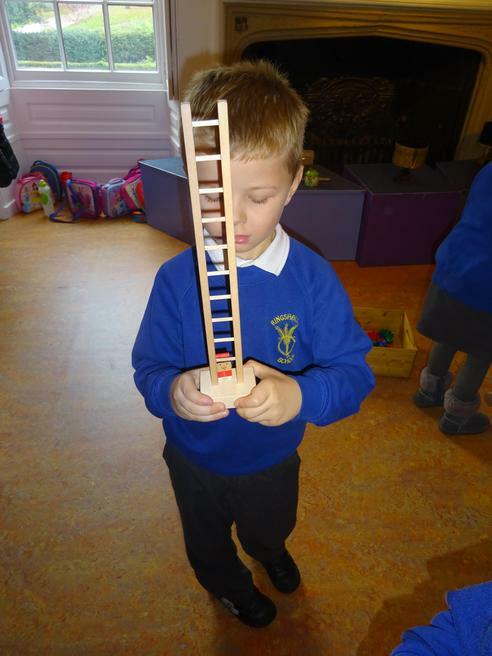 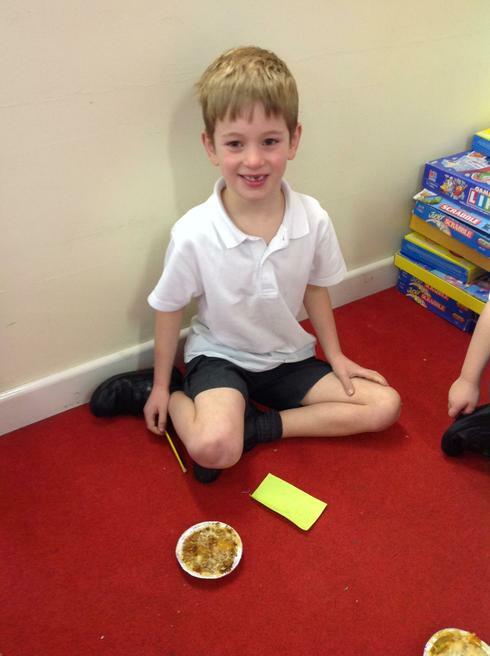 Please enjoy the photos of our learning! 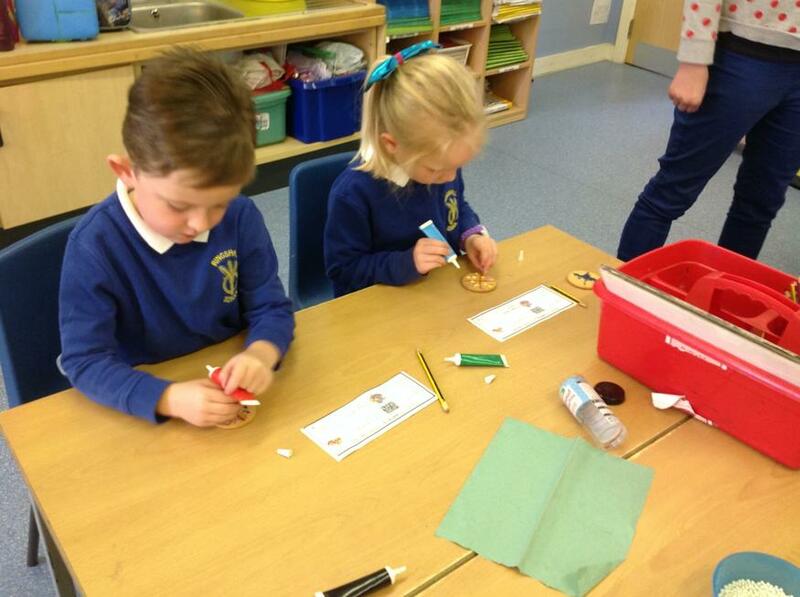 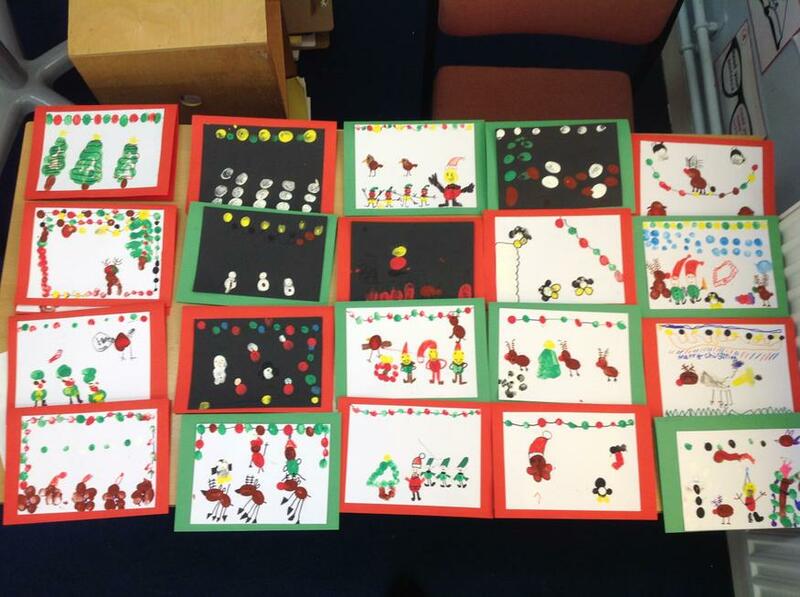 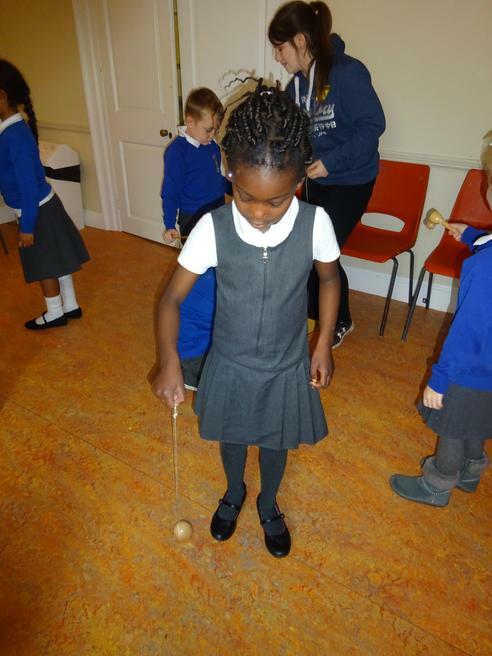 Before the holidays we had lots of fun at Ringshall preparing for Christmas. 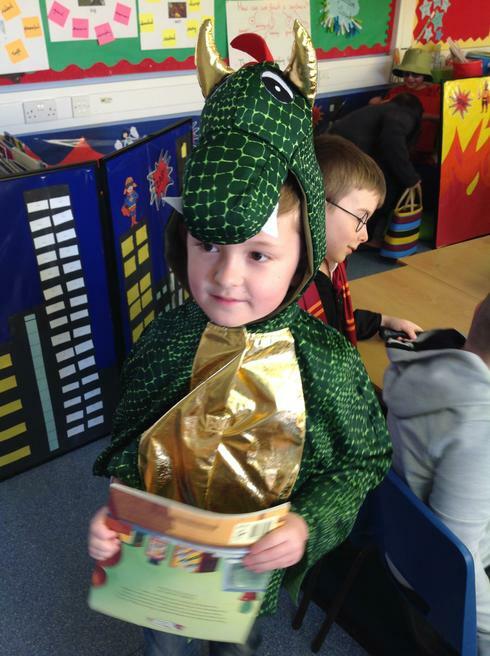 The children in Years 1 and 2 were fantastic in our school play! 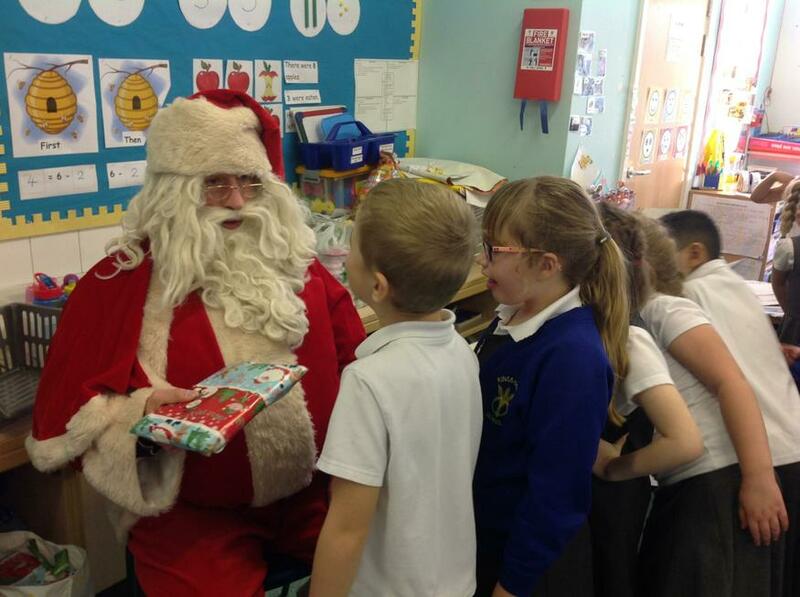 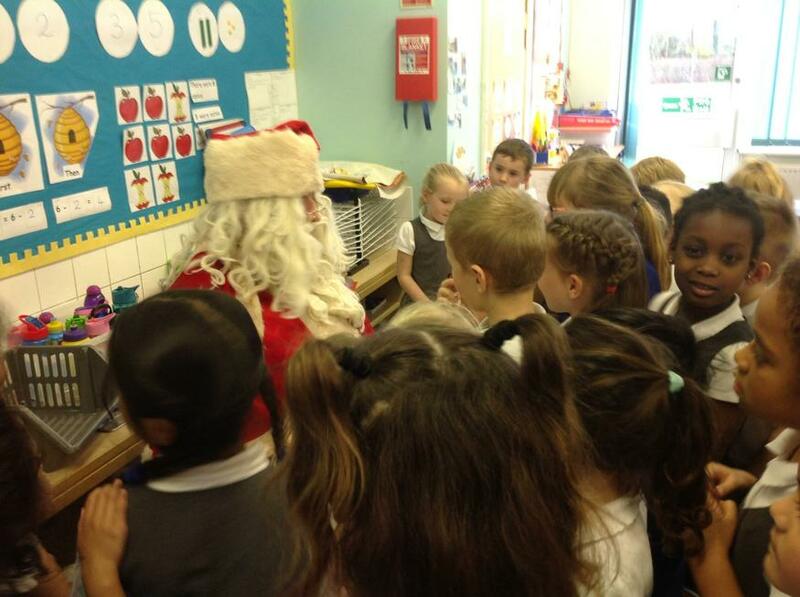 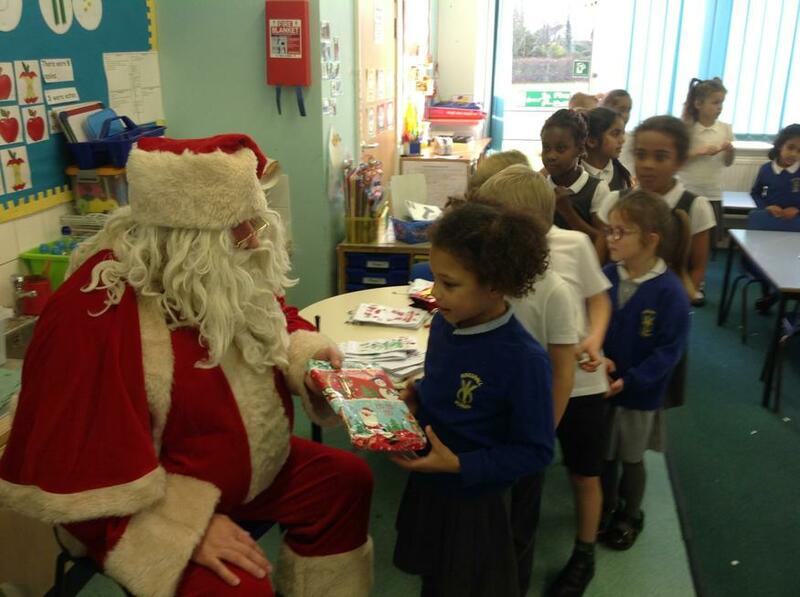 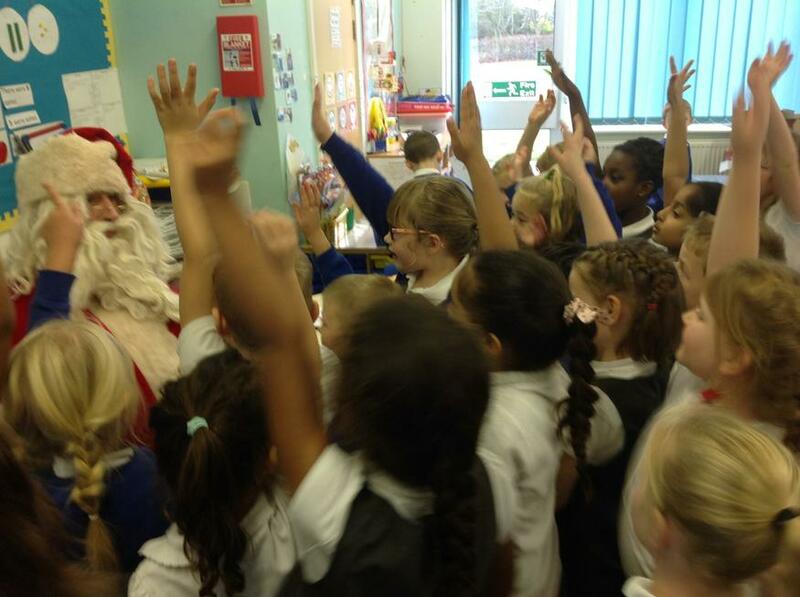 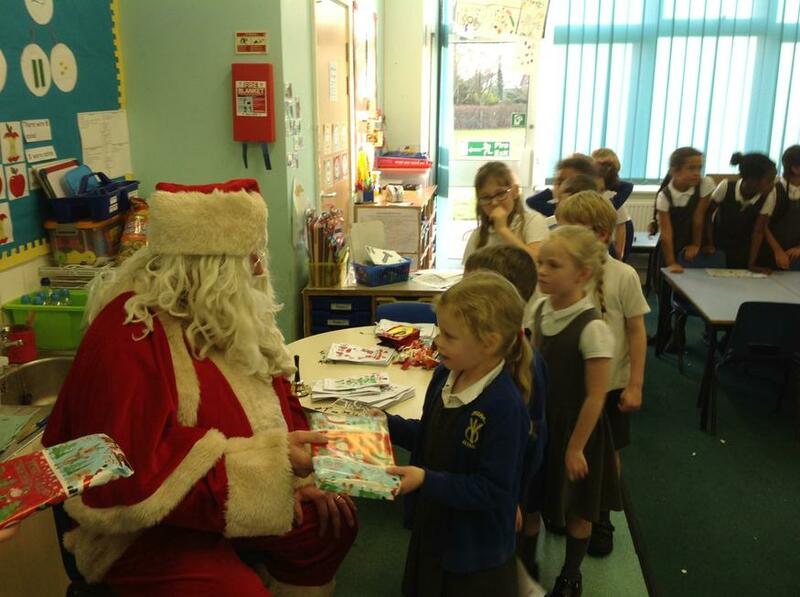 As a treat to celebrate our fantastic performance, we enjoyed a class party and even got a visit from Santa. 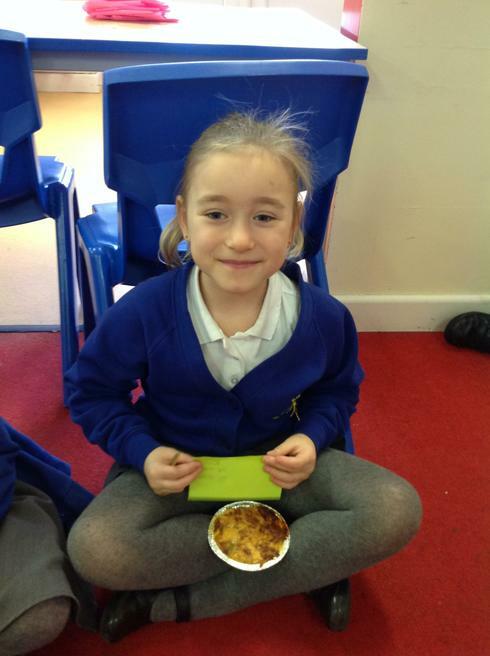 We hope that you enjoy these pictures. 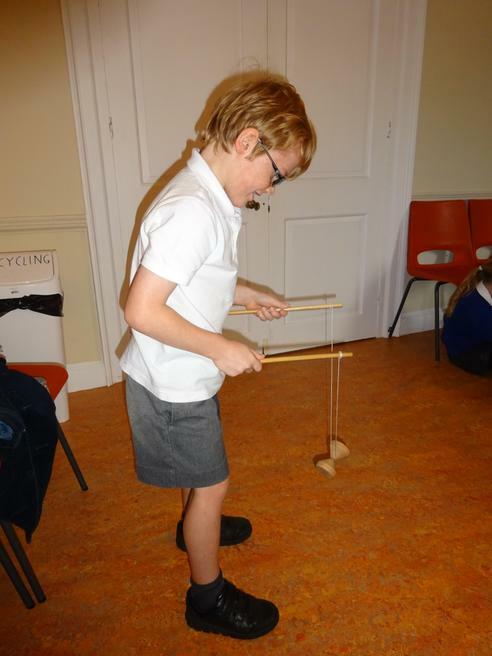 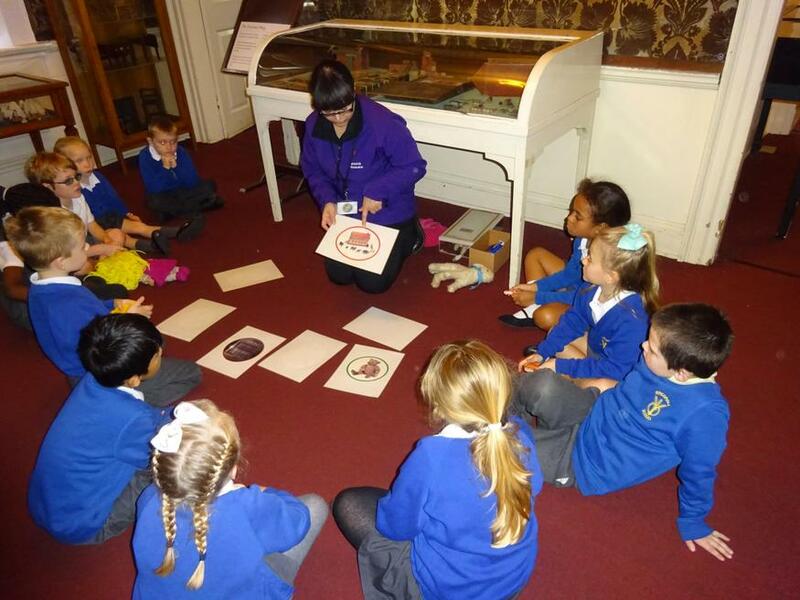 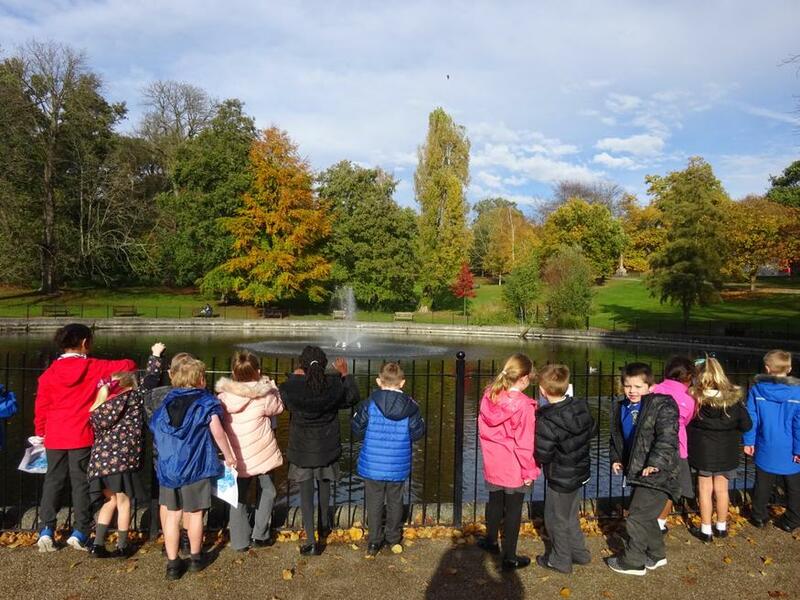 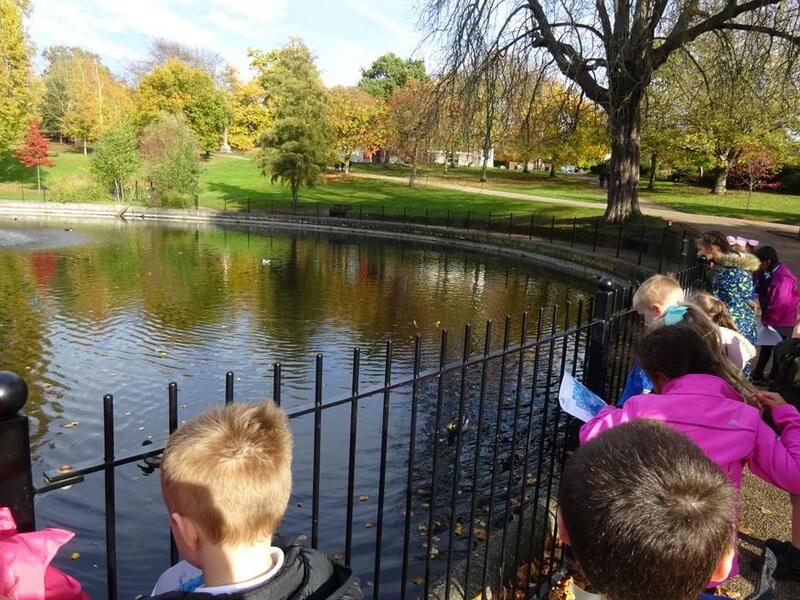 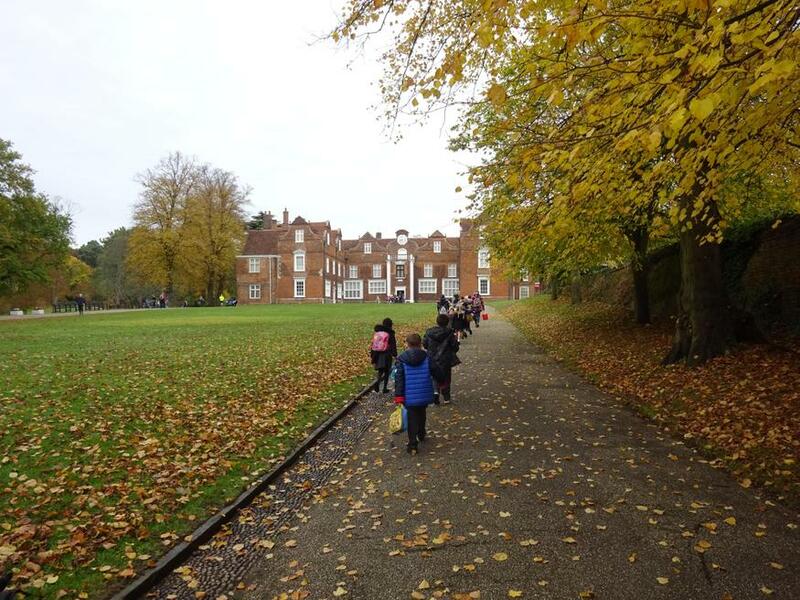 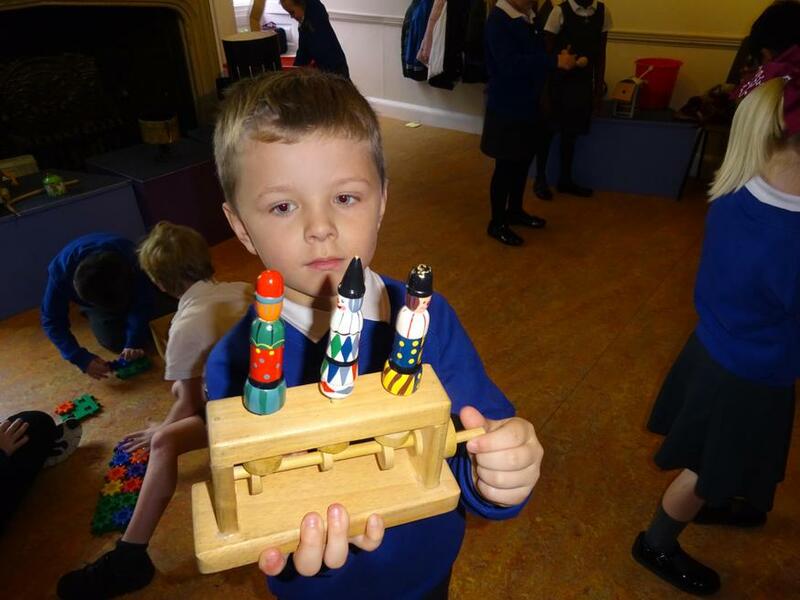 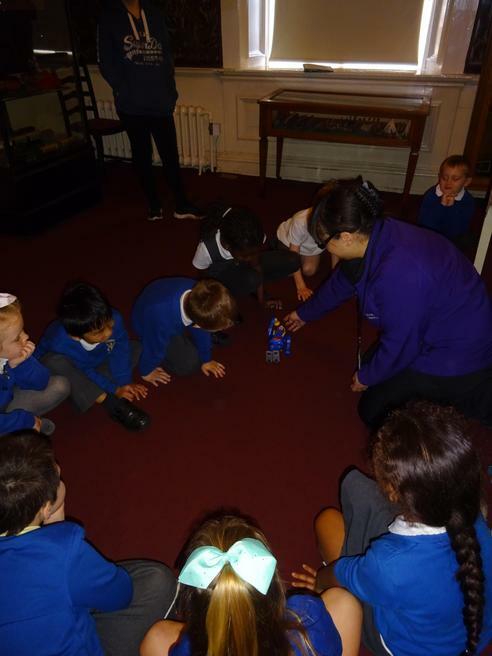 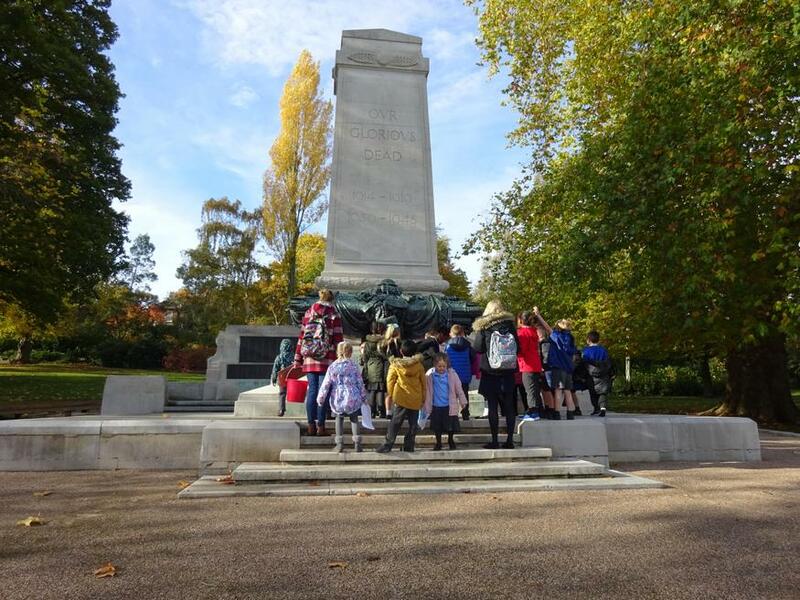 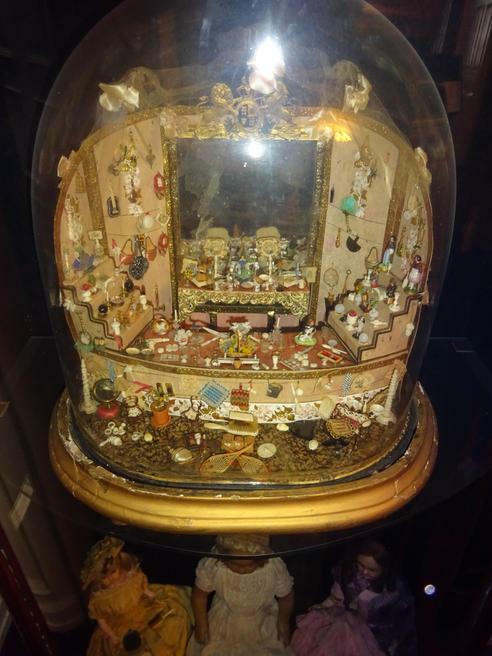 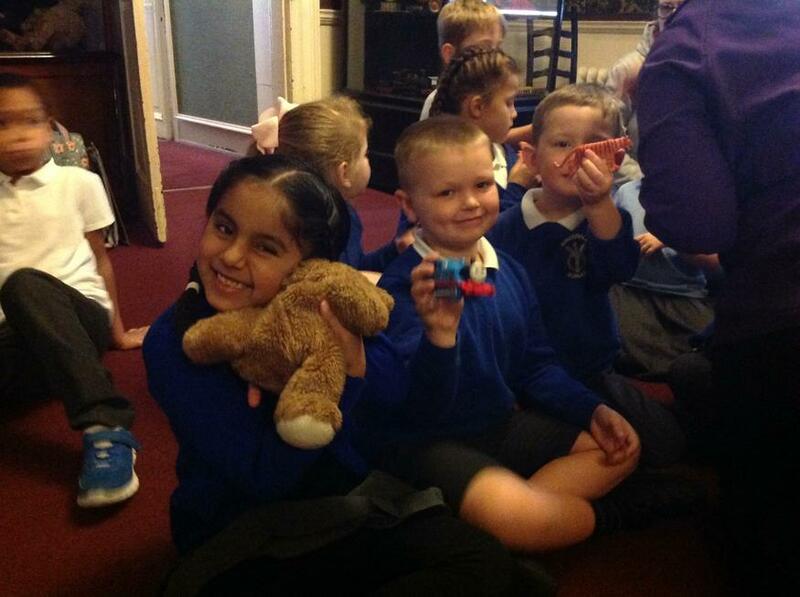 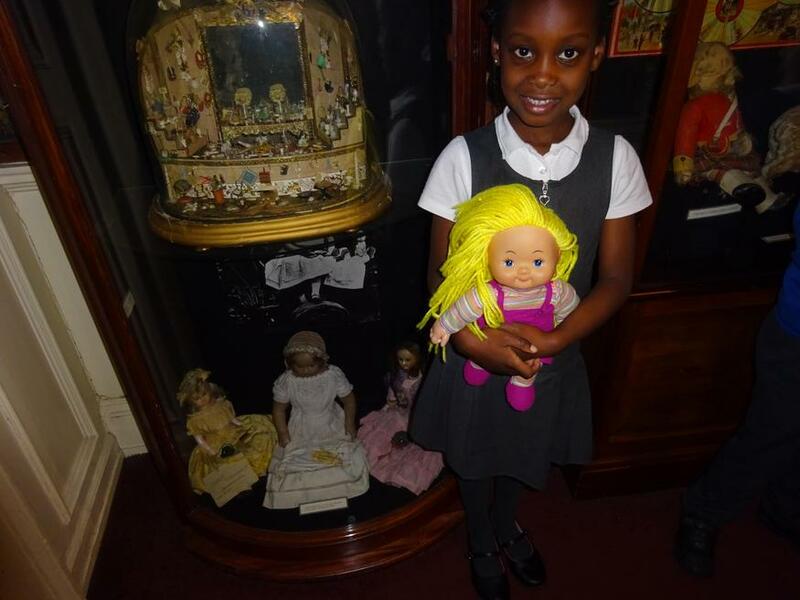 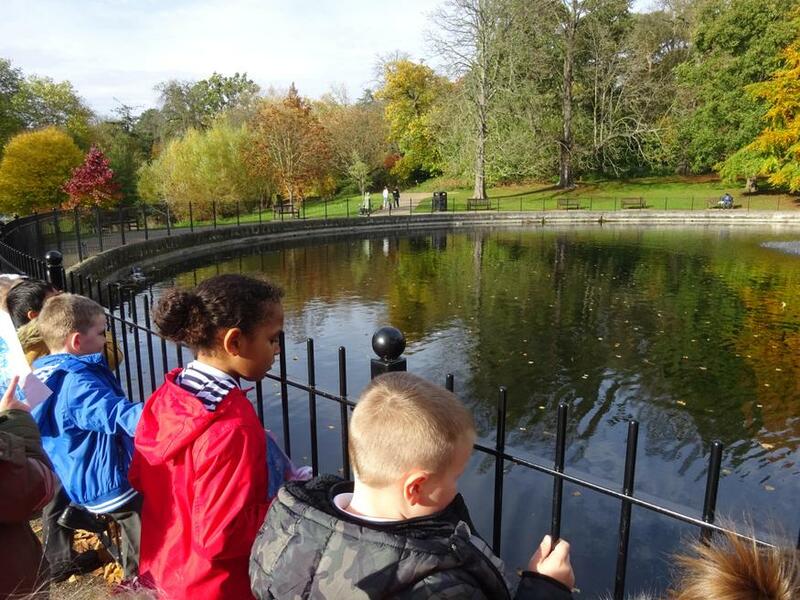 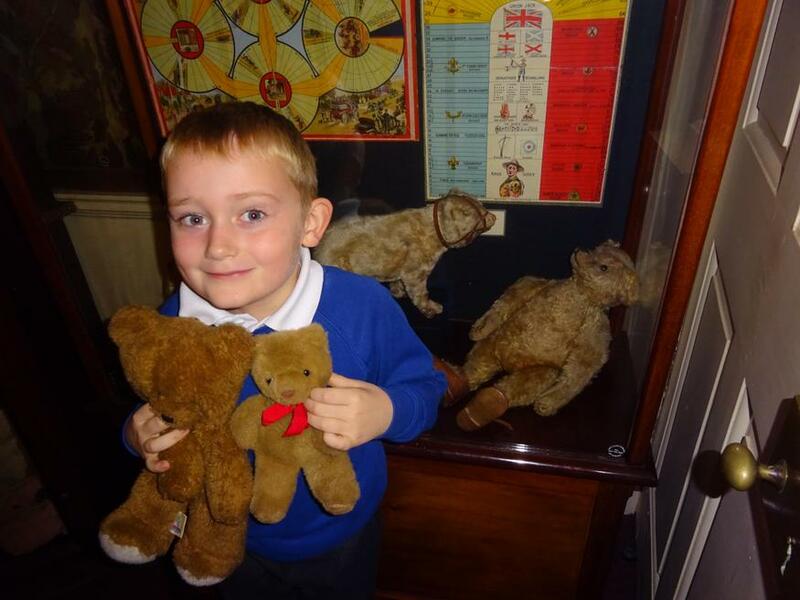 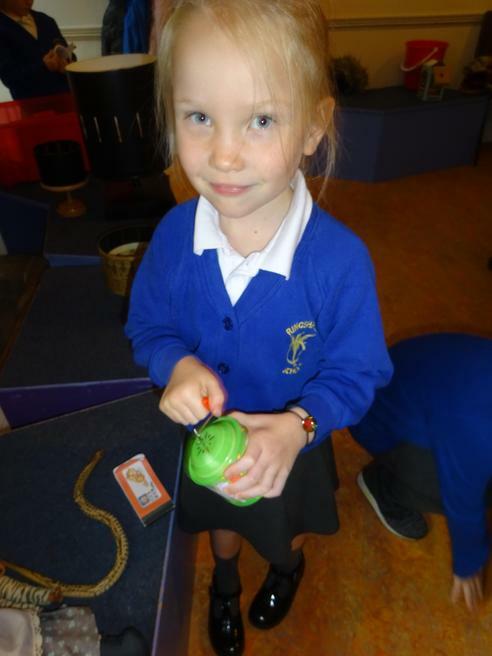 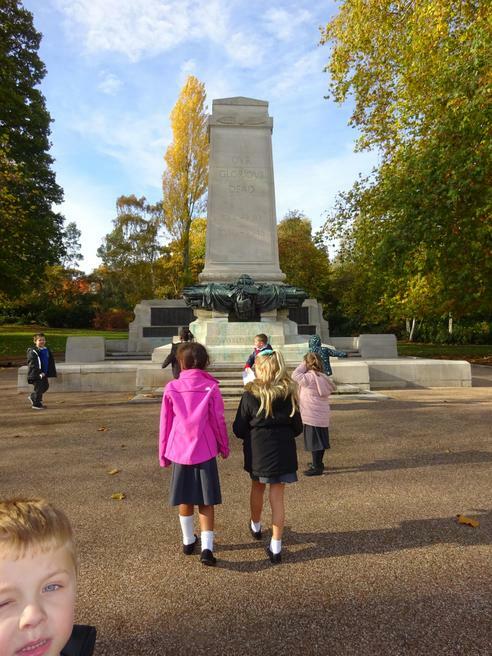 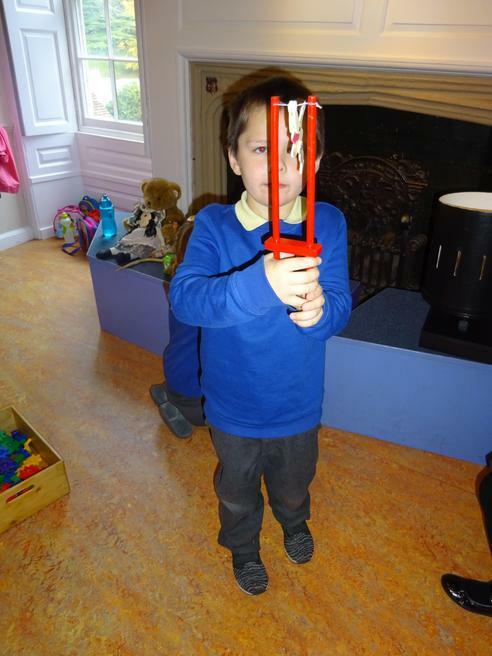 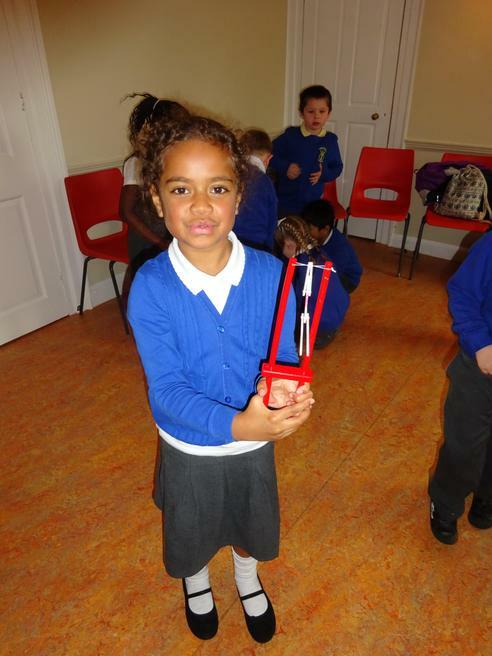 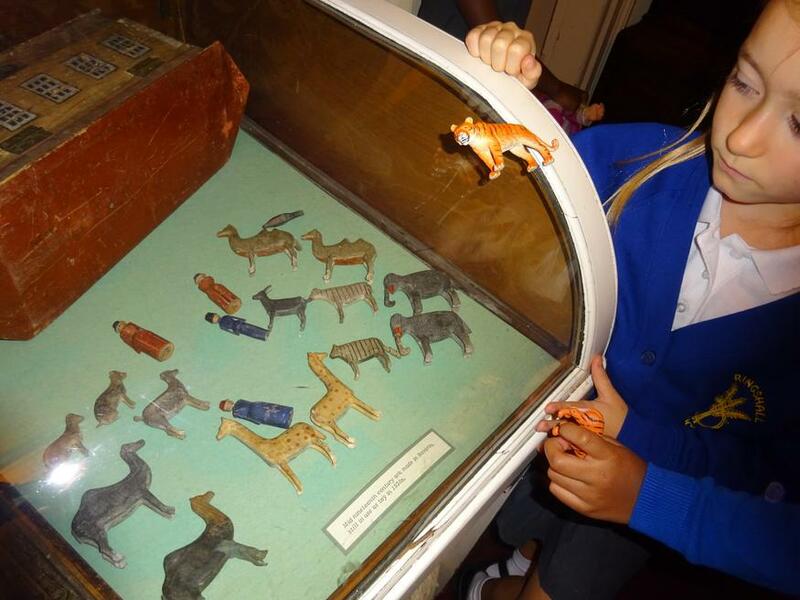 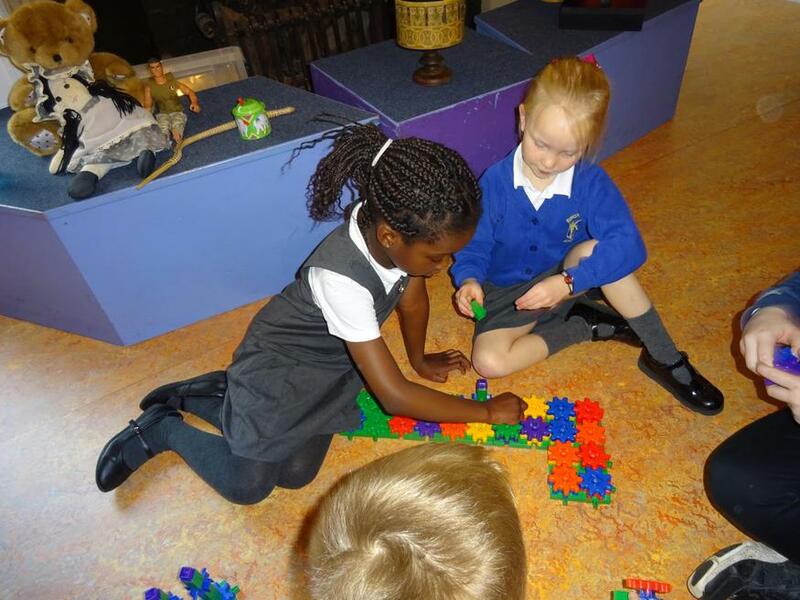 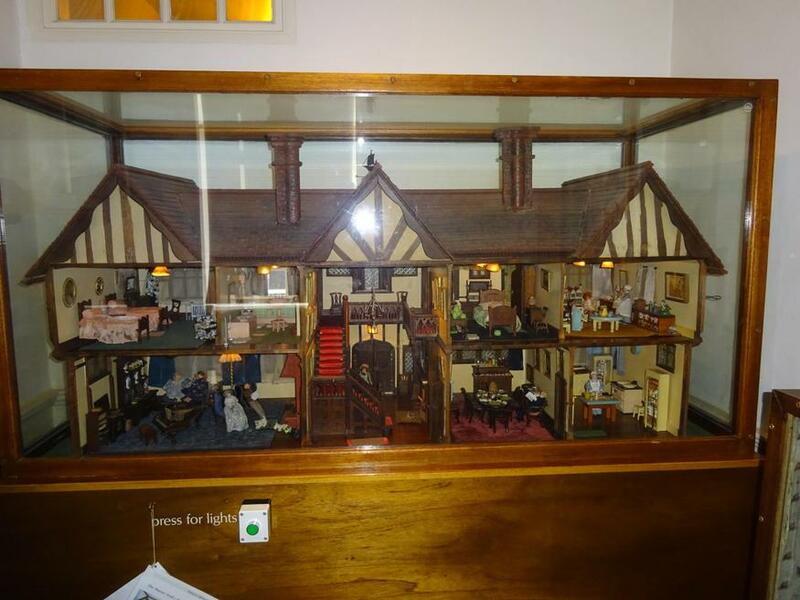 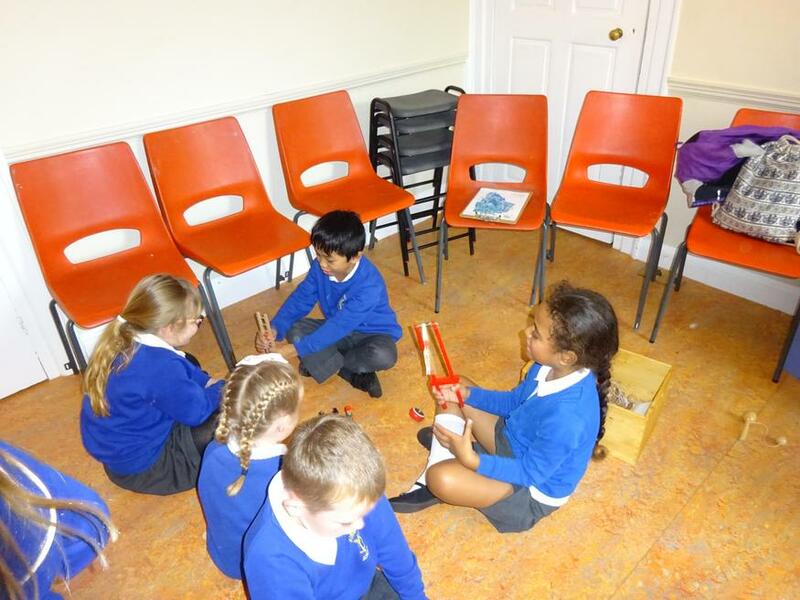 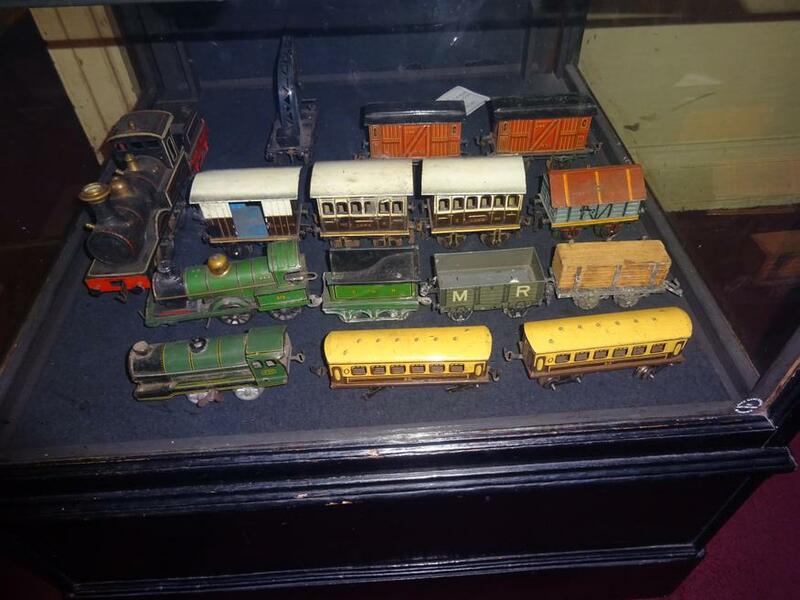 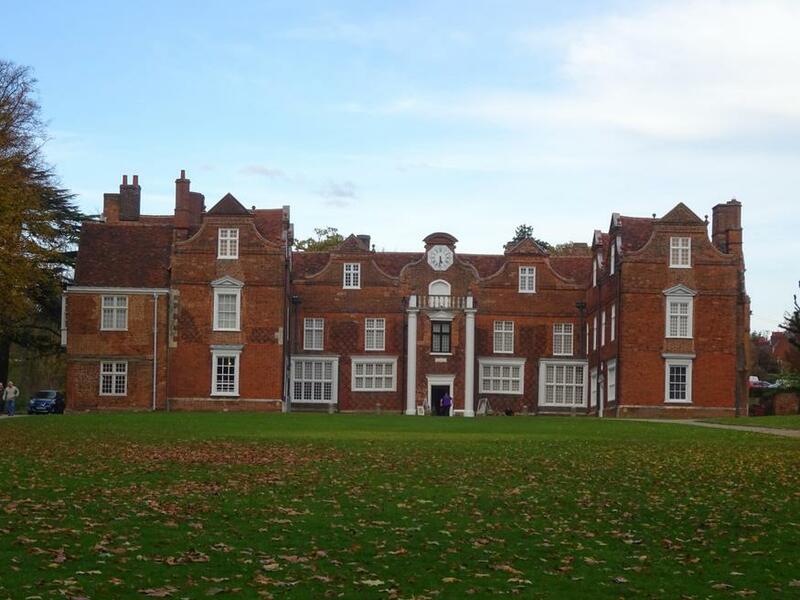 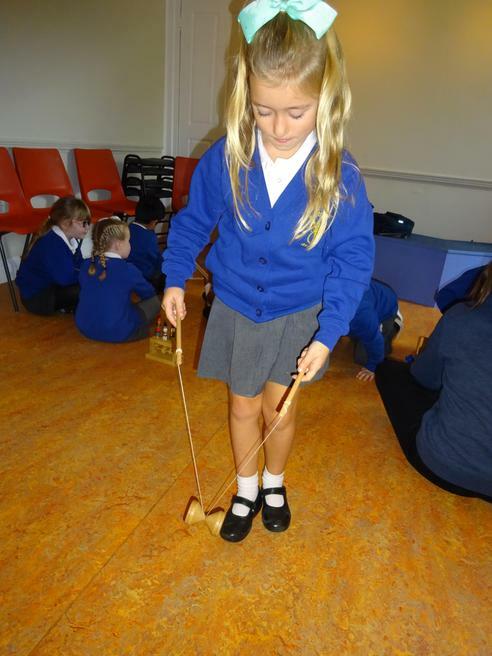 The children in Orange and Yellow class had a fantastic time learning about old toys at Christchurch Mansion this week and also enjoyed finding their way around the park, using our maps to help us. 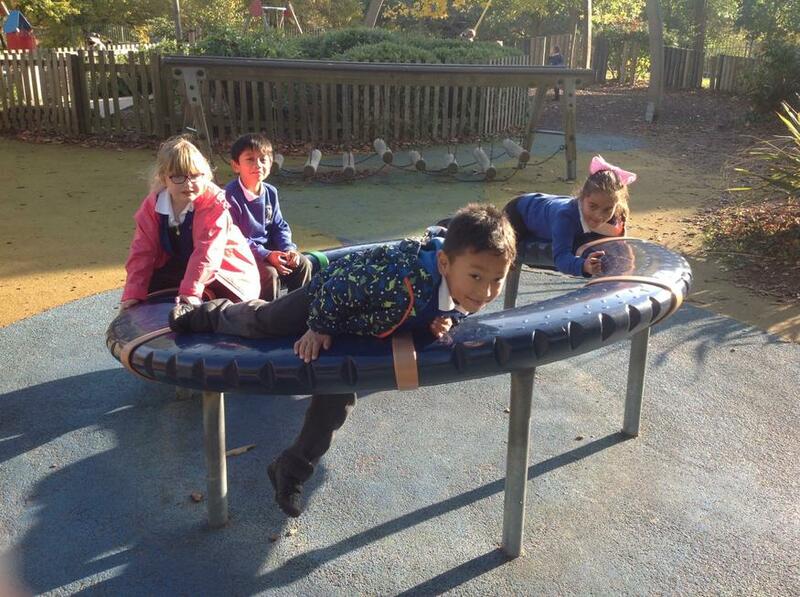 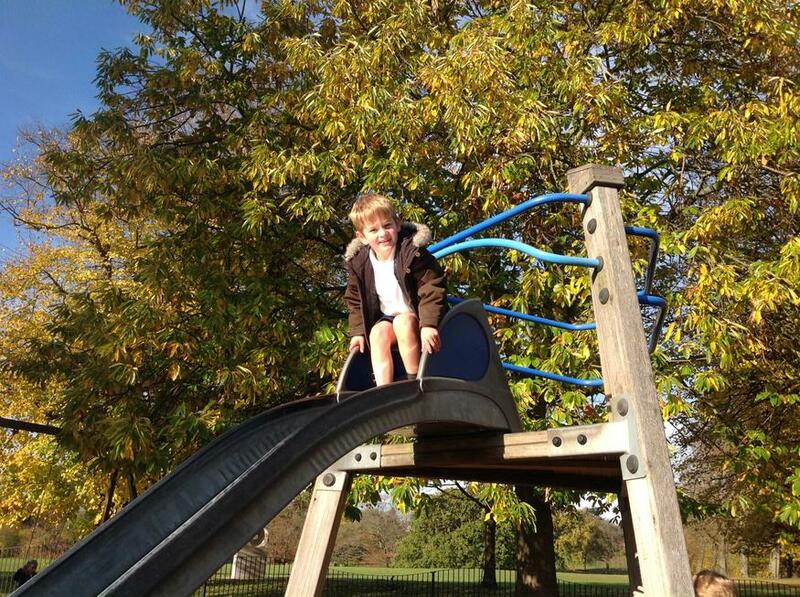 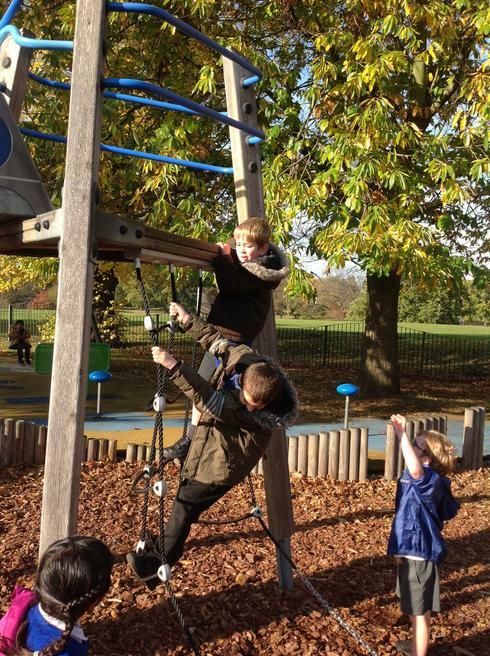 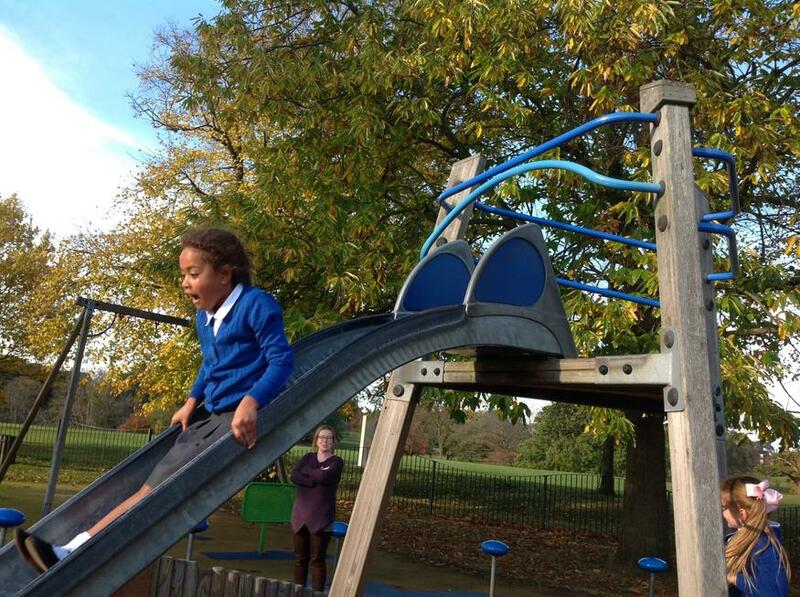 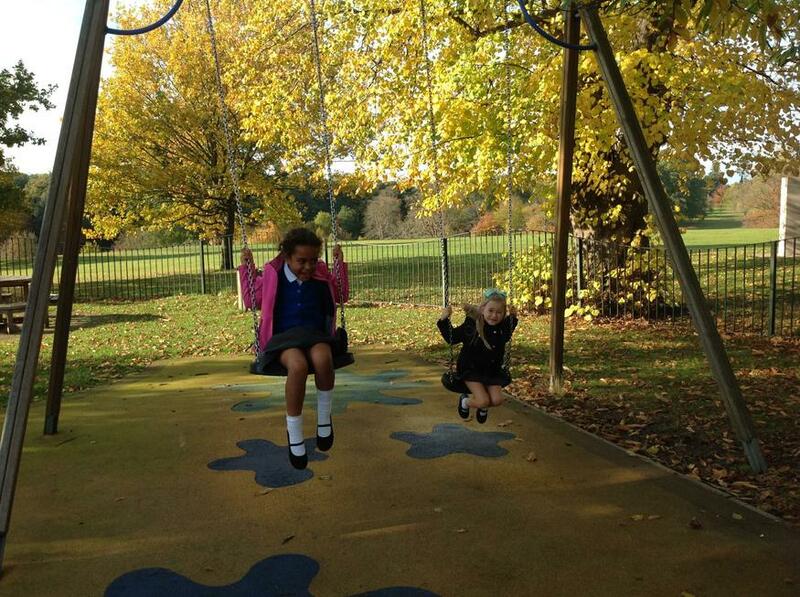 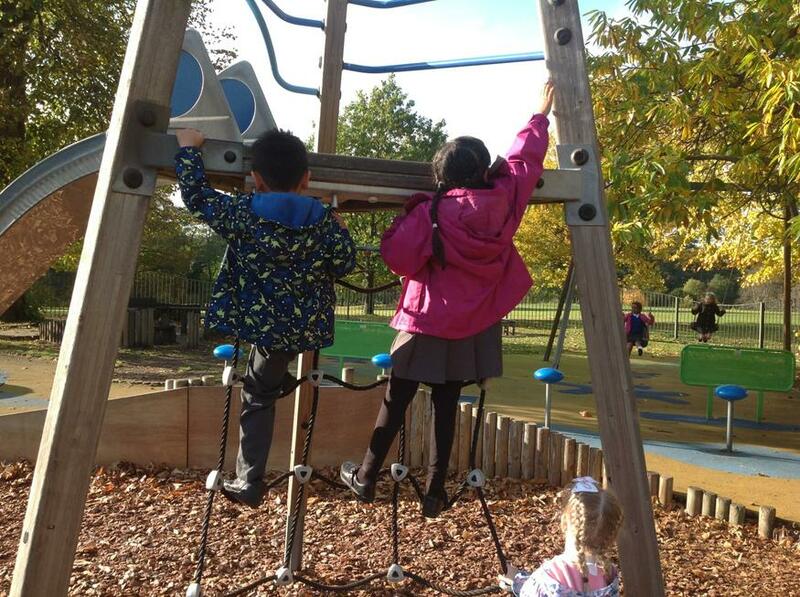 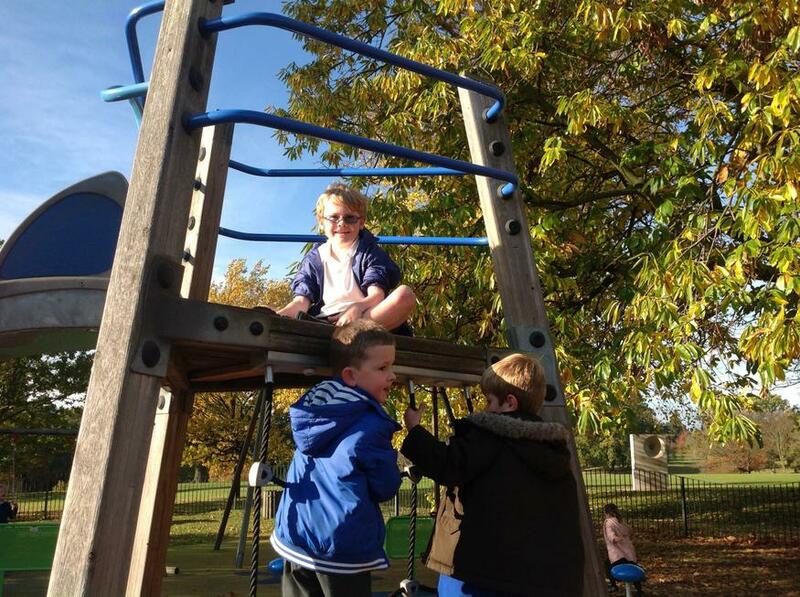 We even had some time to play on the play area, which was lots of fun too! 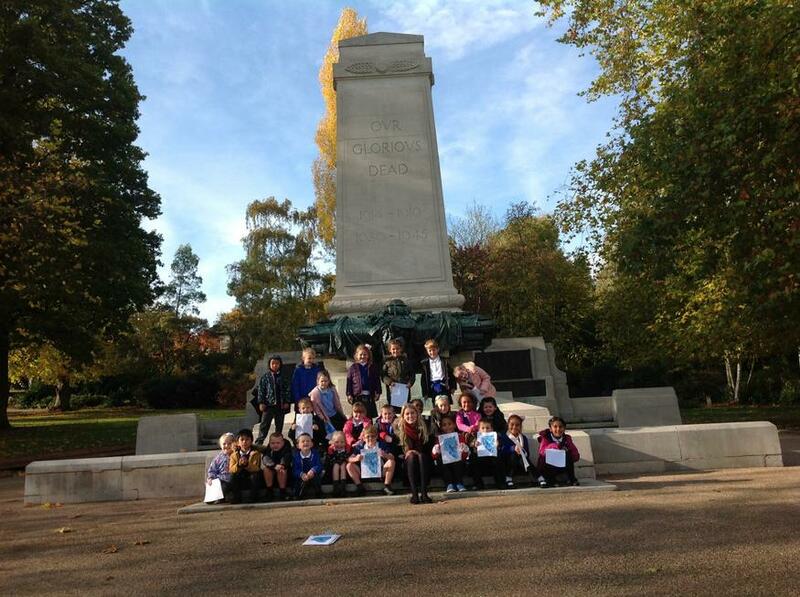 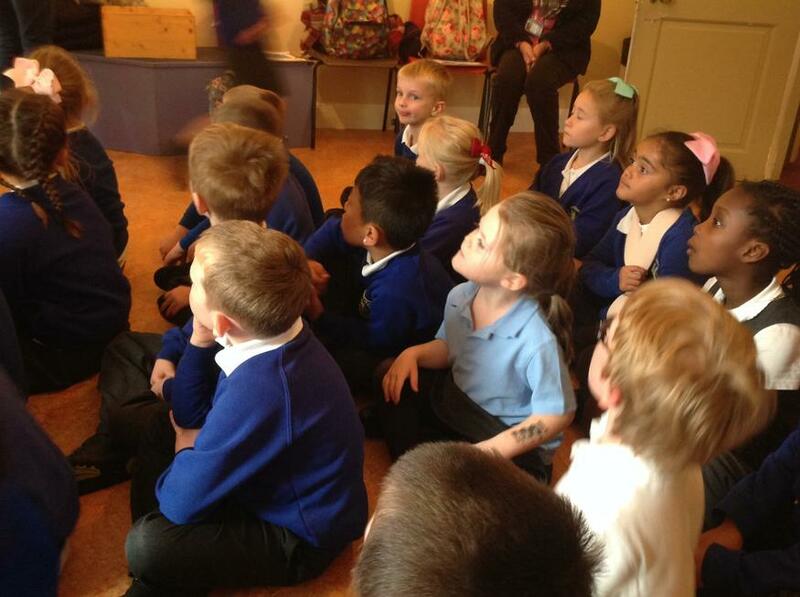 Everyone was very well behaved and all the staff that went on the trip were very proud of the children. 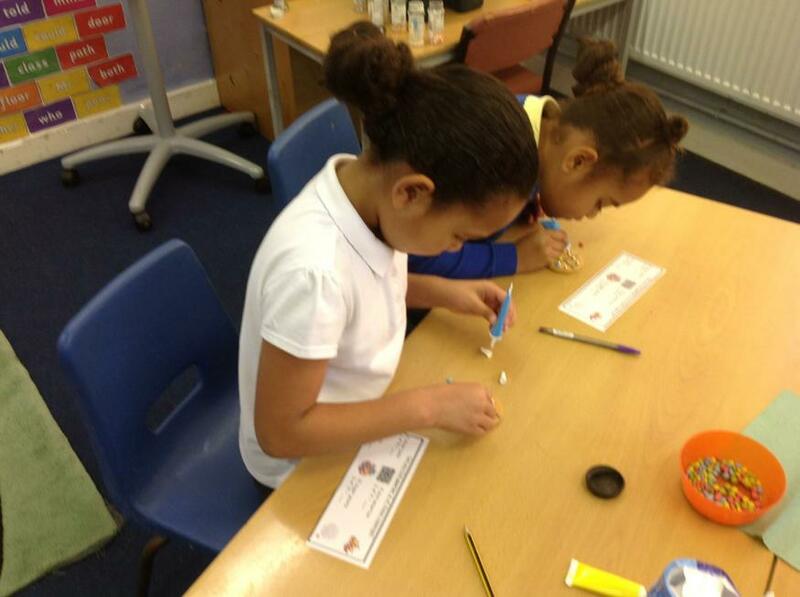 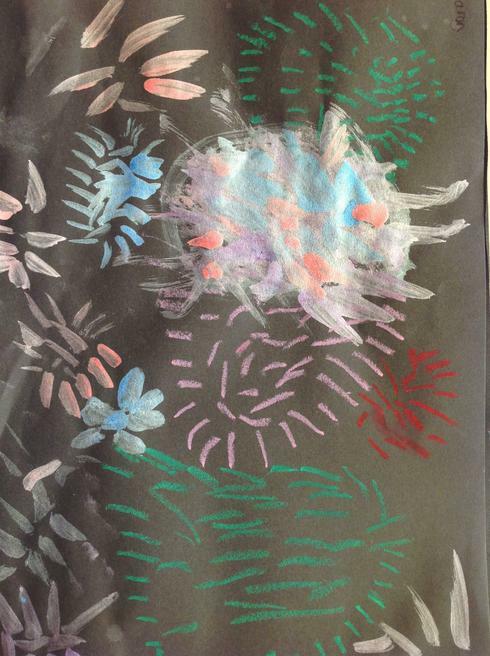 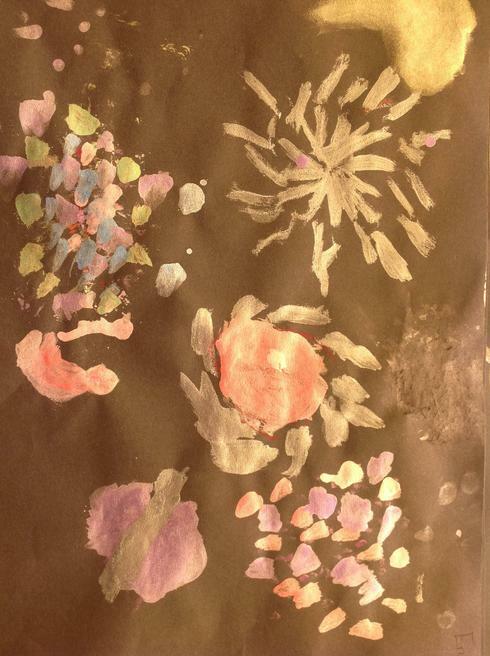 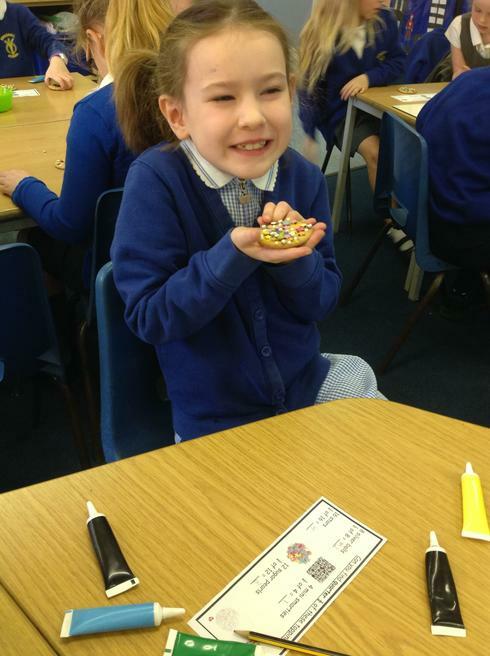 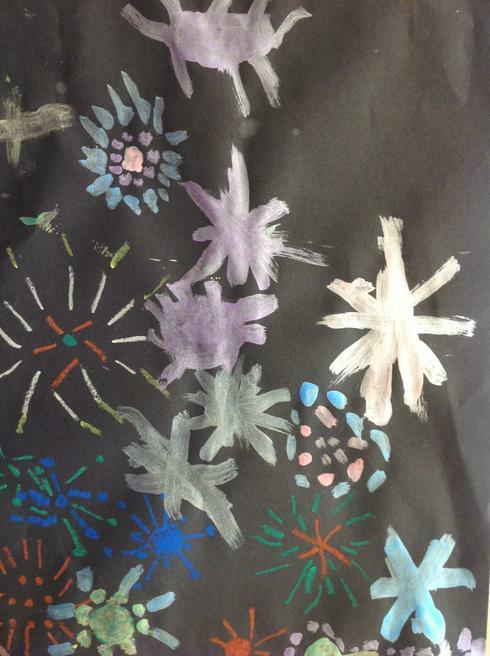 As part of our learning about 'The Gunpowder Plot' we created fire work pictures. 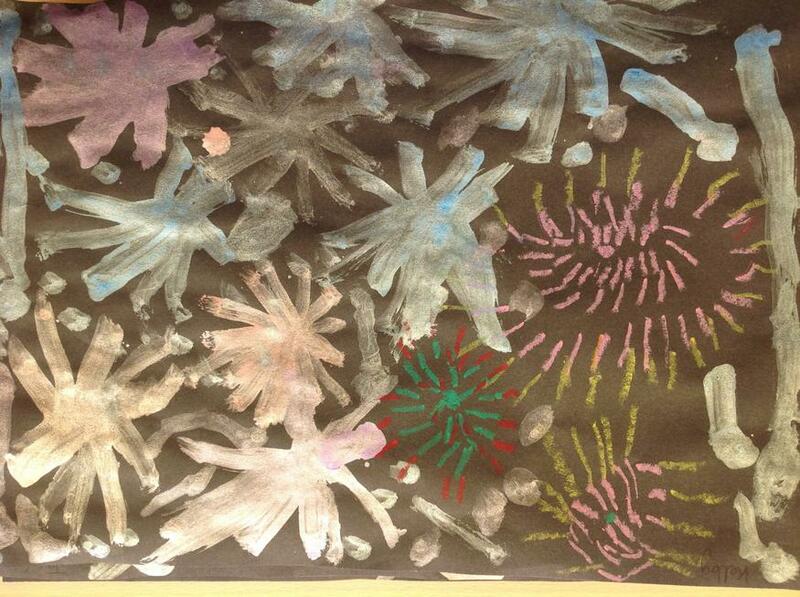 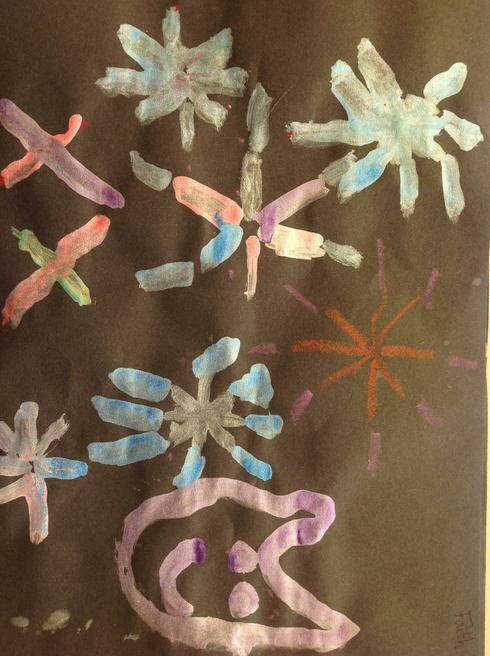 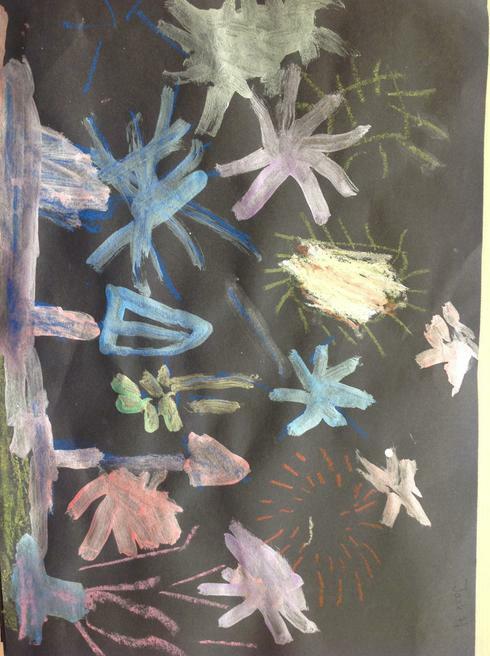 We watched a firework display video and thought about the shapes that fireworks make in the sky. 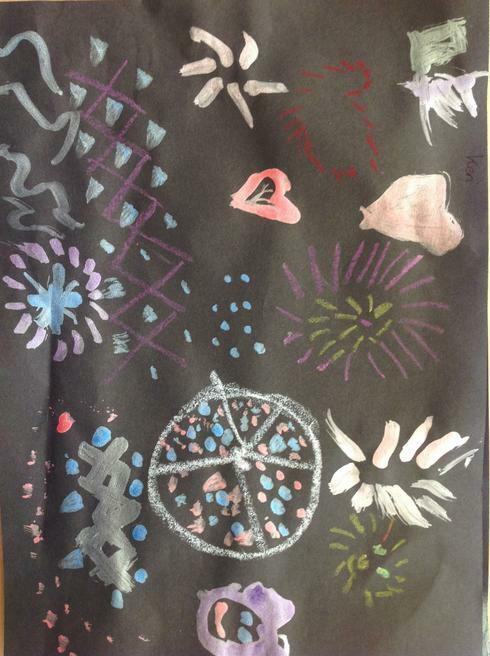 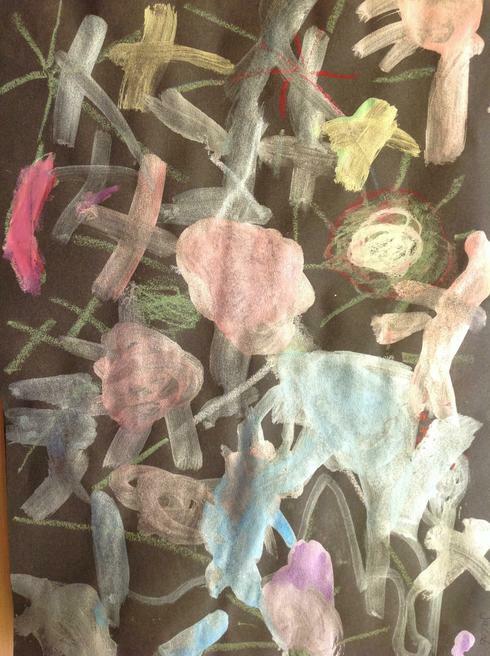 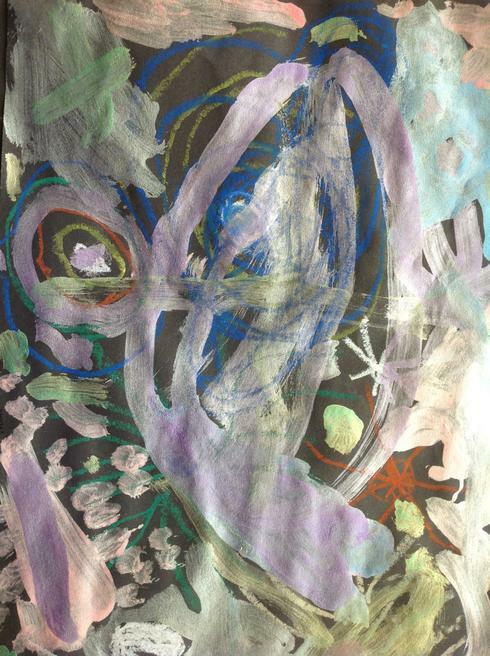 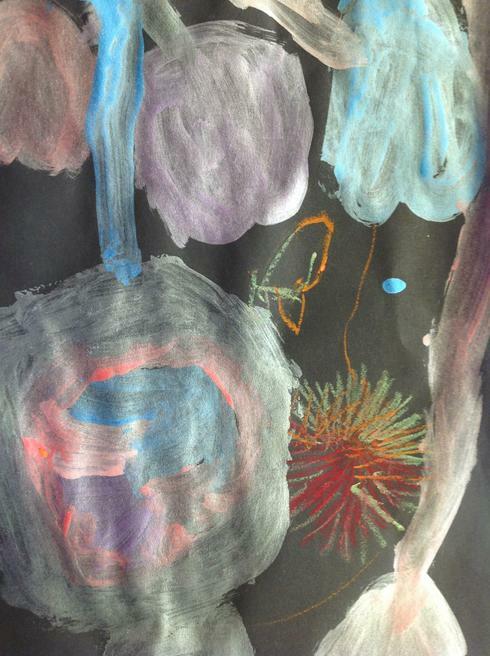 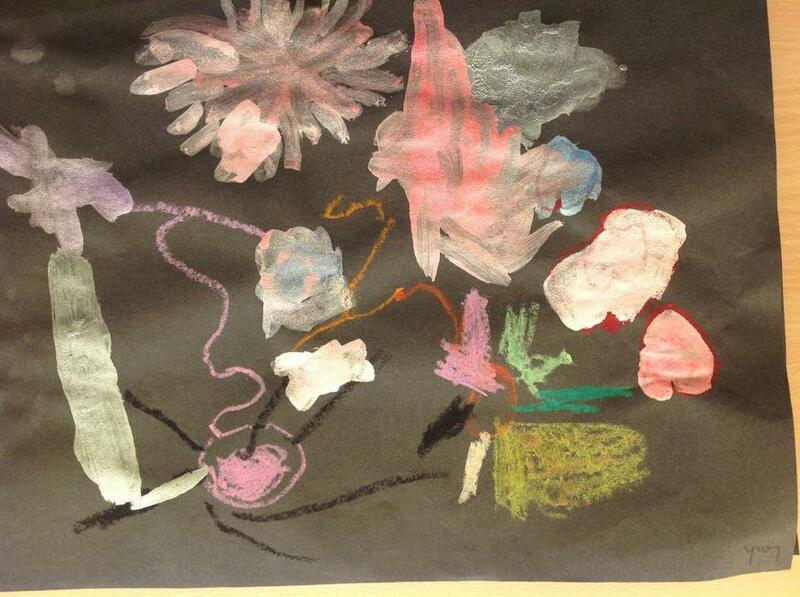 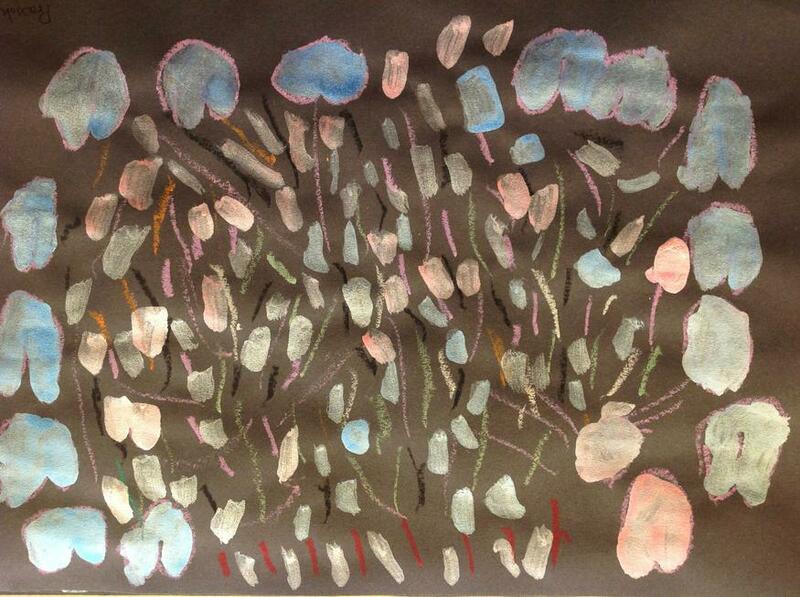 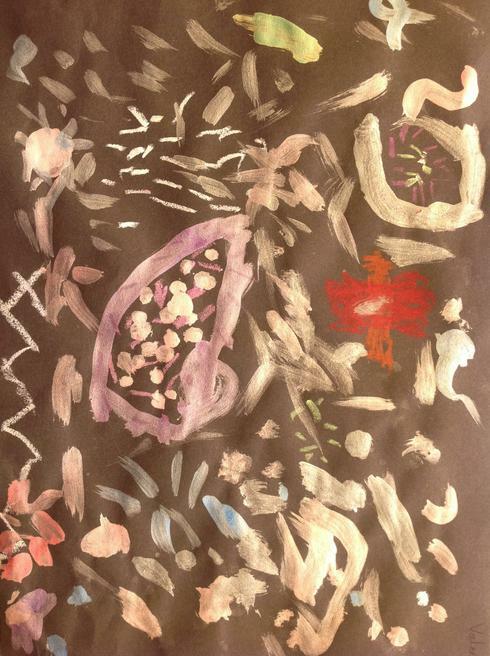 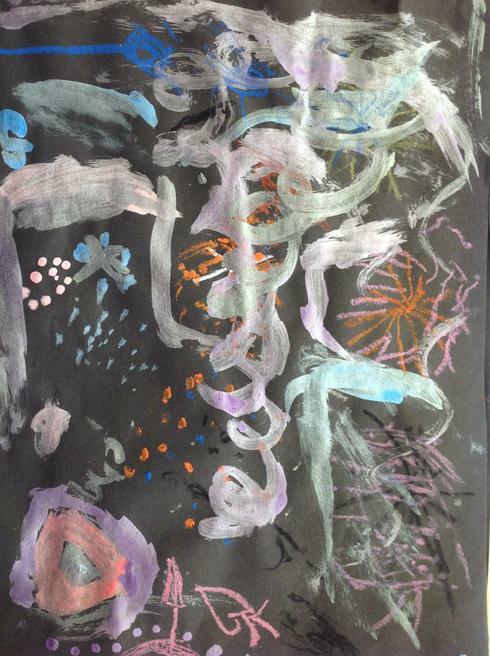 We used oil pastels and paint to make these shapes in our pictures. 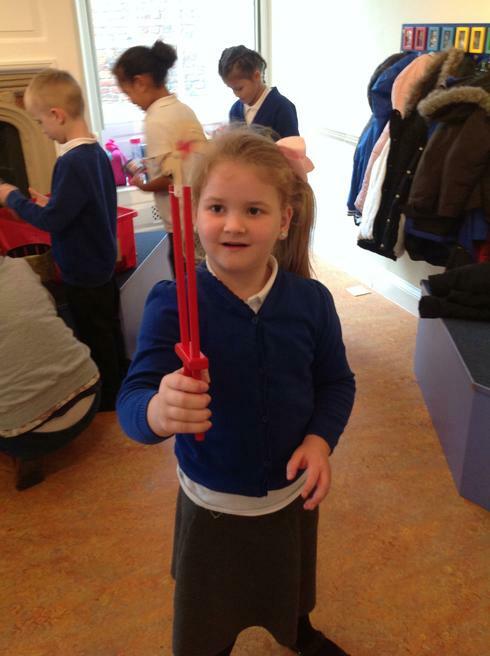 Our finished work is fantastic! 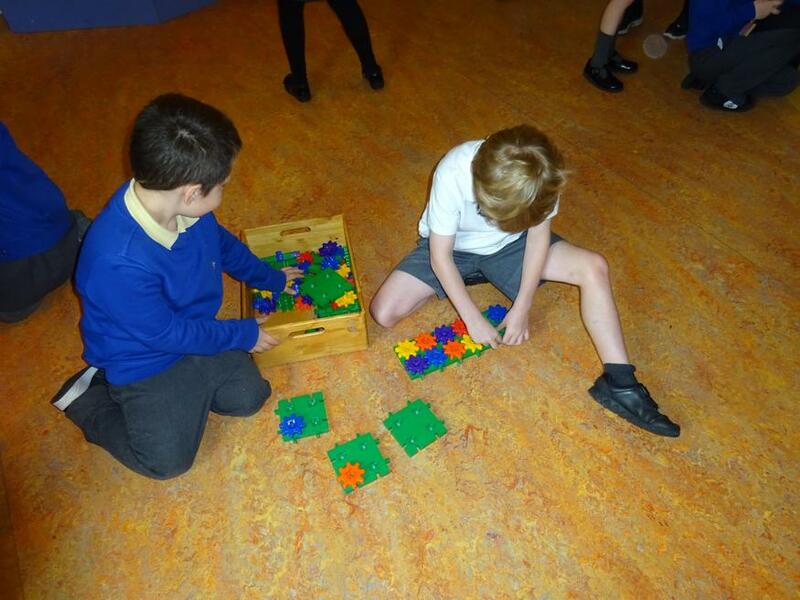 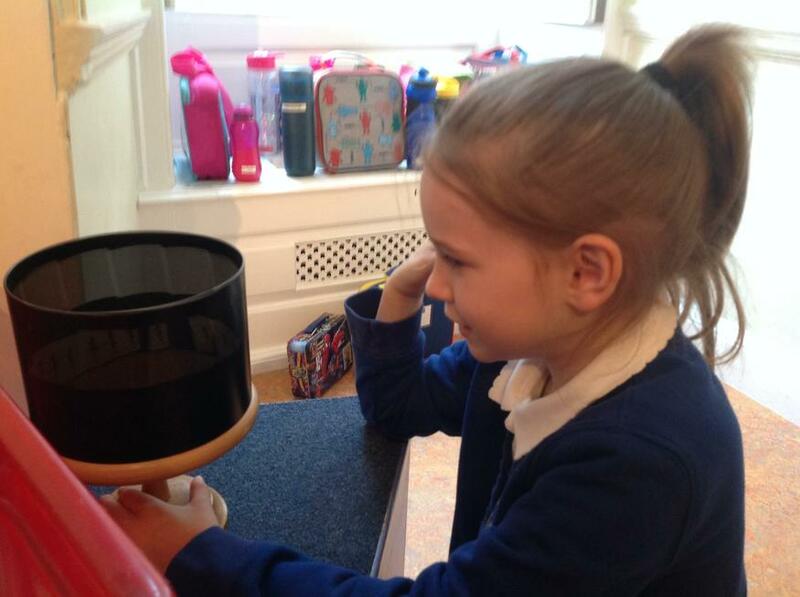 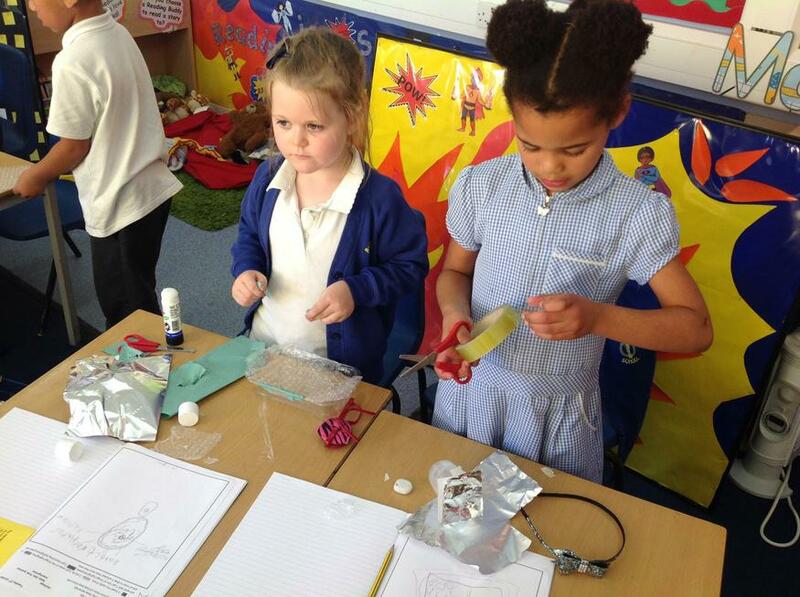 This week has been STEM (Science, Technology, Engineering and Maths) week at Ringshall. 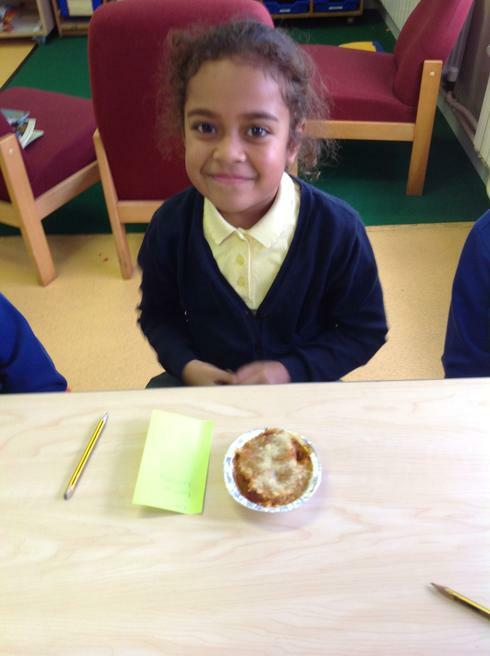 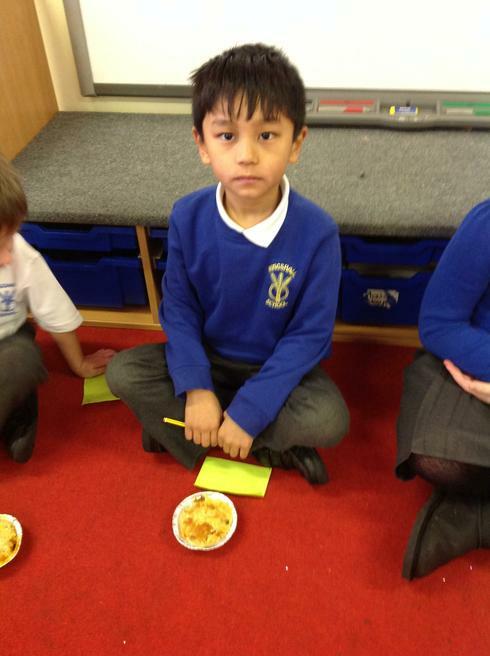 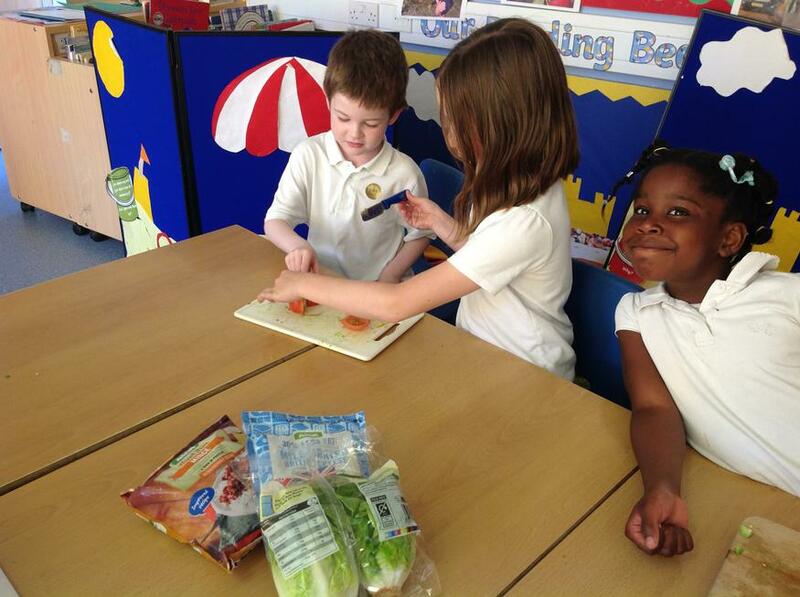 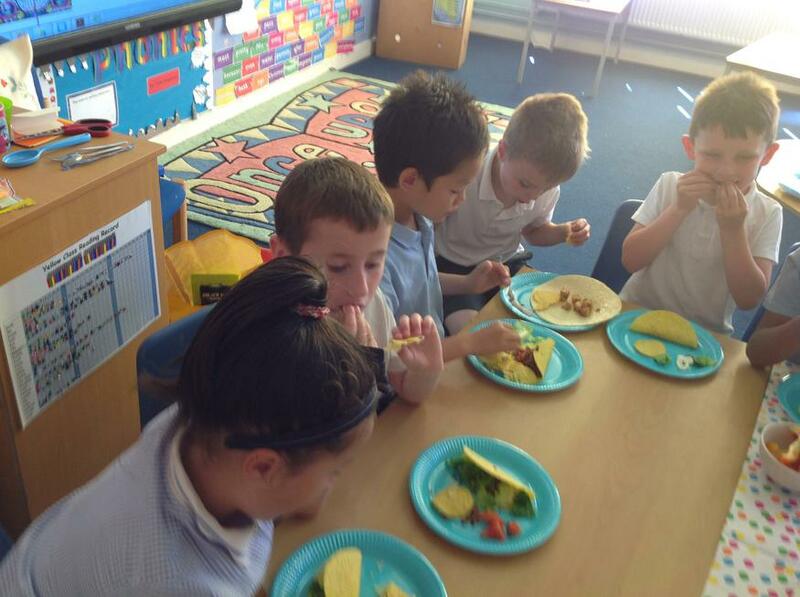 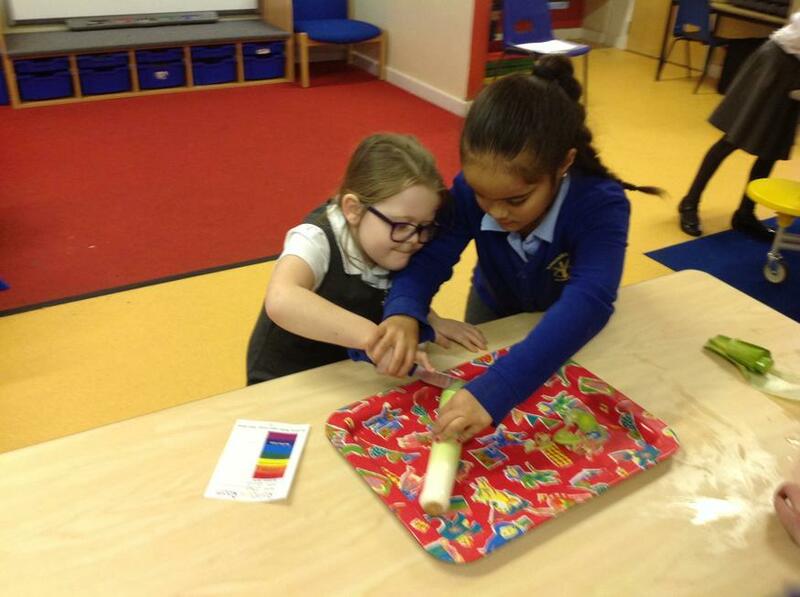 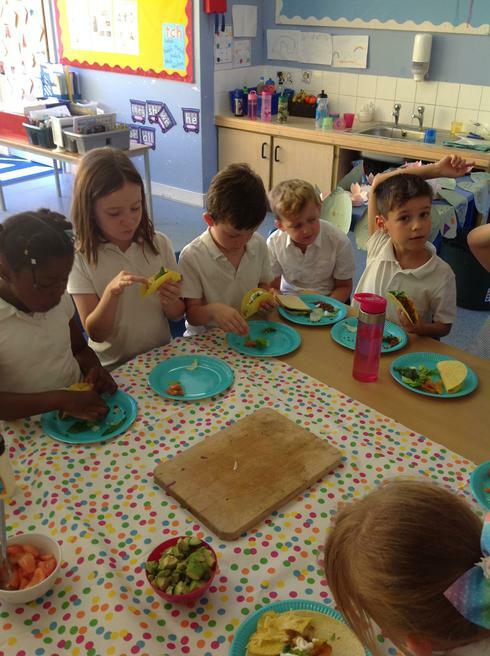 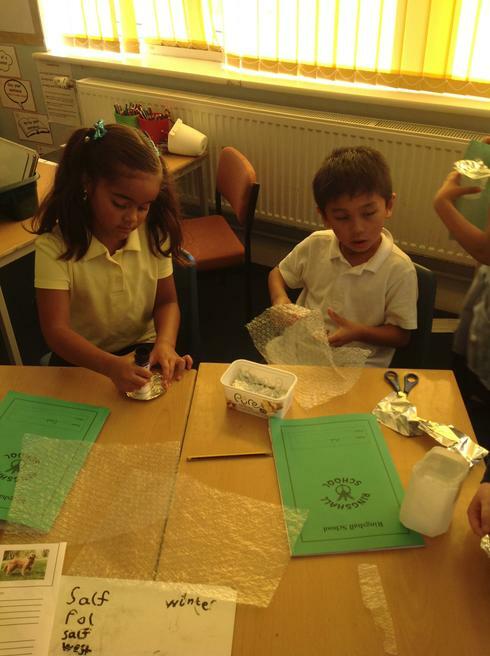 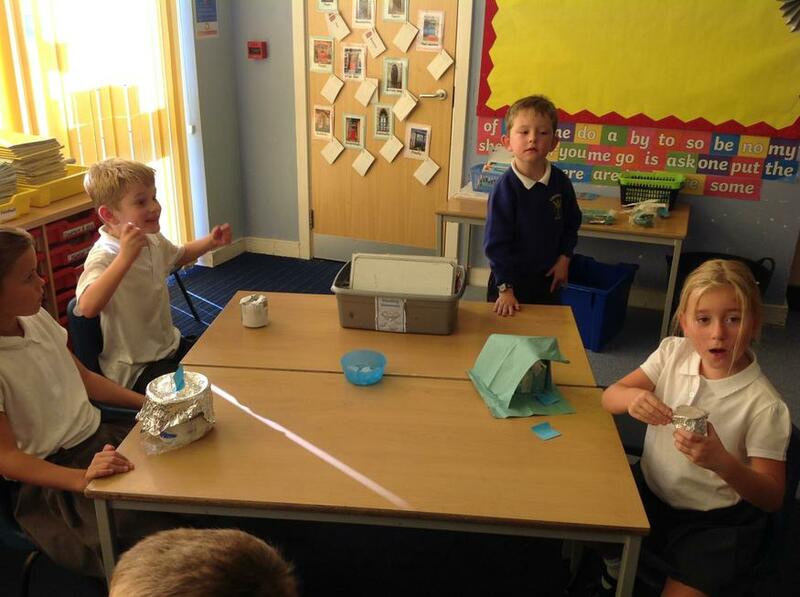 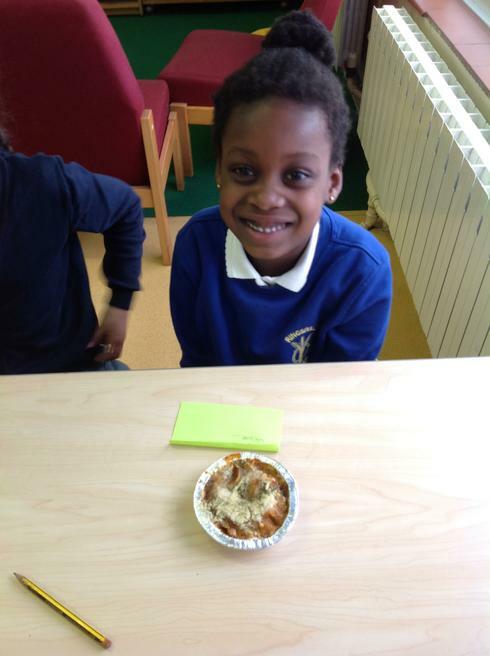 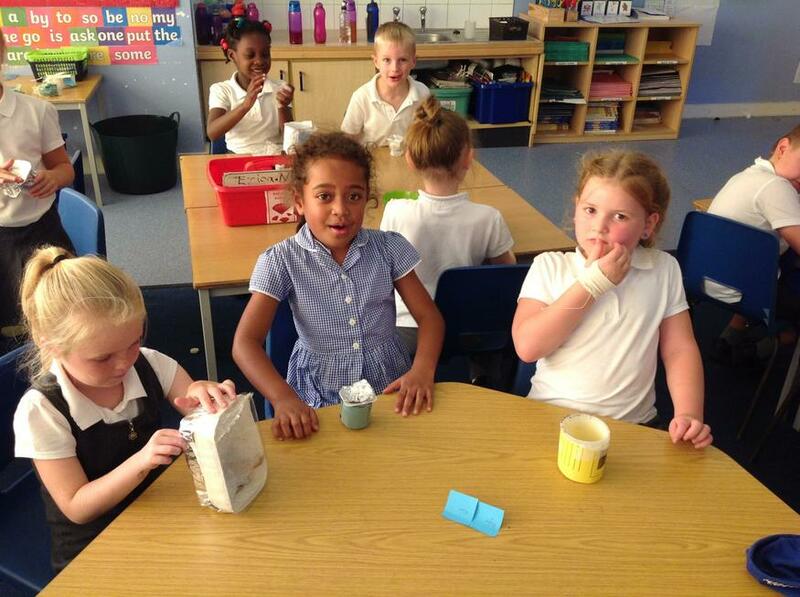 In Yellow Class we thought about how we could keep food cold without a fridge or a freezer. 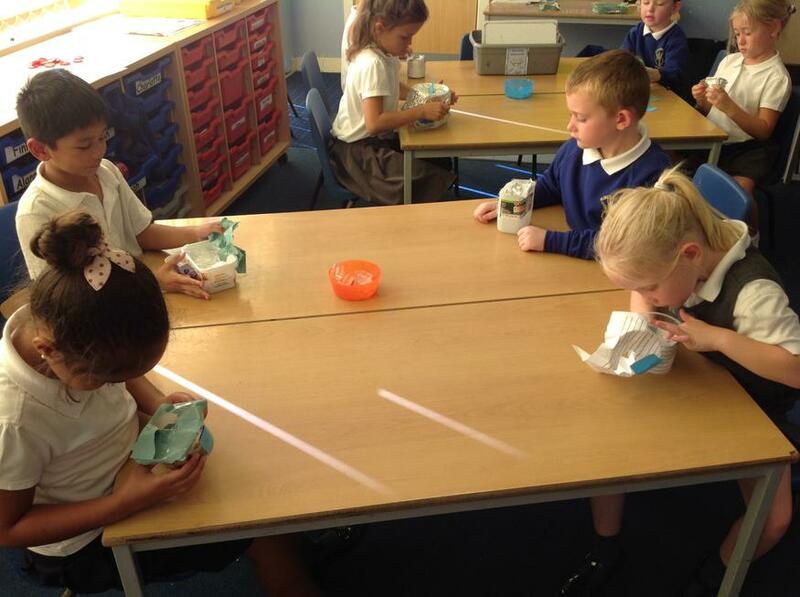 On Monday we investigated how quickly ice melted in different places. 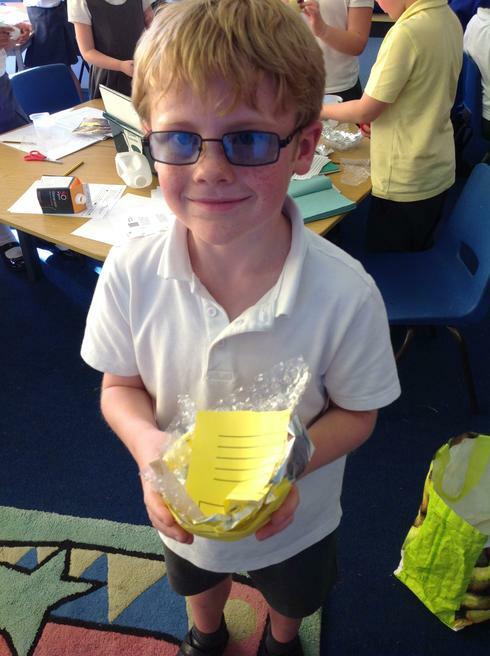 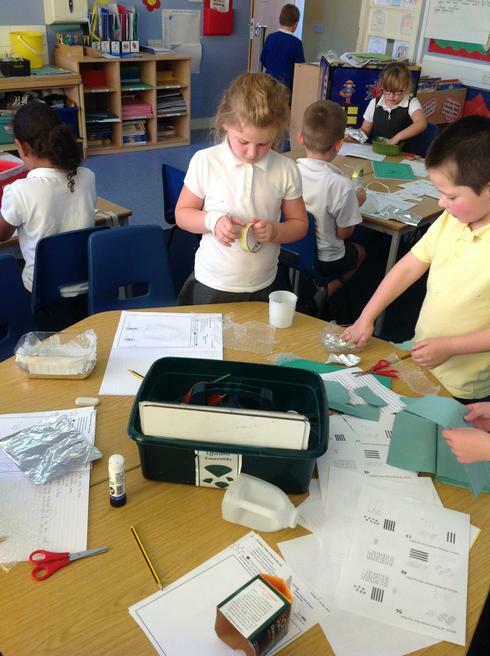 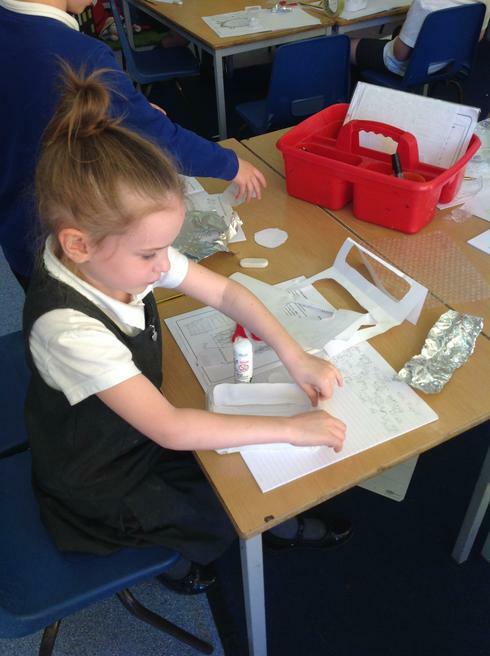 Using this to help us, we designed and made our own mini fridges. 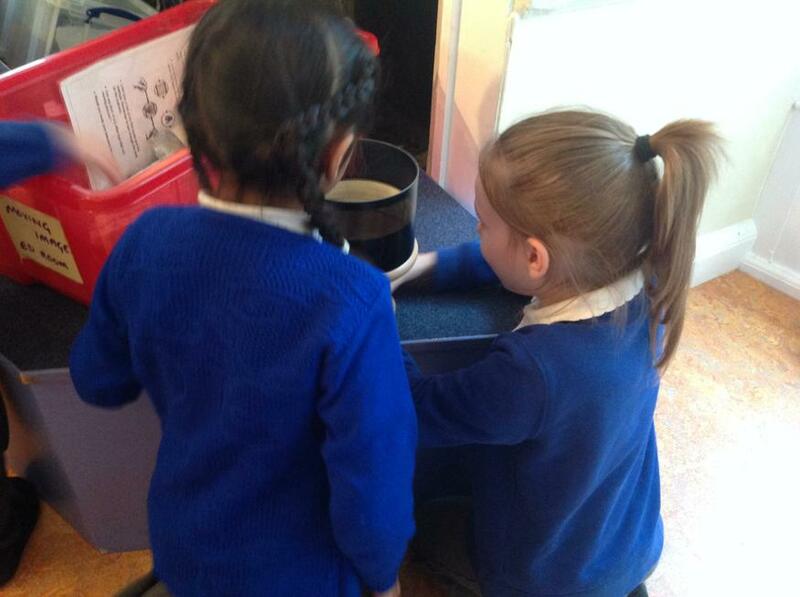 Today we tested our fridges by seeing how long an ice cube would last before it melted. 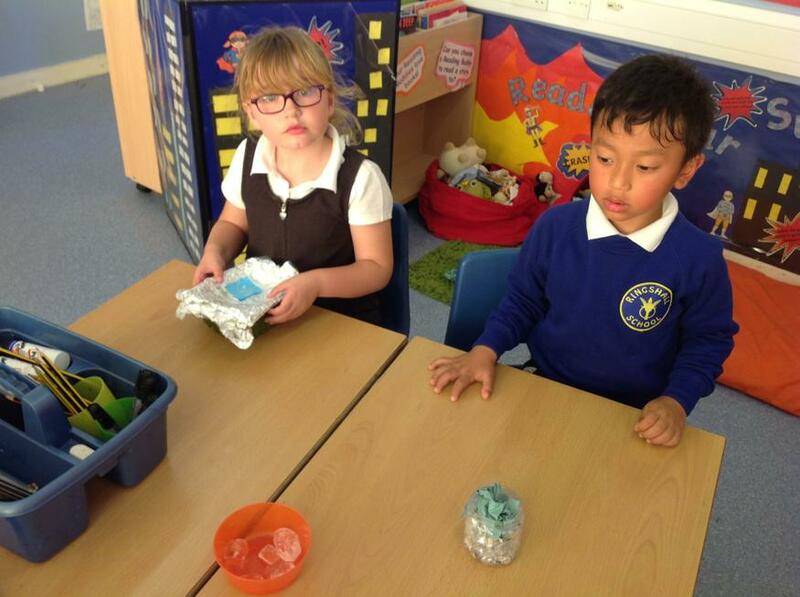 We couldn't believe that some of our ice cubes lasted for more than 40 minutes without melting! 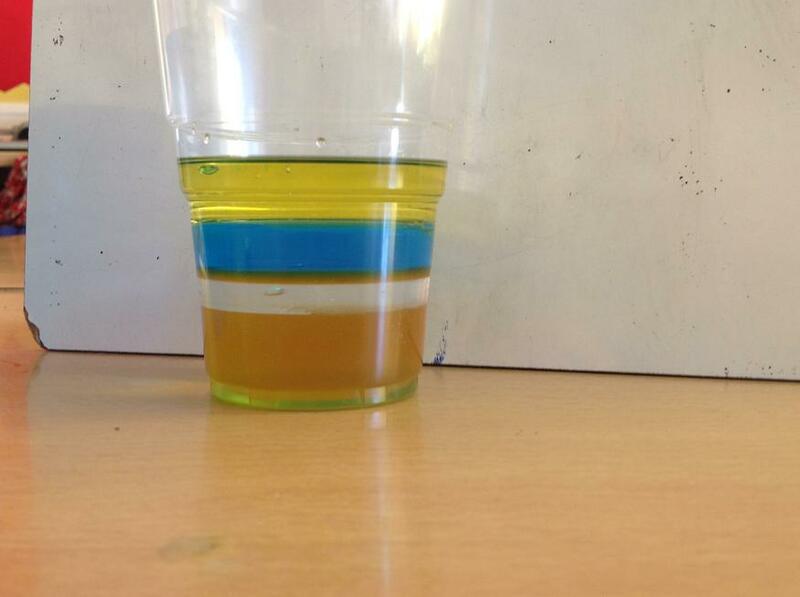 The ice cubes in these children's fridges took longer than 40 minutes to completely melt! 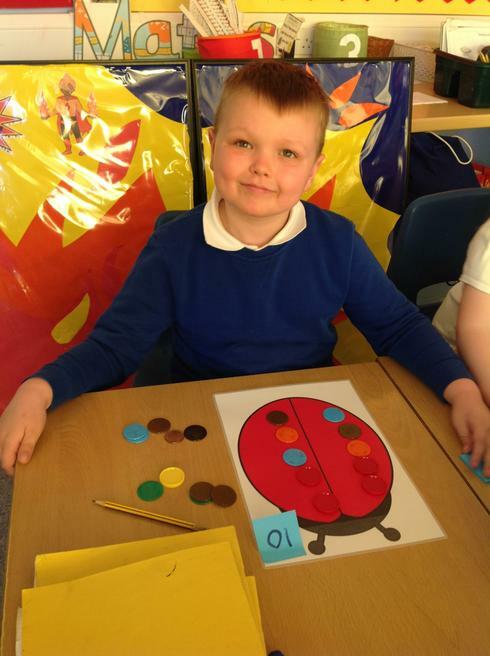 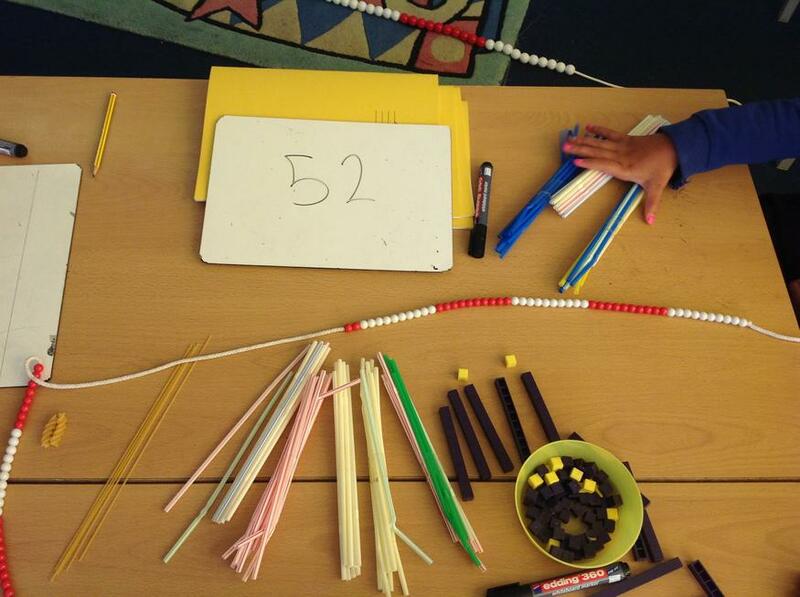 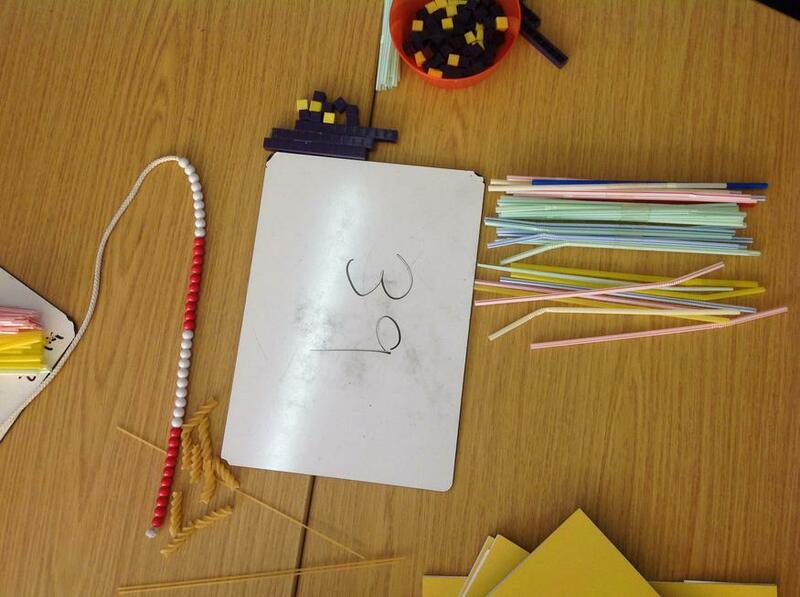 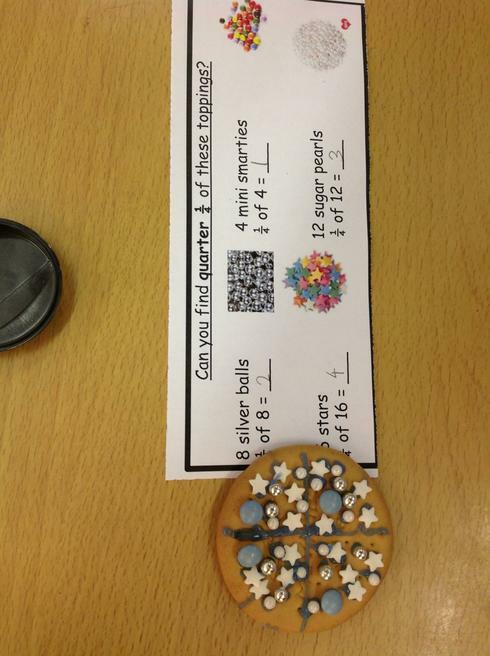 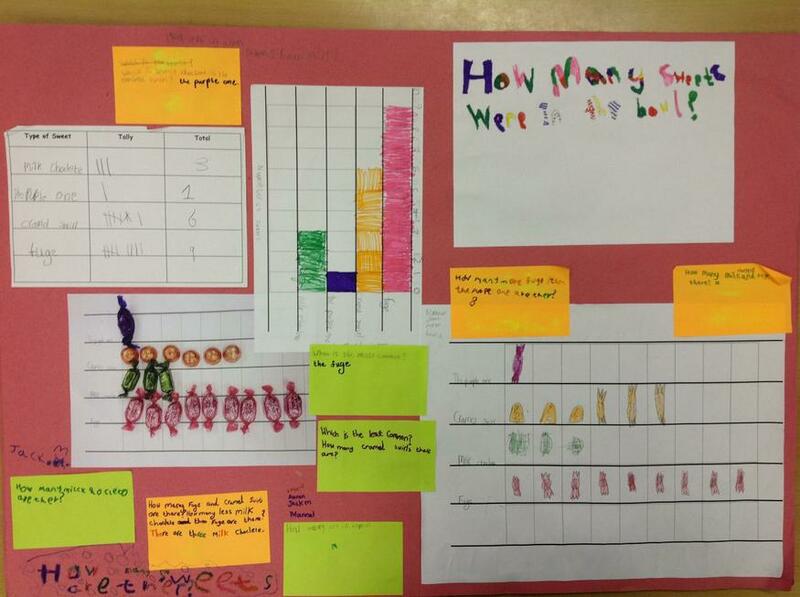 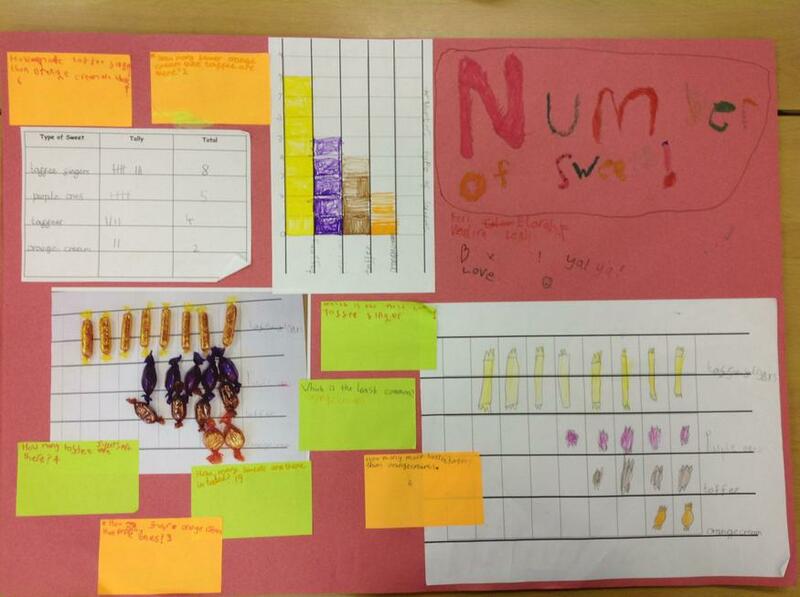 This week we have been thinking about how we can show a number using different resources. 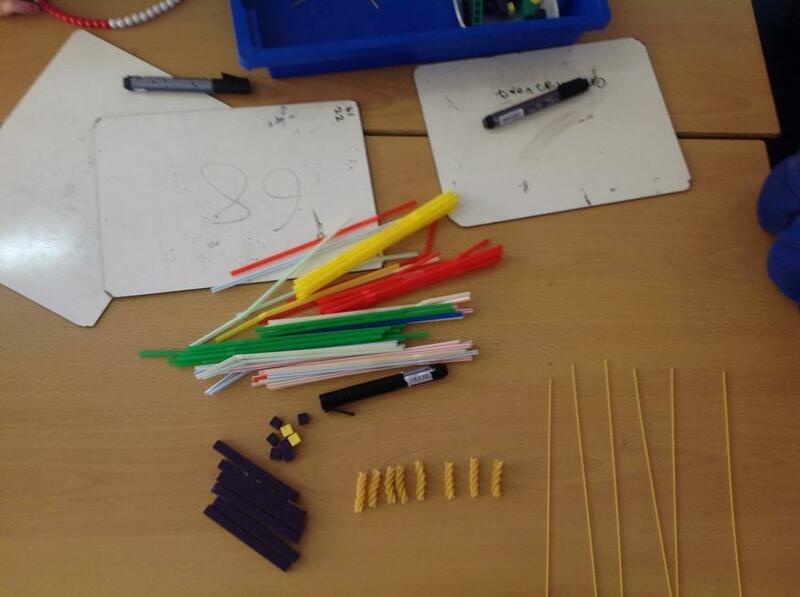 We used Numicon, Base 10 (sticks and bricks), spaghetti and pasta, bead strings and place value straws to show how many tens and how many ones were in a number. 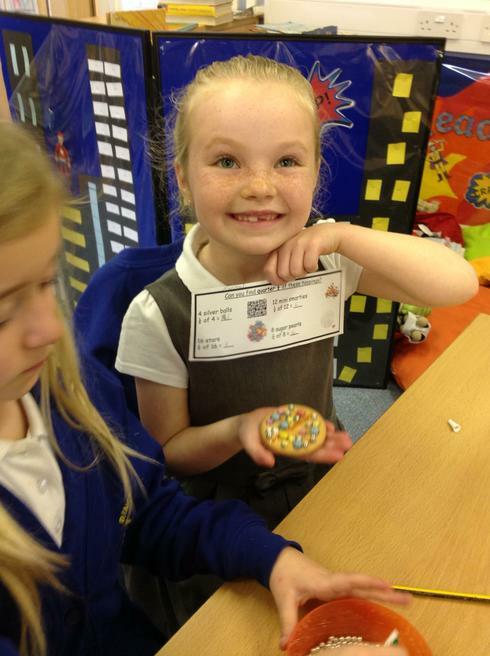 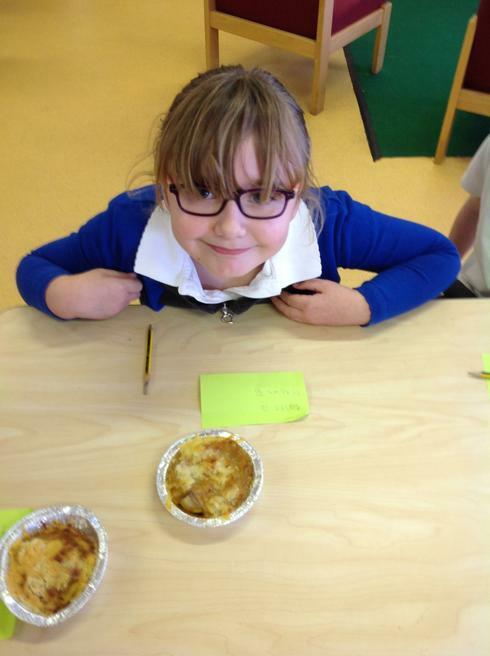 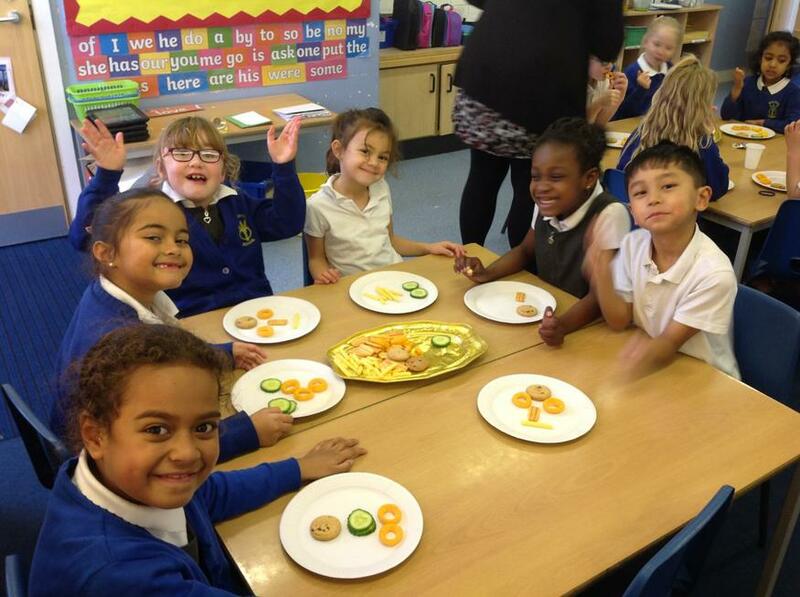 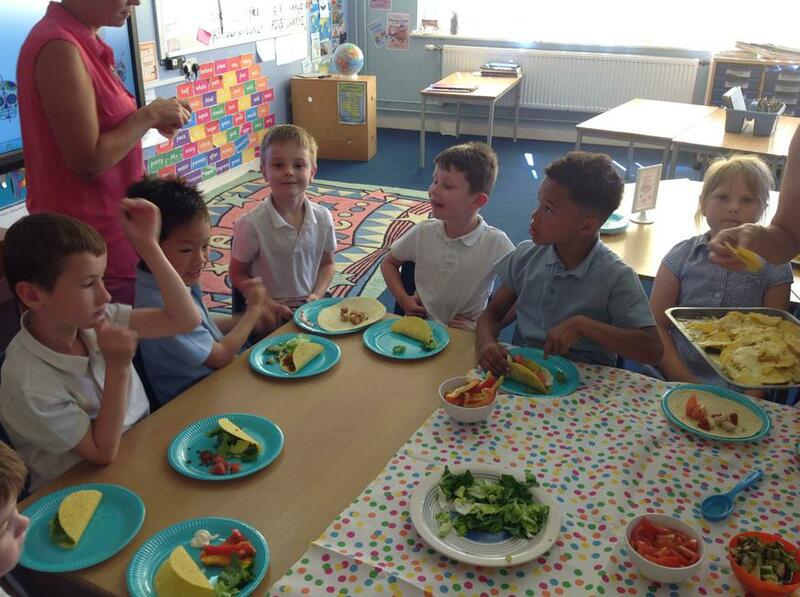 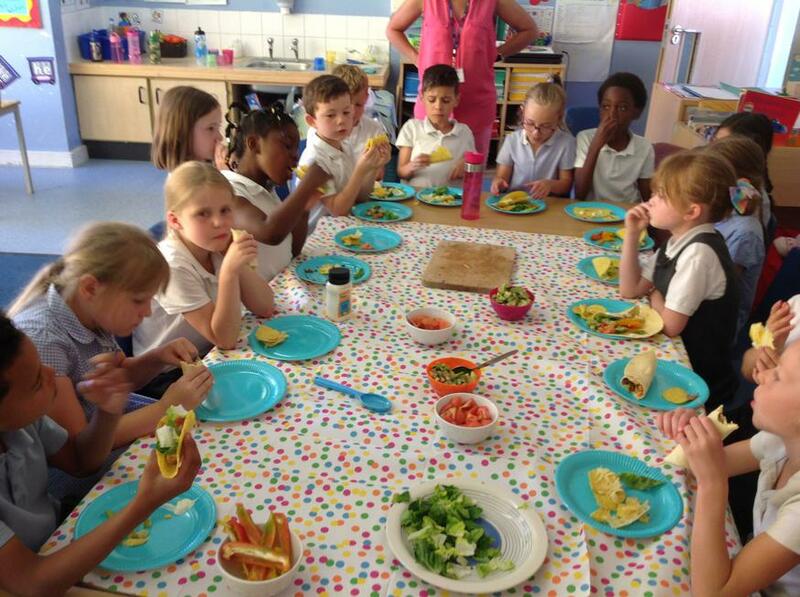 Have a look at the pictures to see how we did! 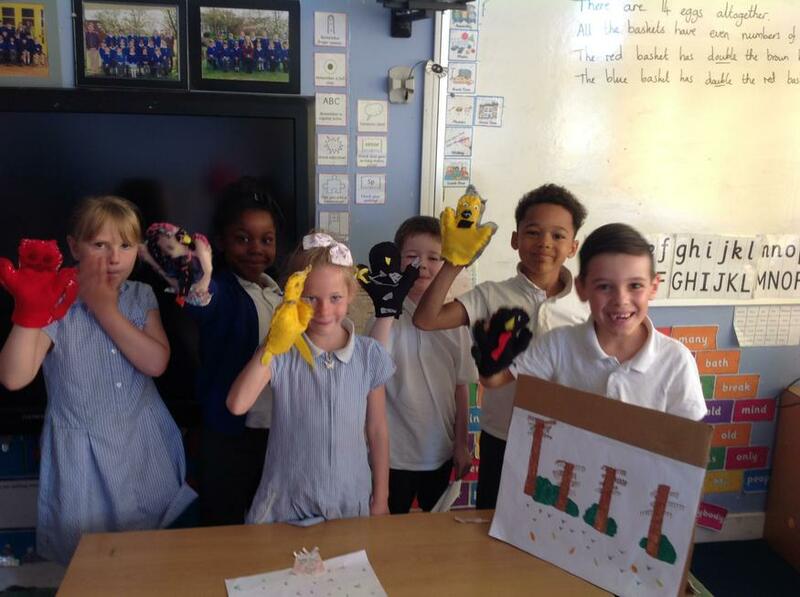 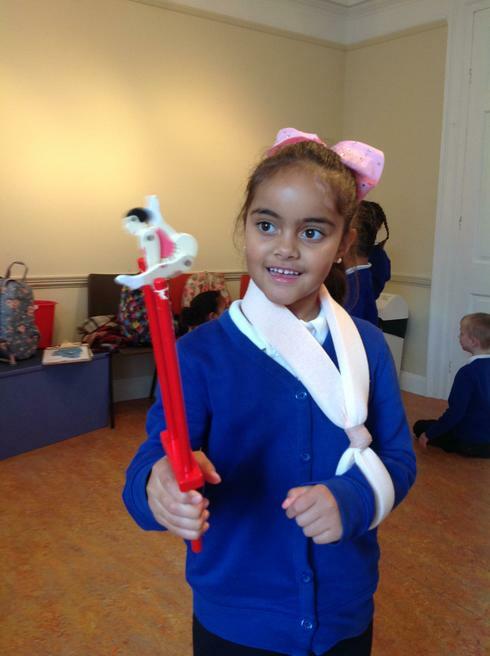 As an end of term project, Yellow Class have been working hard to create their very own puppet shows based on stories from other cultures. 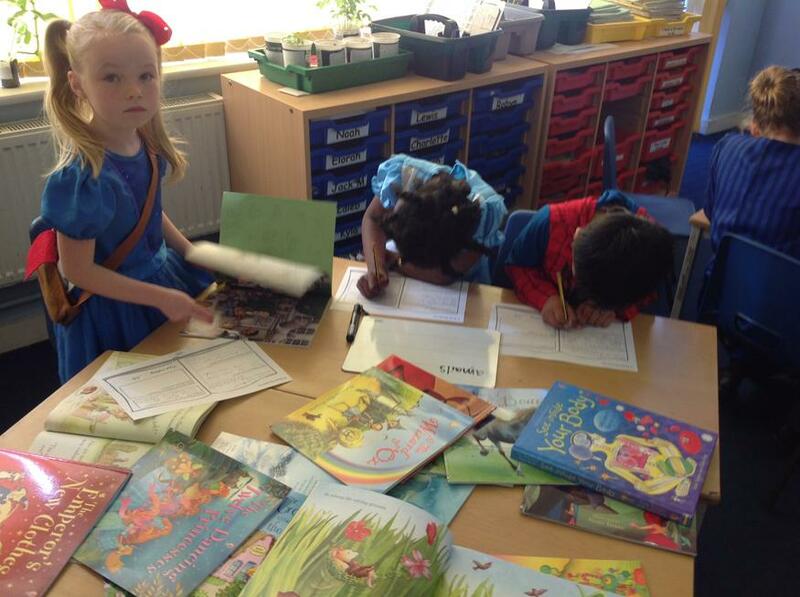 The children created story maps to retell their story and then used these to write their scripts. 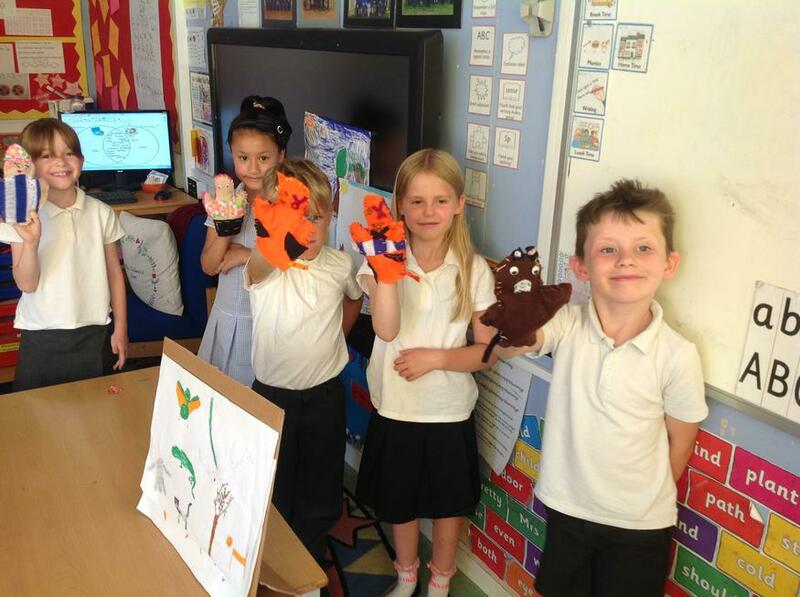 They also designed and made hand puppets to be their characters. 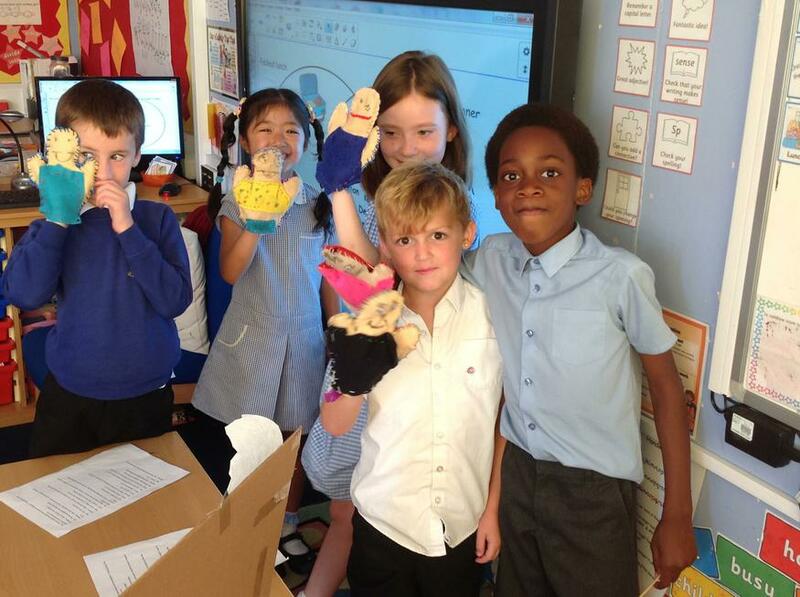 Some of the children had to show lots of resilience when sewing their puppets but they all looked fantastic in the end! 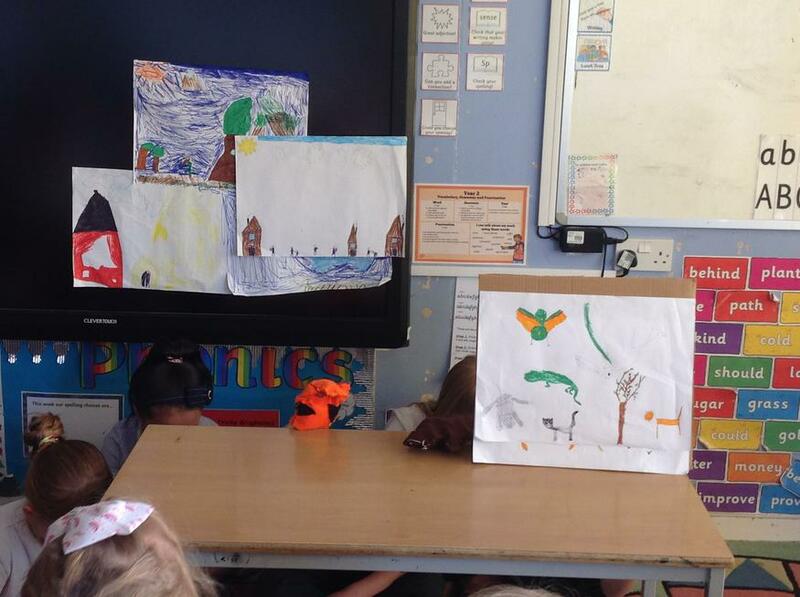 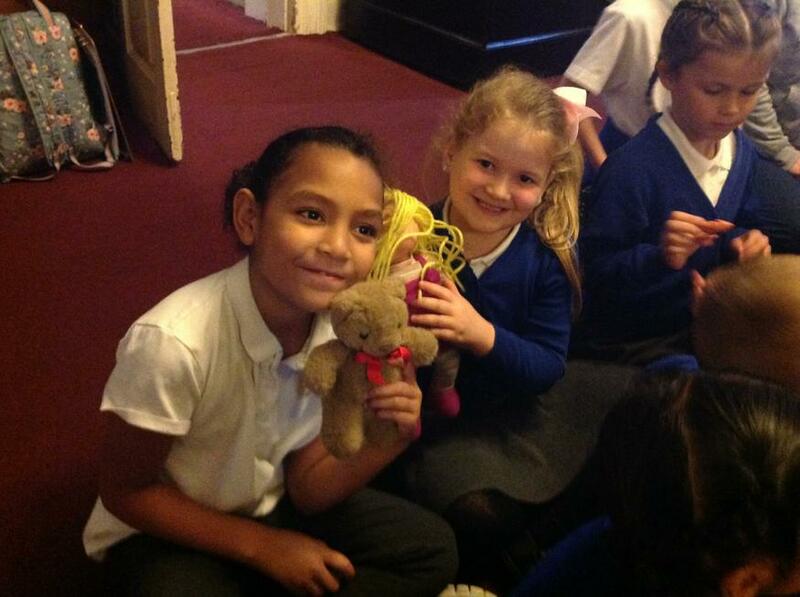 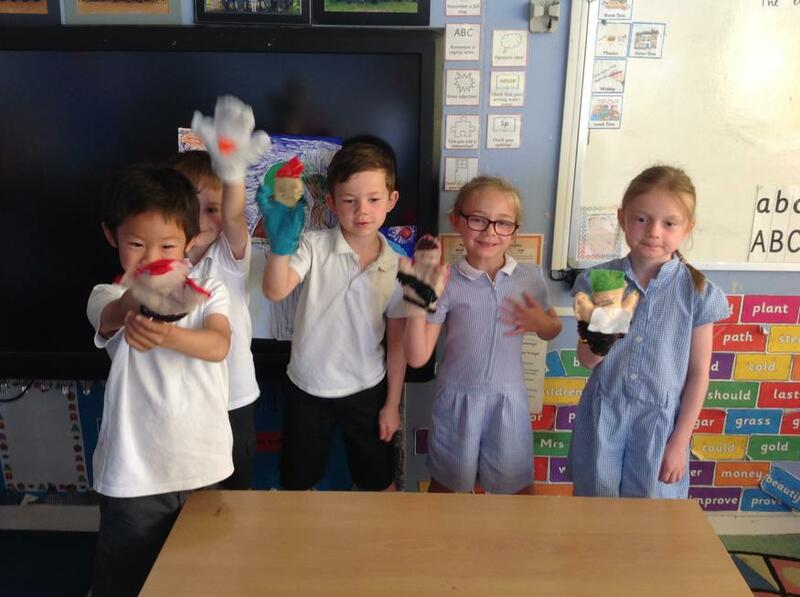 Today the puppet shows were performed to Red and Orange Classes. 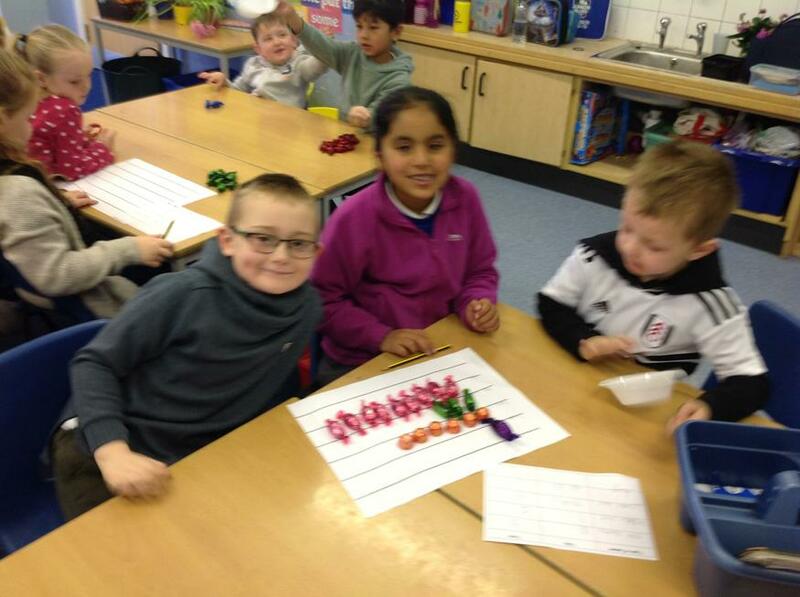 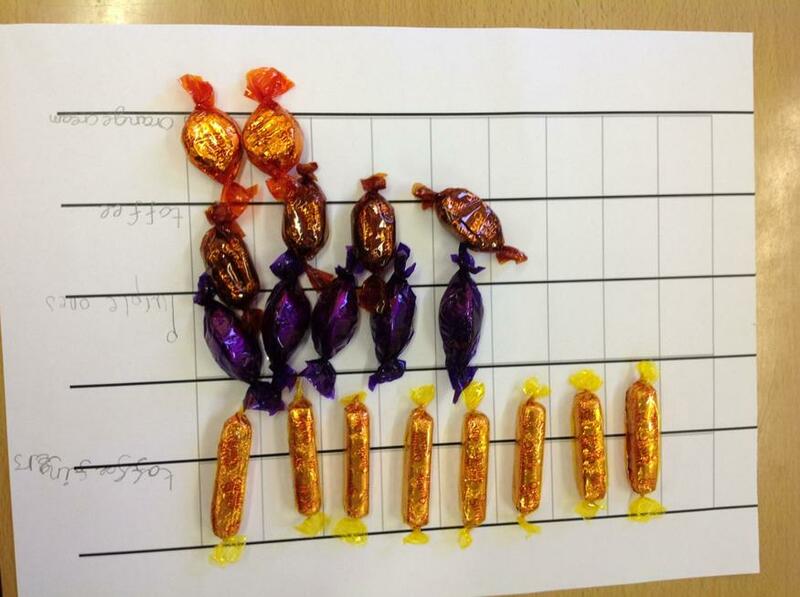 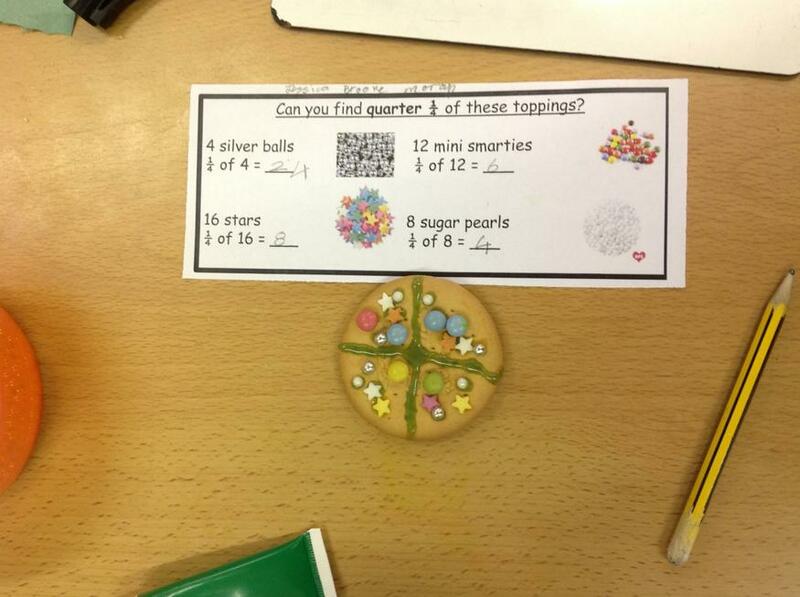 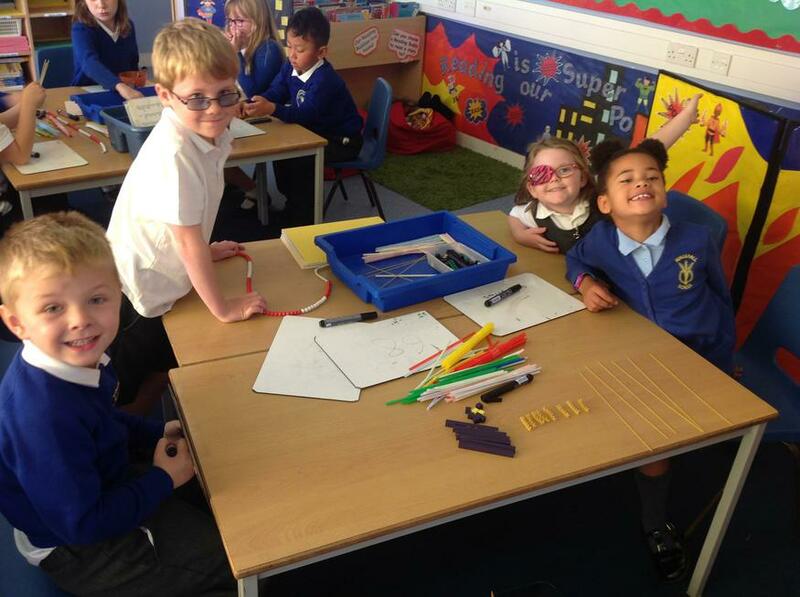 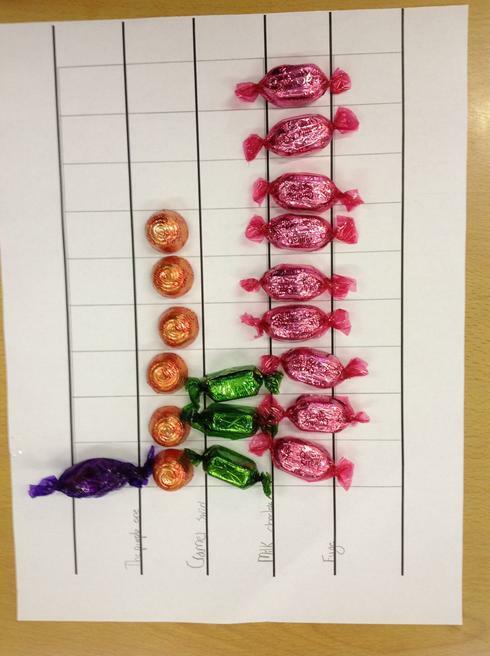 End of term Maths fun! 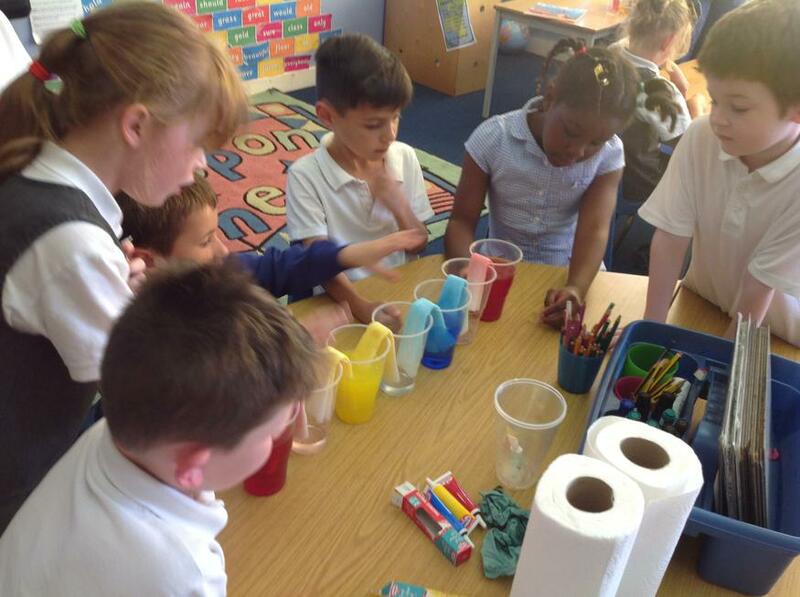 This week is Science week at Ringshall School. 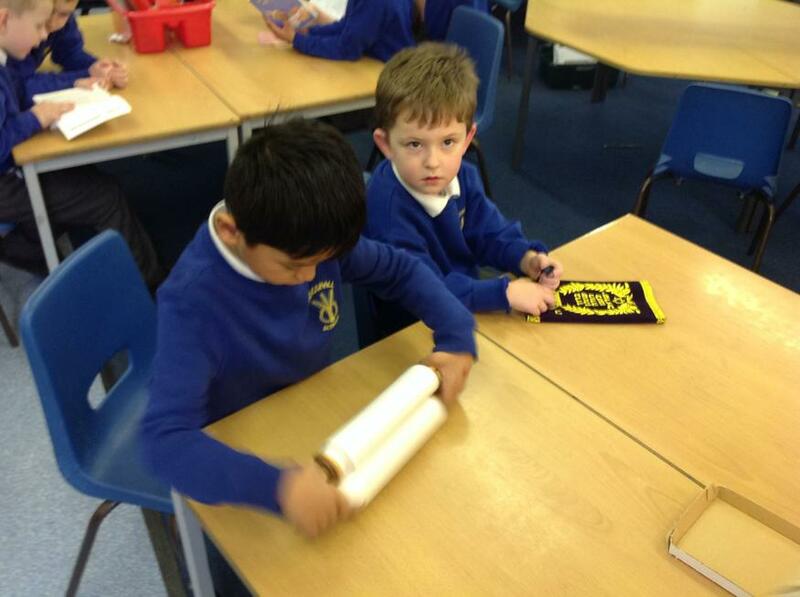 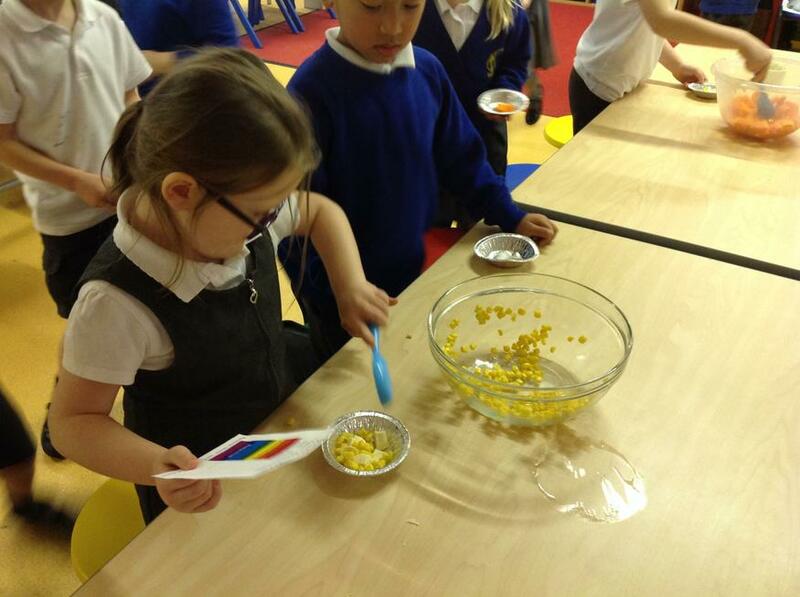 In Yellow Class we have been curious scientists! 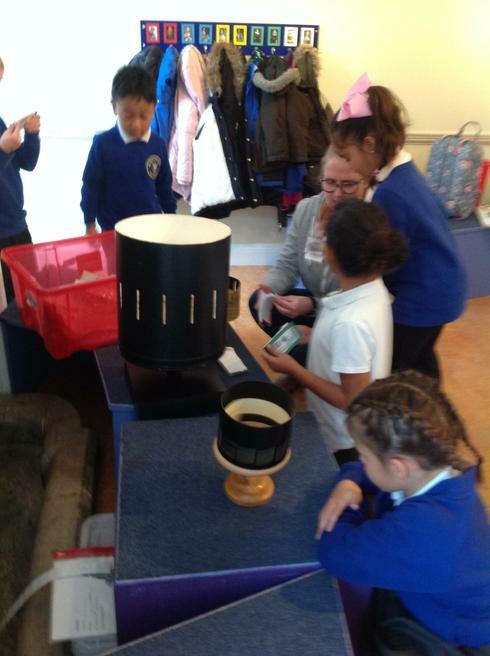 We have been asking questions, setting up investigations, observing changes carefully and explaining why we think something has happened. 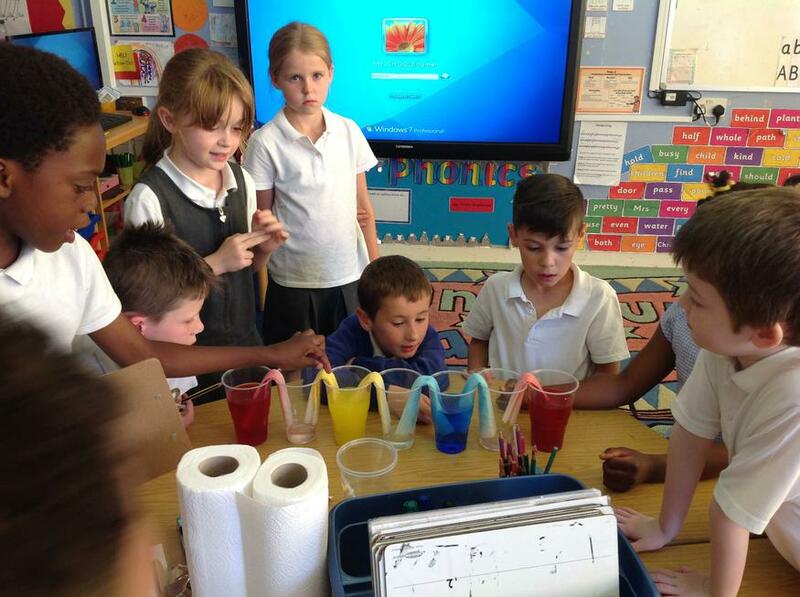 Some of our science learning this week has amazed us! 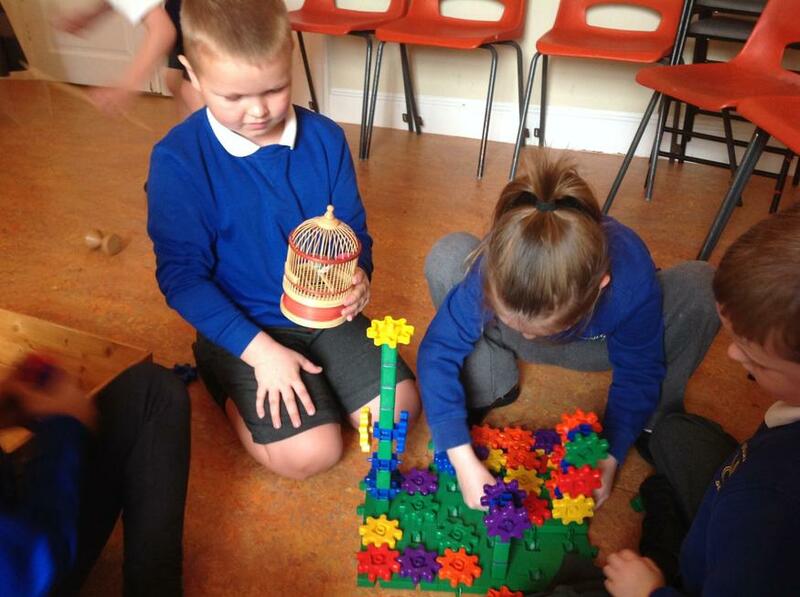 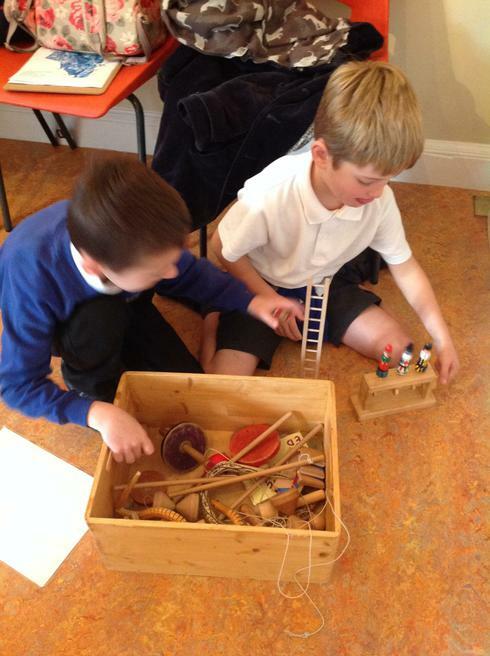 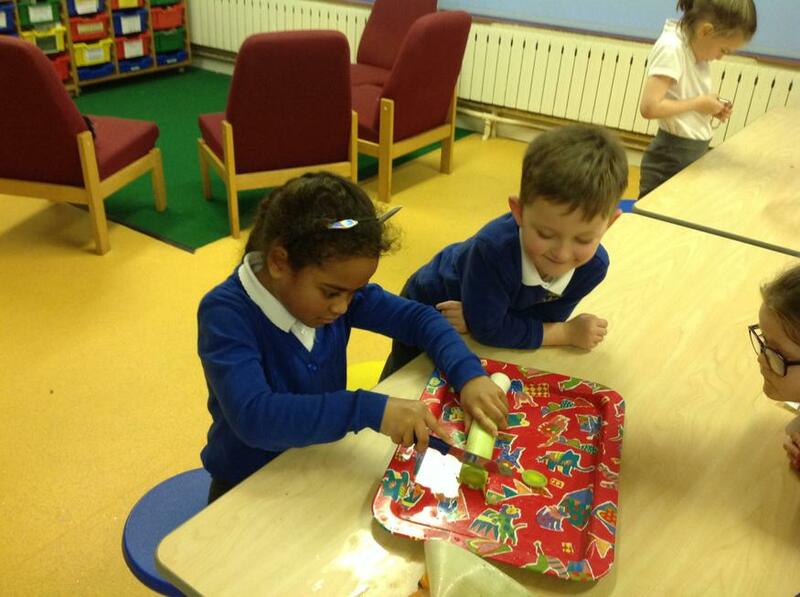 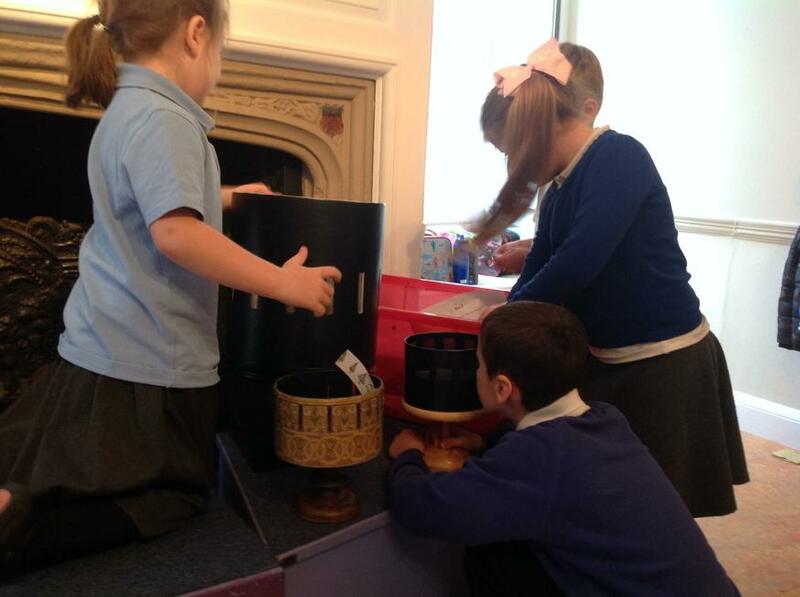 We have been travelling in our 'time and place machine' during our topic this term. 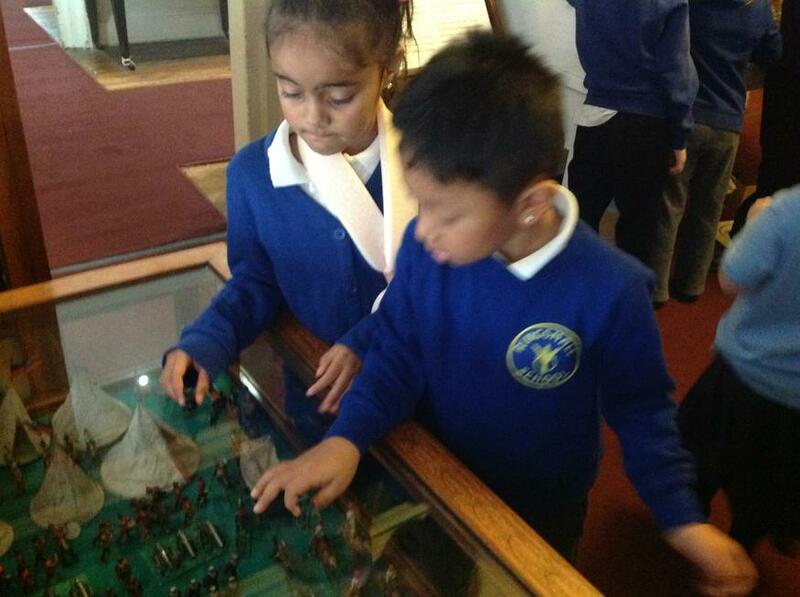 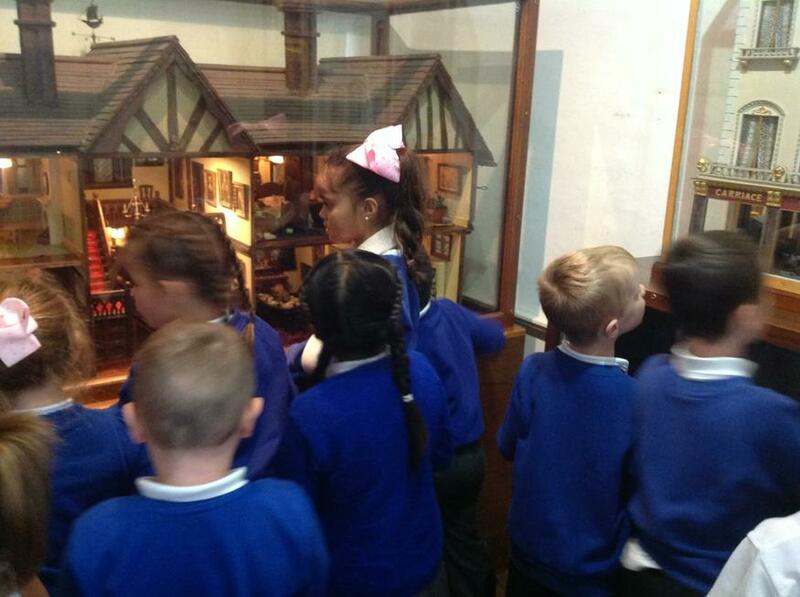 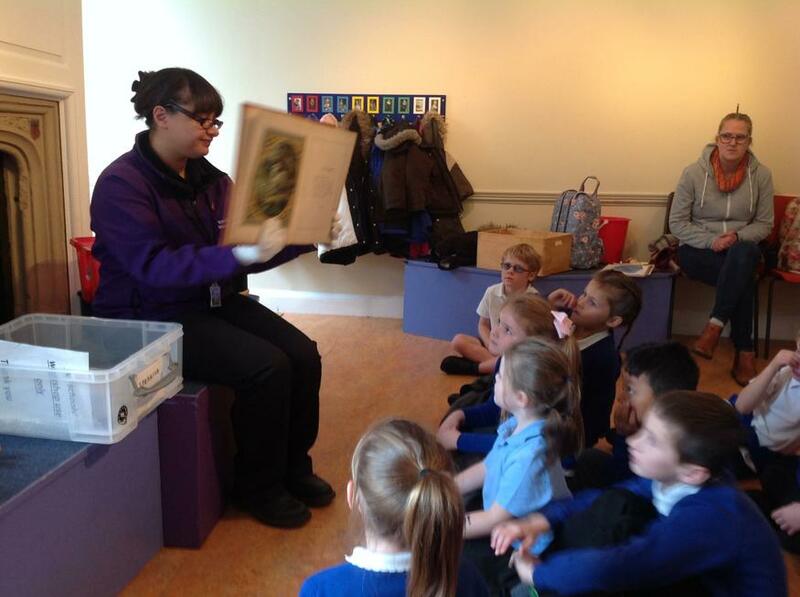 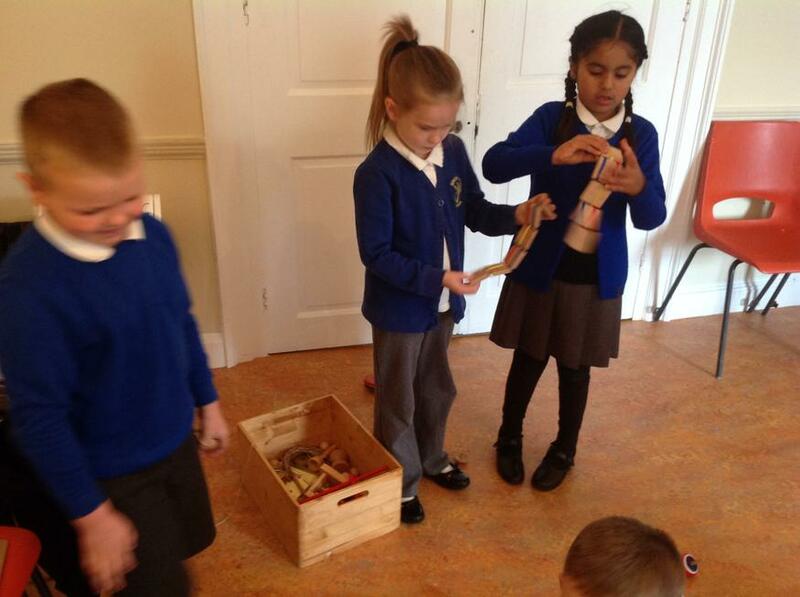 We went on a trip to the museum to explore items from the past. 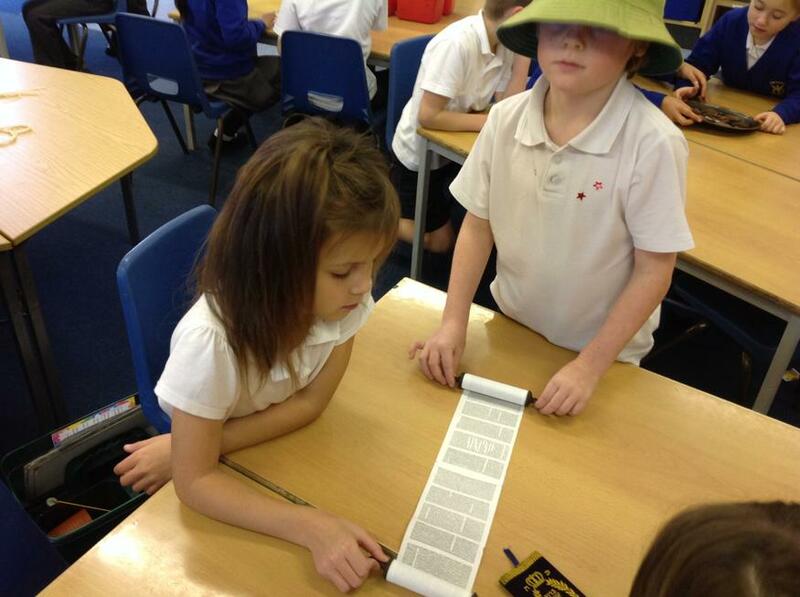 We had to look carefully, think about which were the oldest and which were the newest and explain why we thought this.